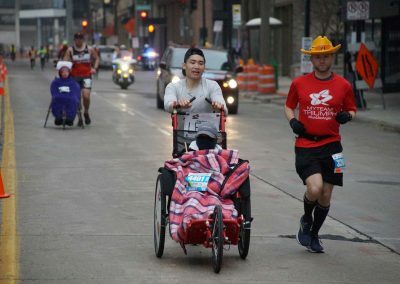 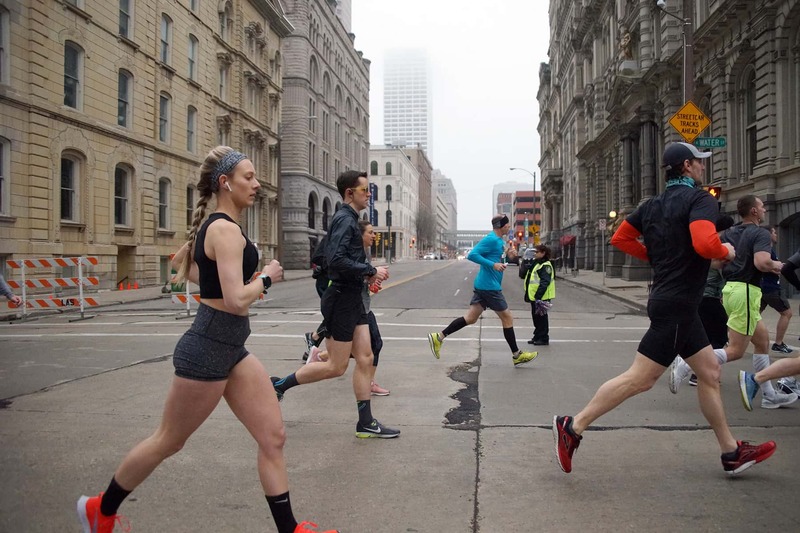 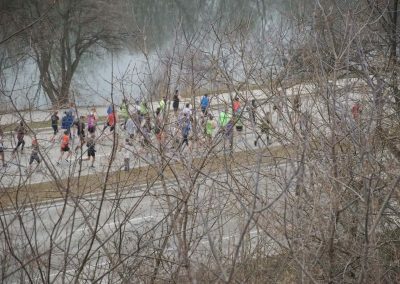 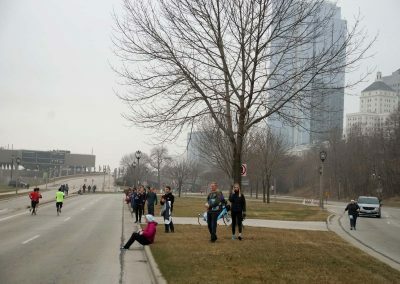 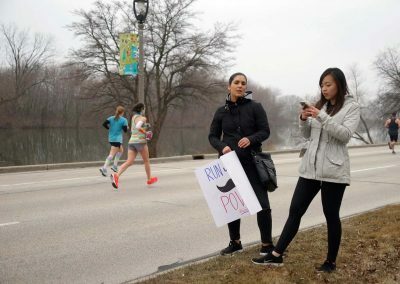 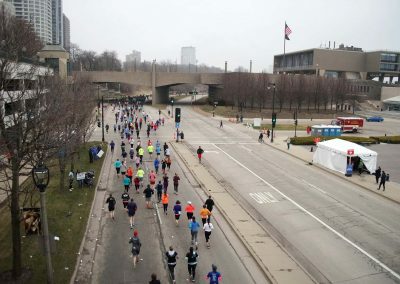 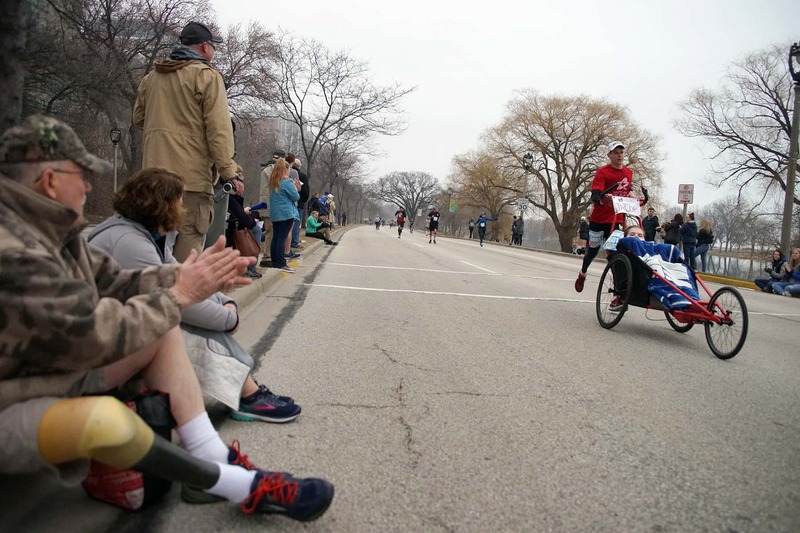 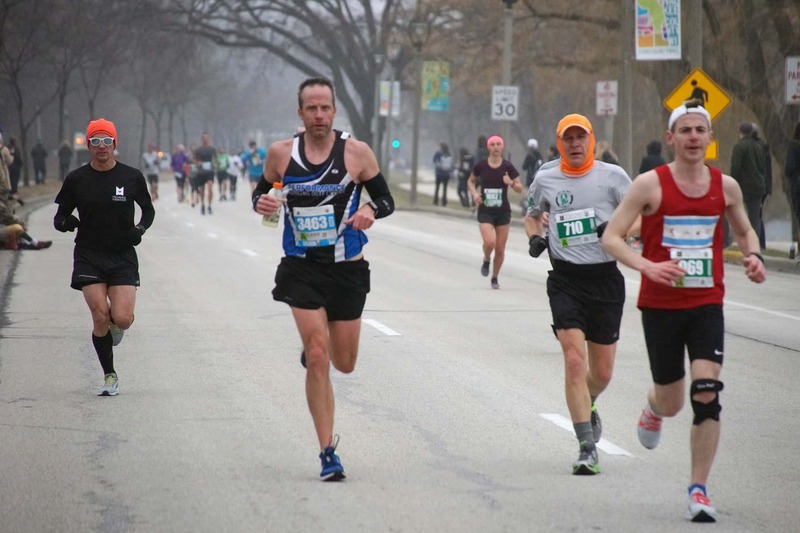 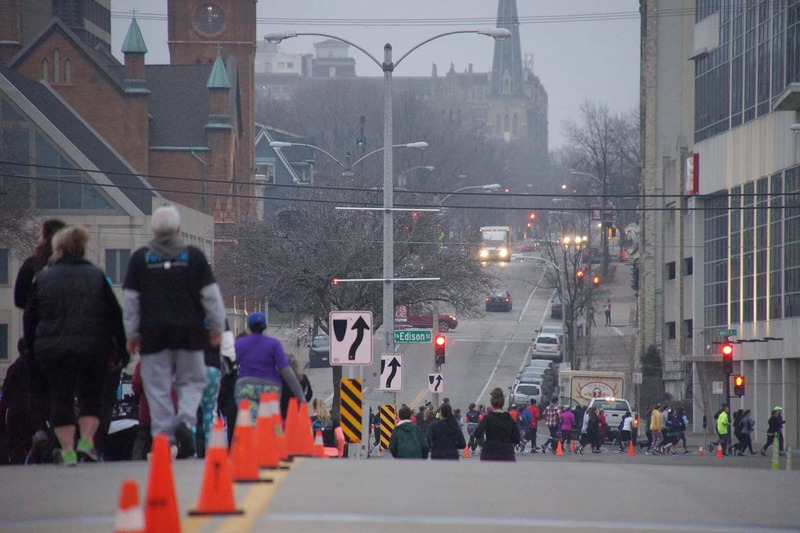 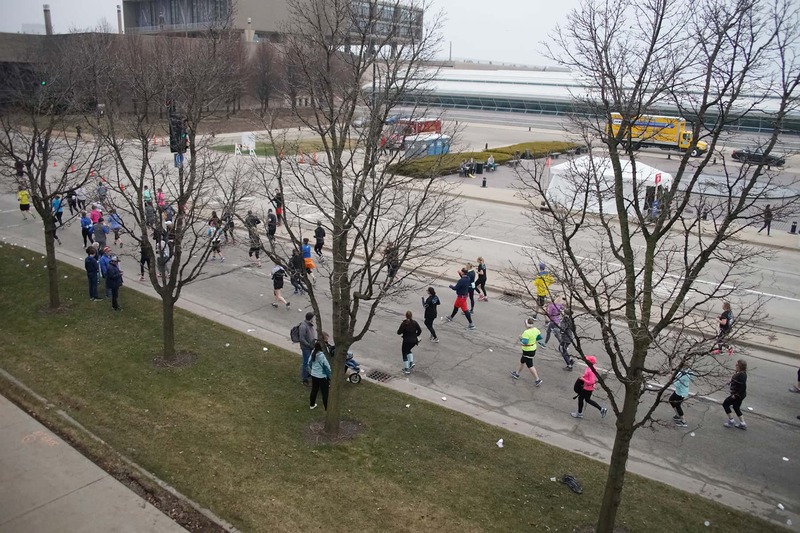 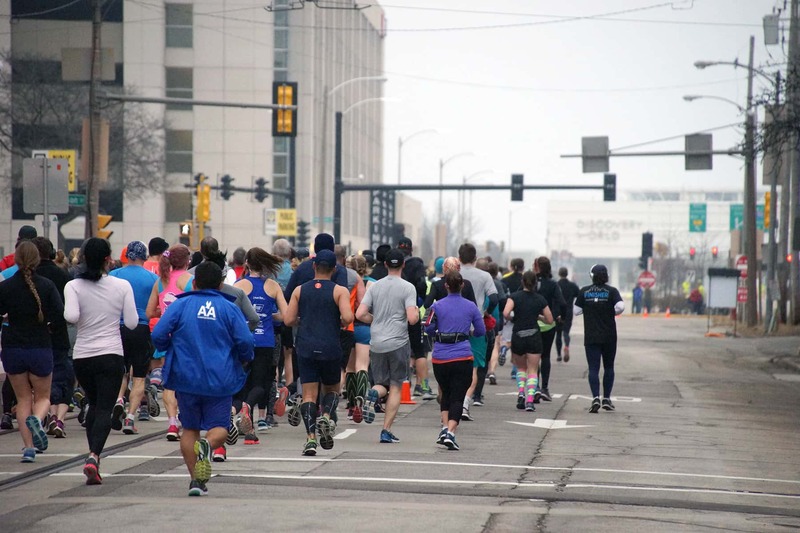 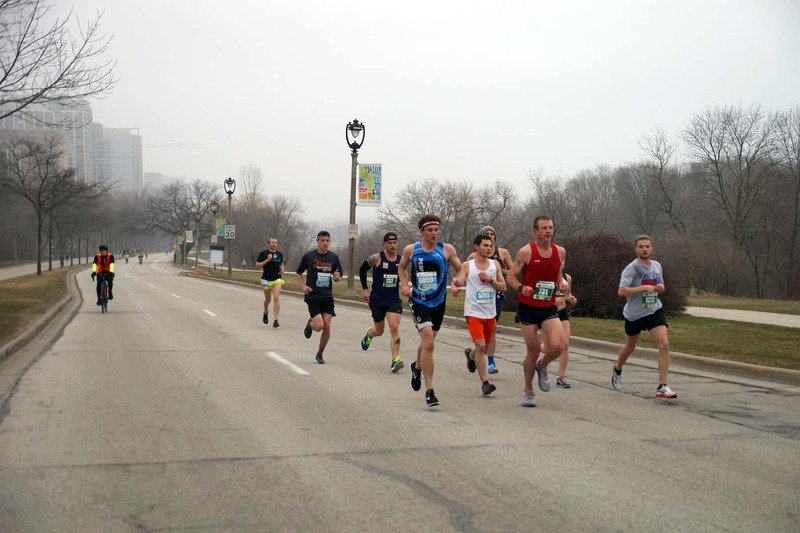 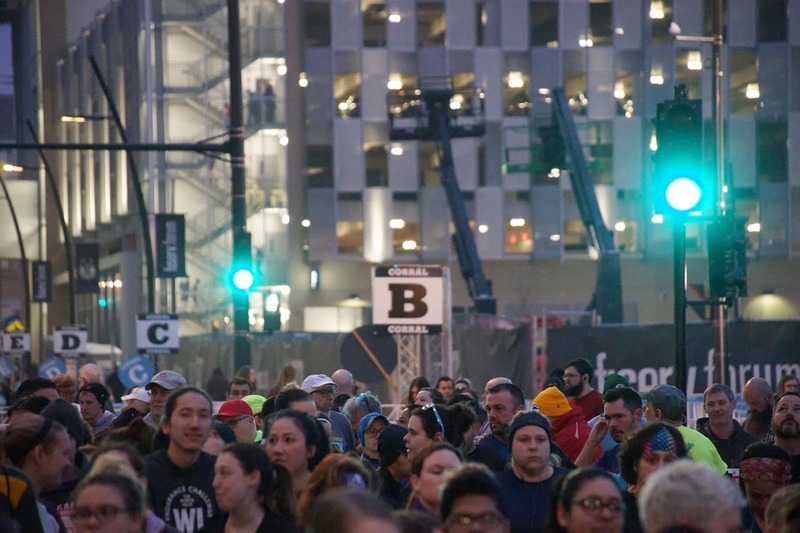 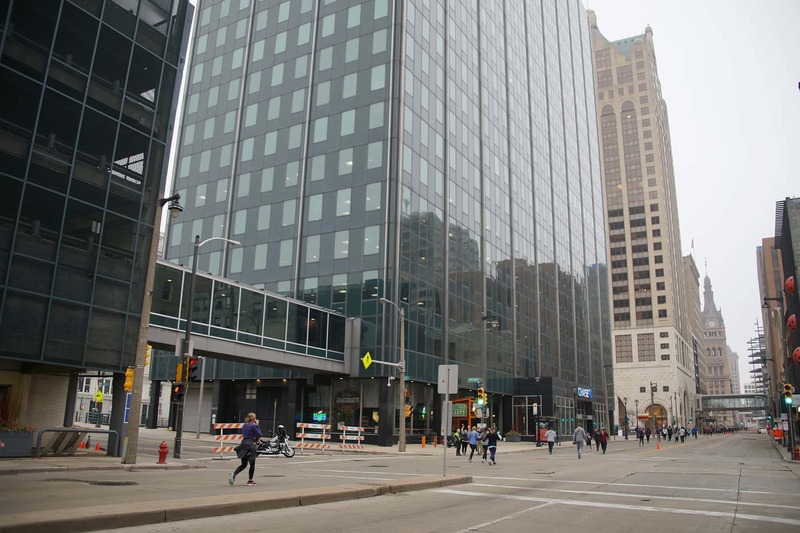 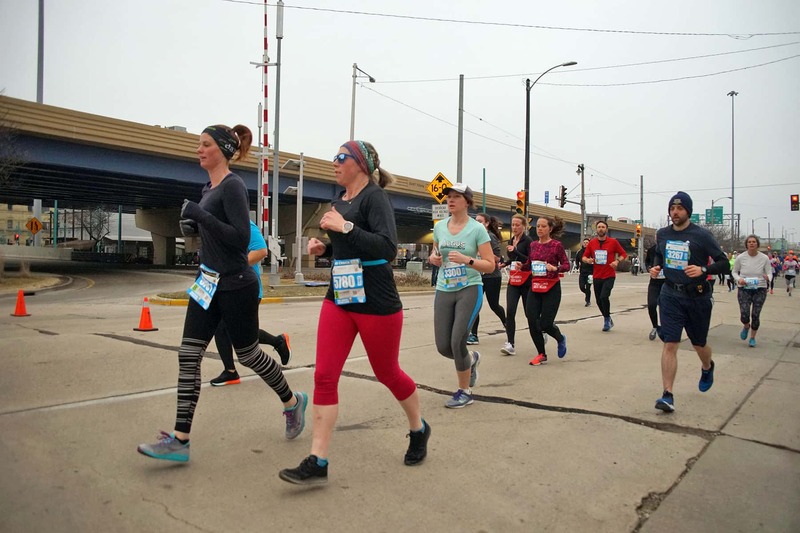 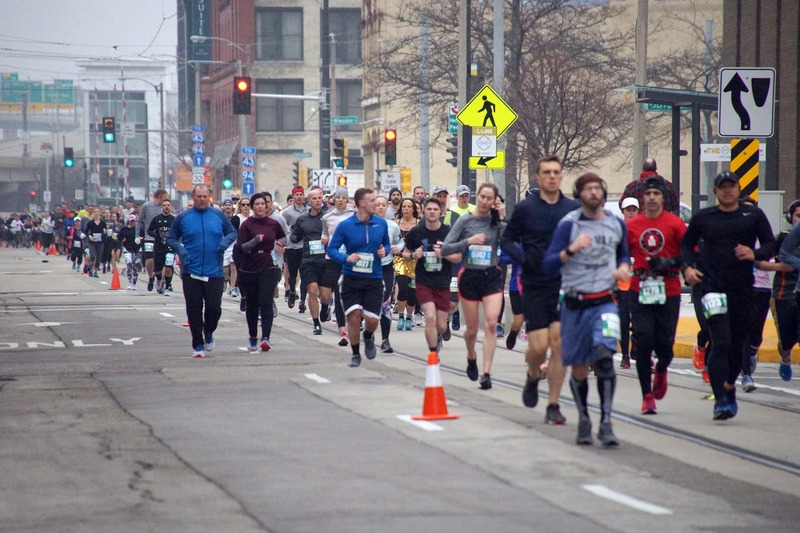 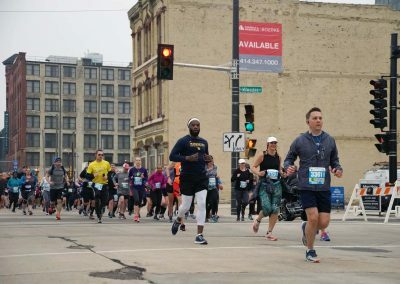 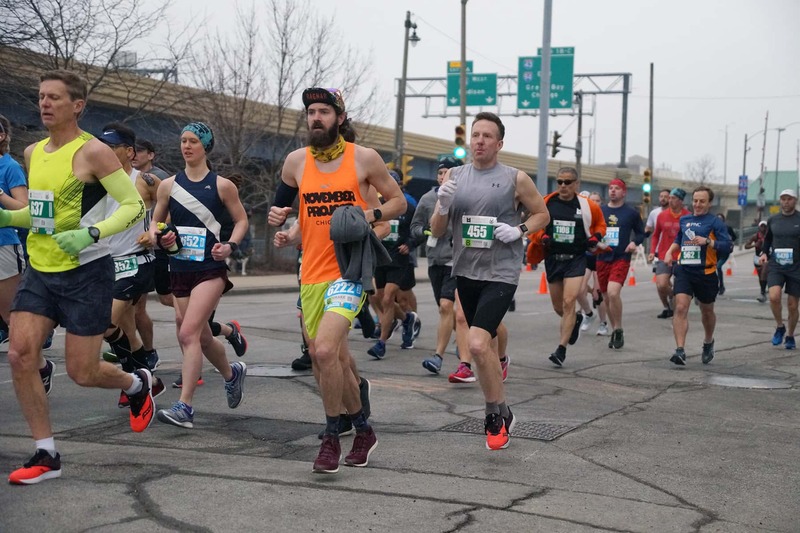 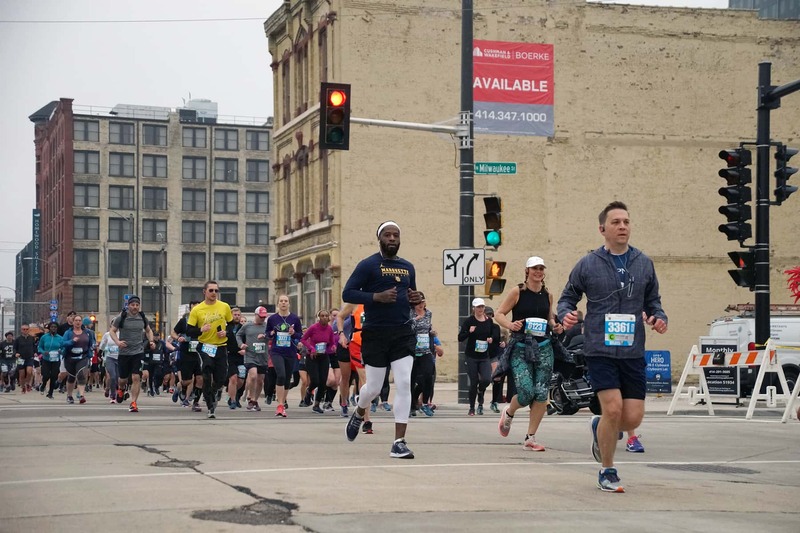 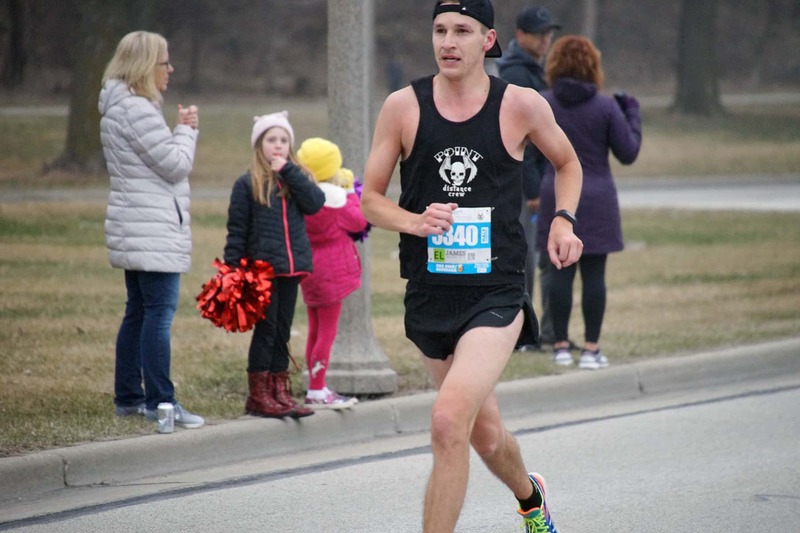 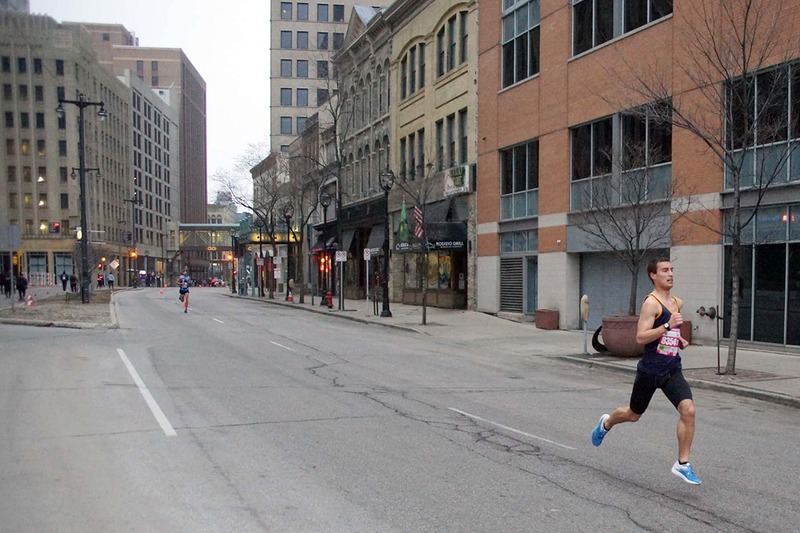 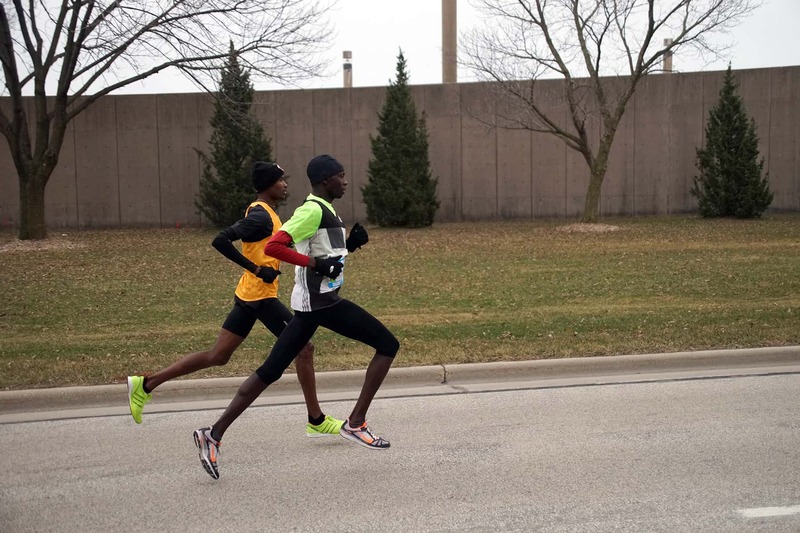 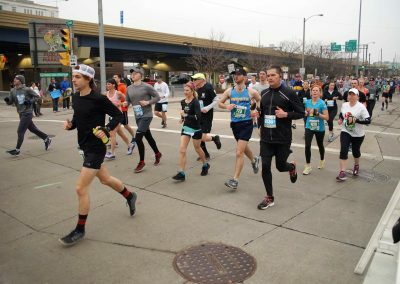 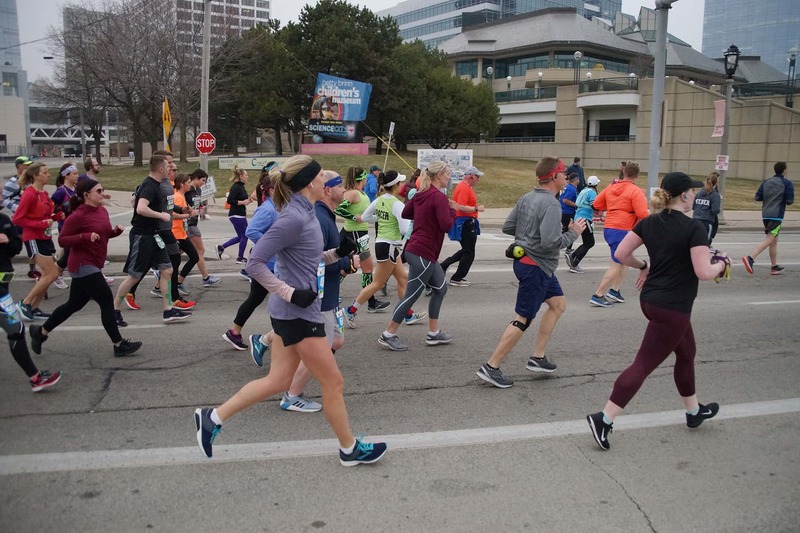 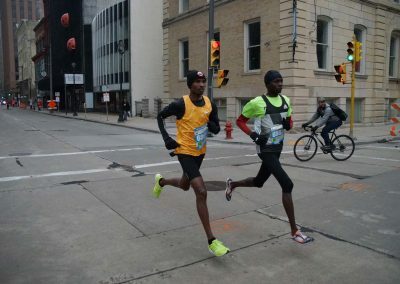 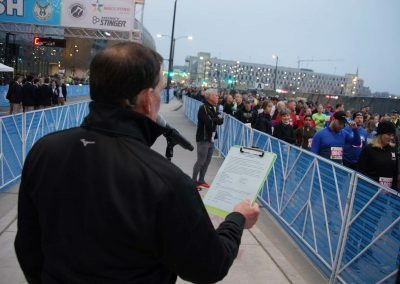 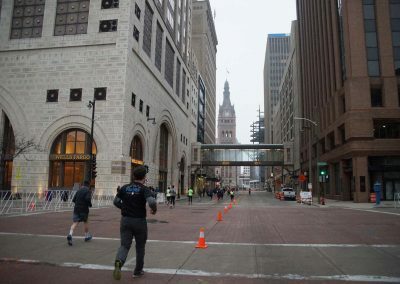 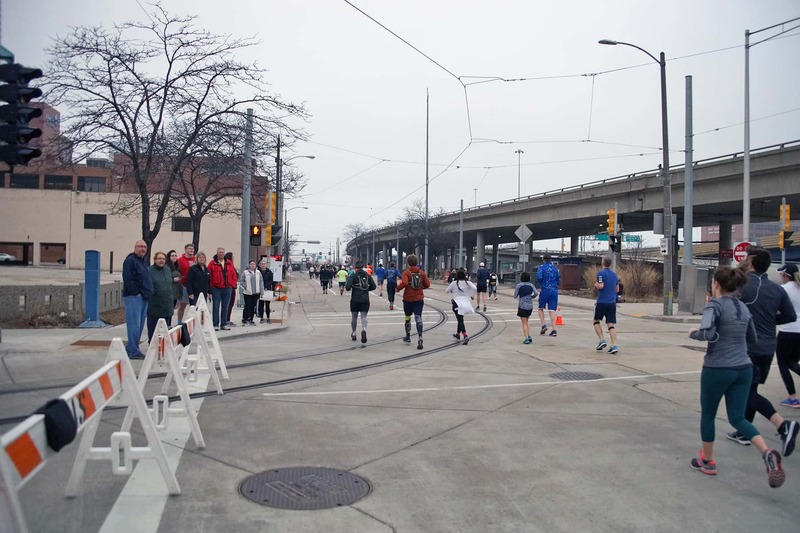 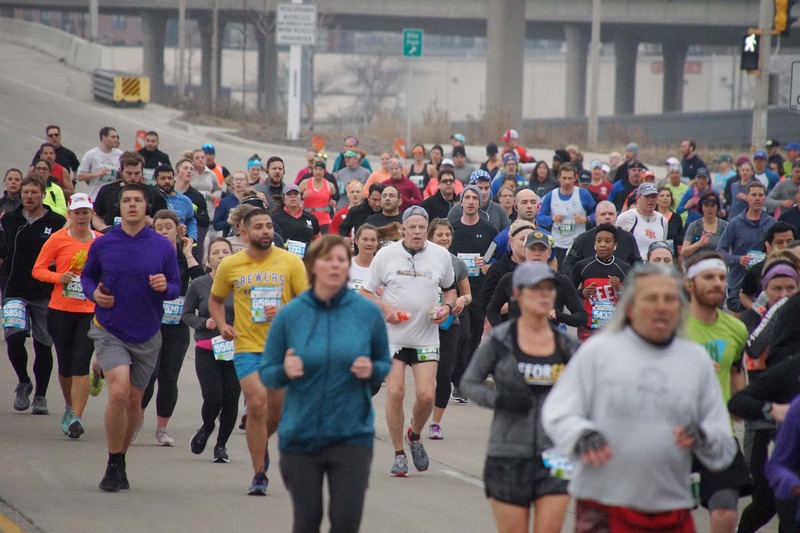 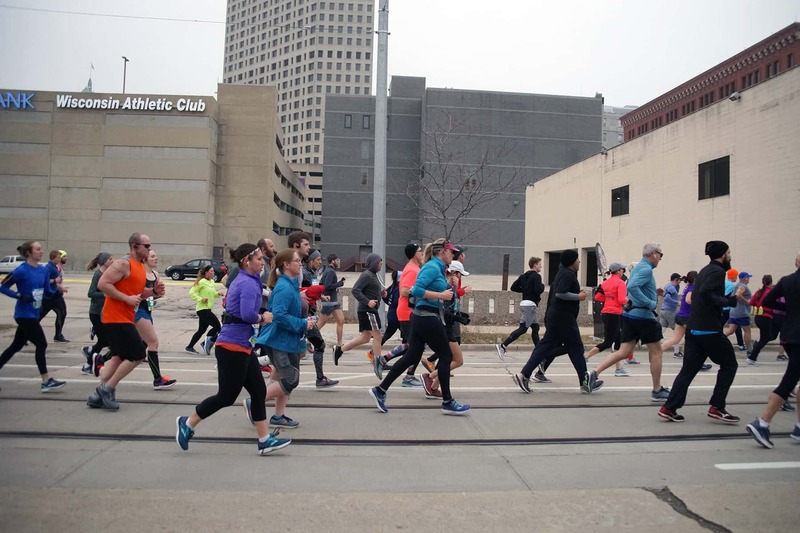 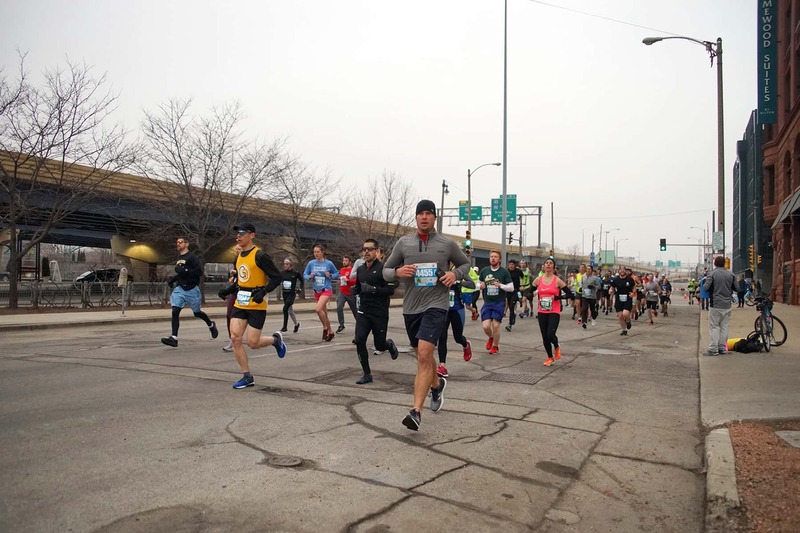 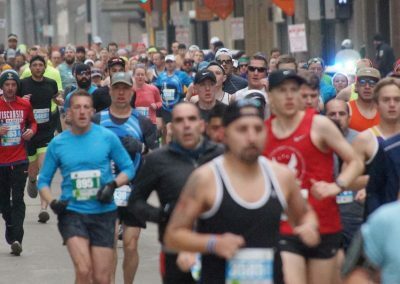 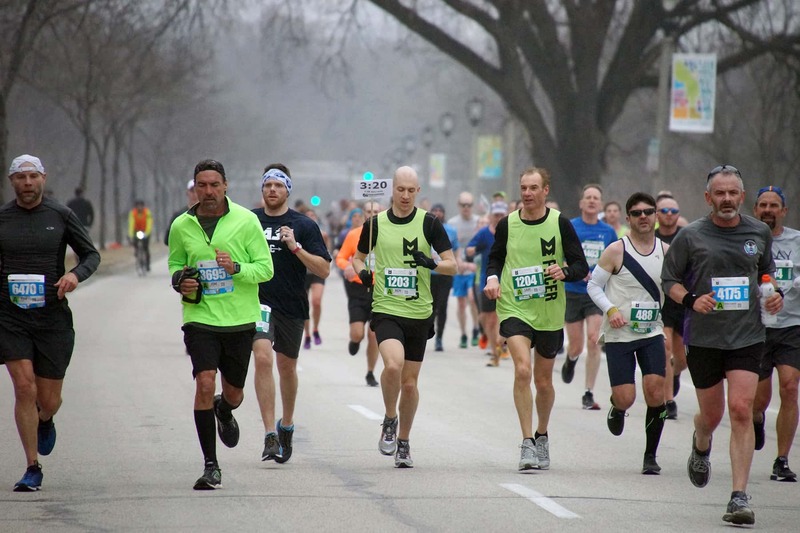 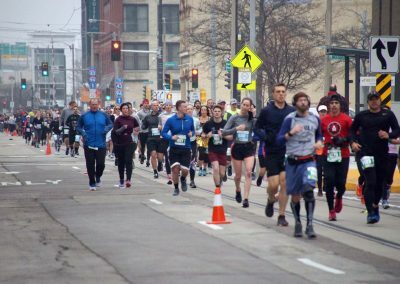 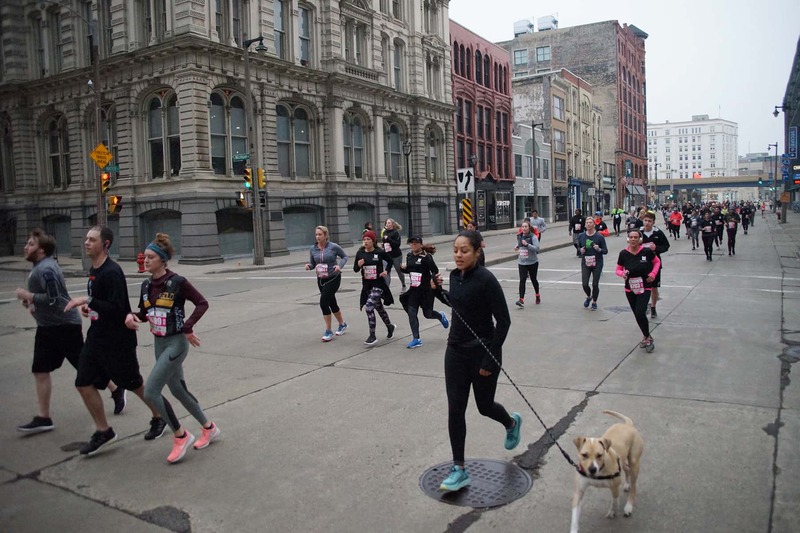 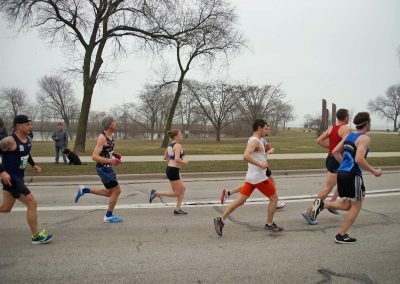 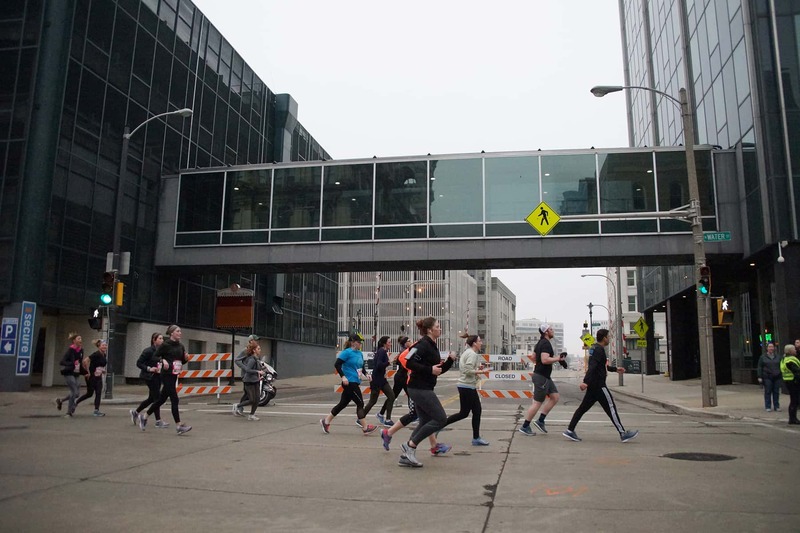 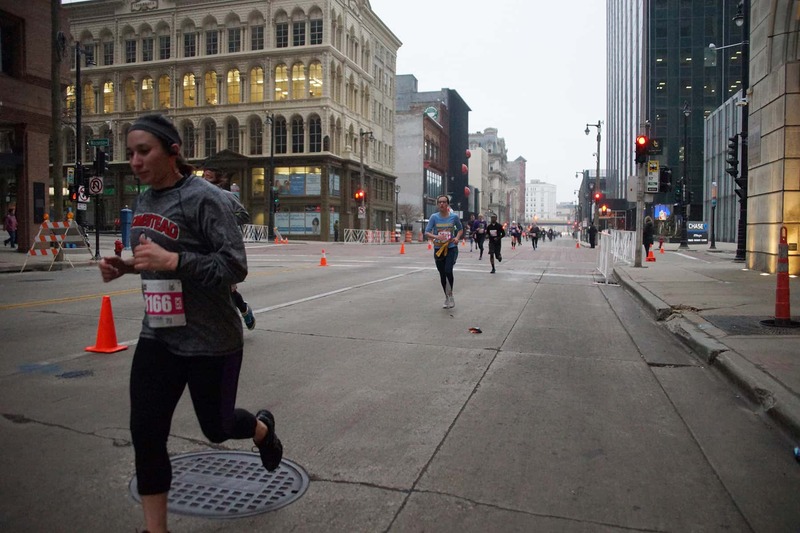 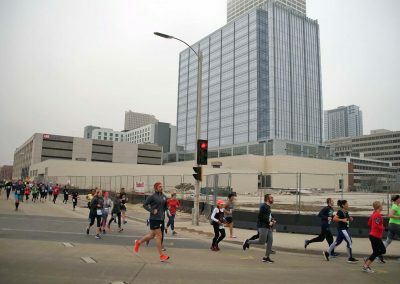 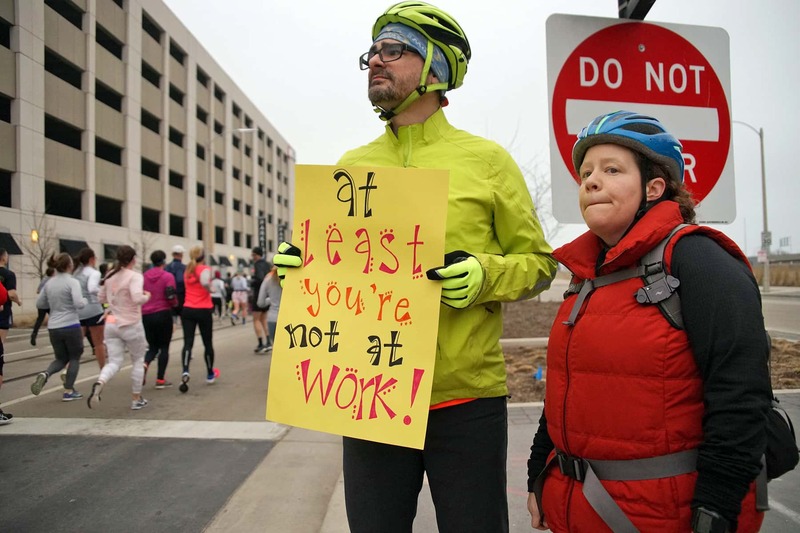 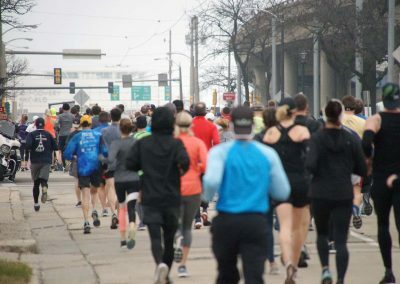 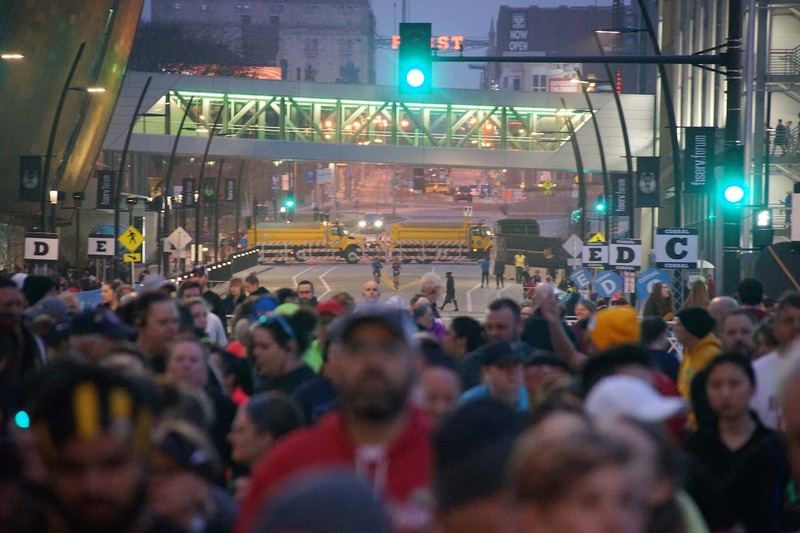 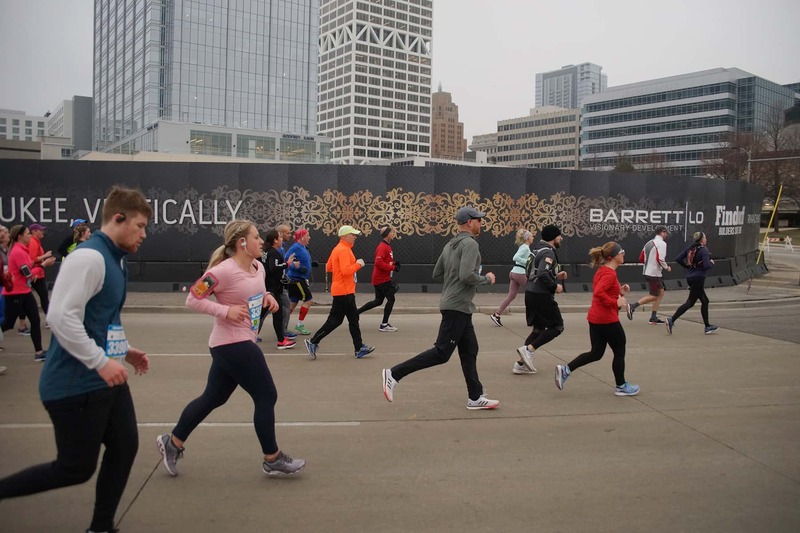 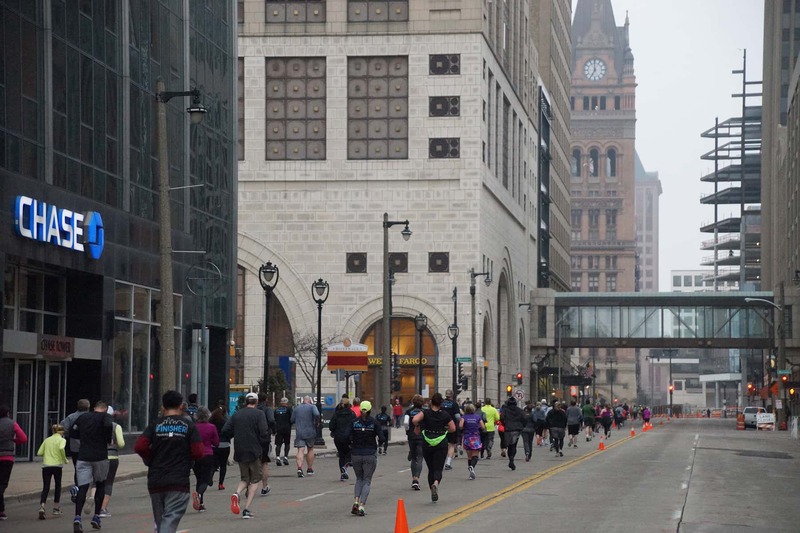 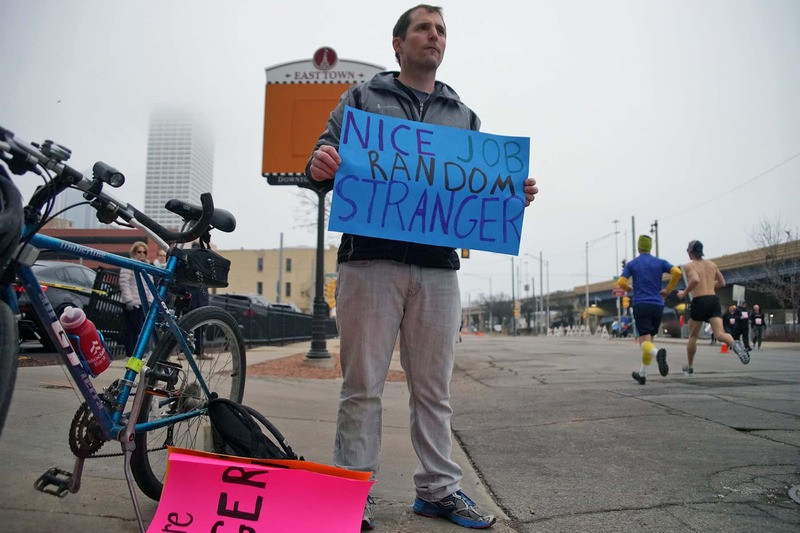 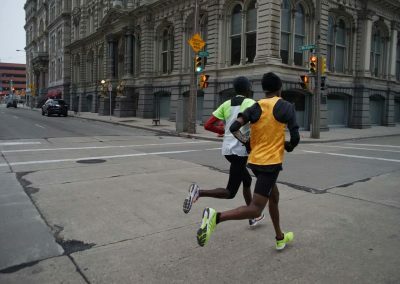 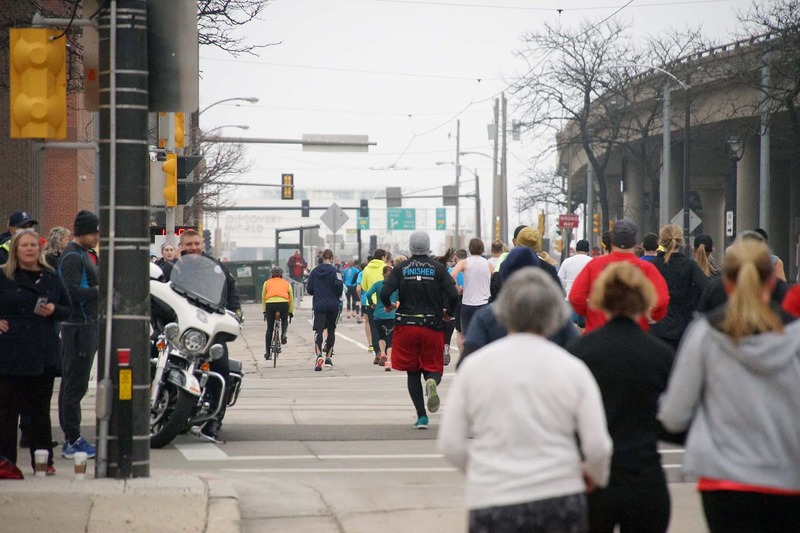 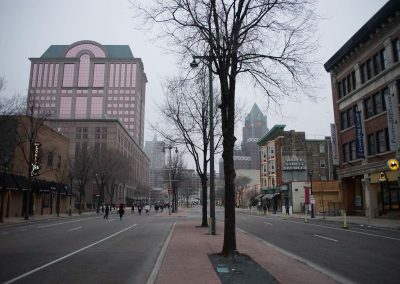 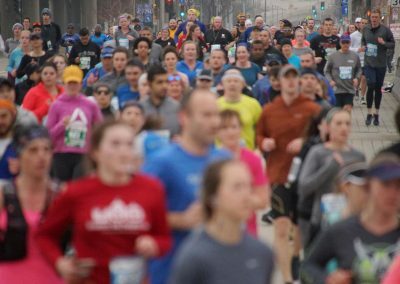 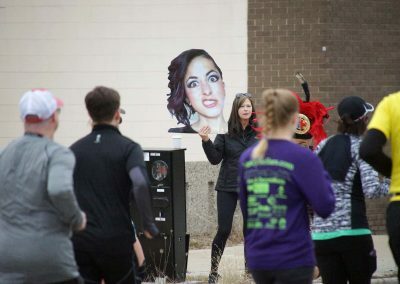 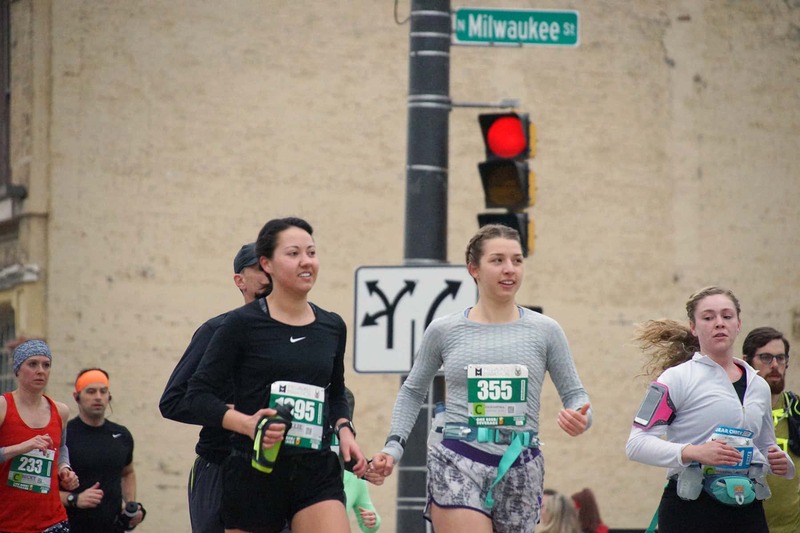 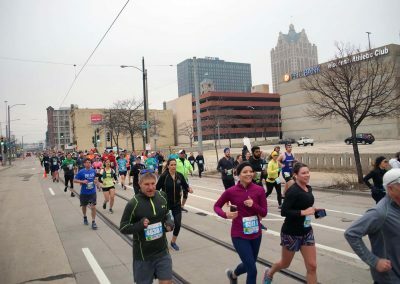 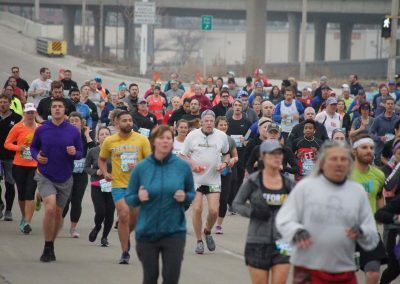 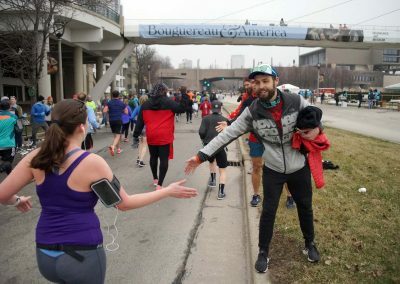 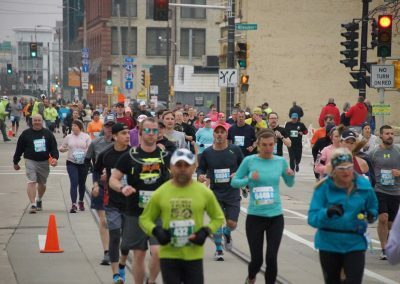 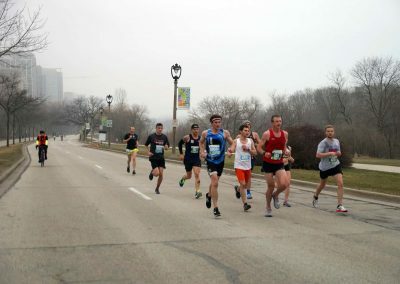 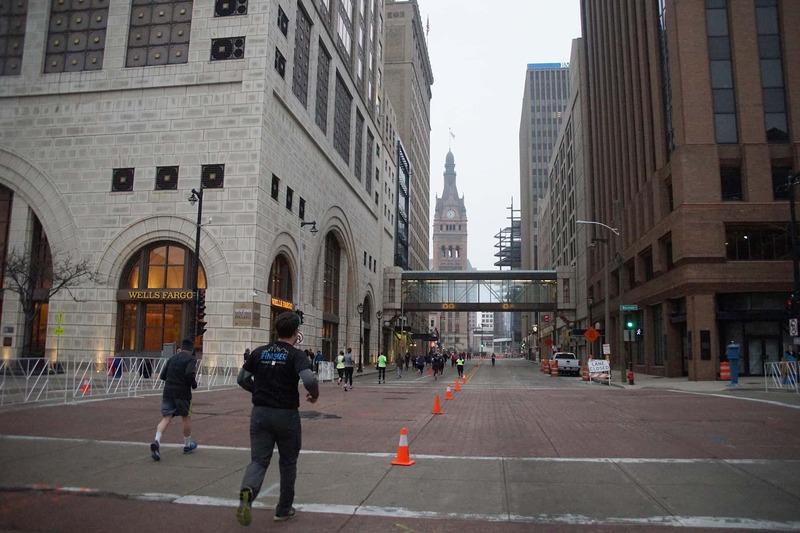 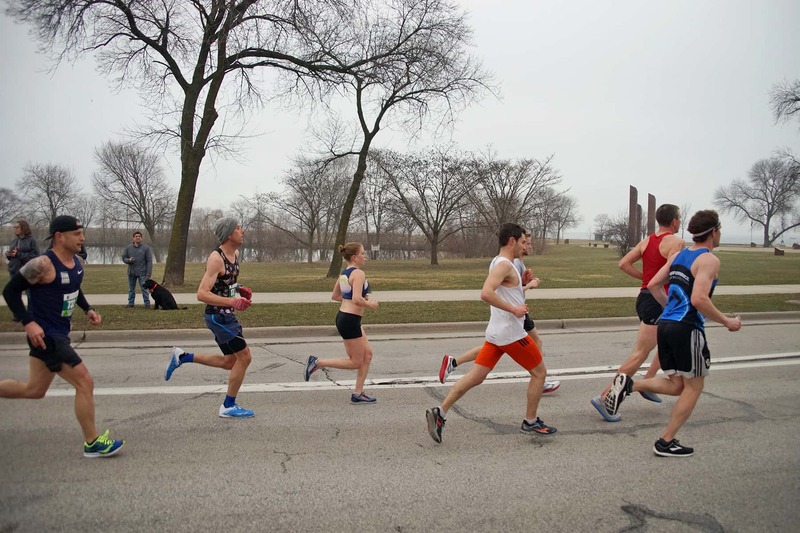 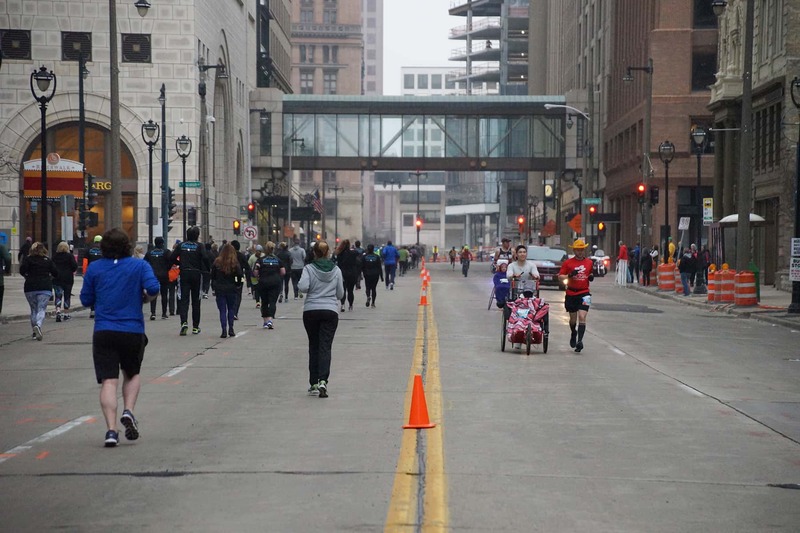 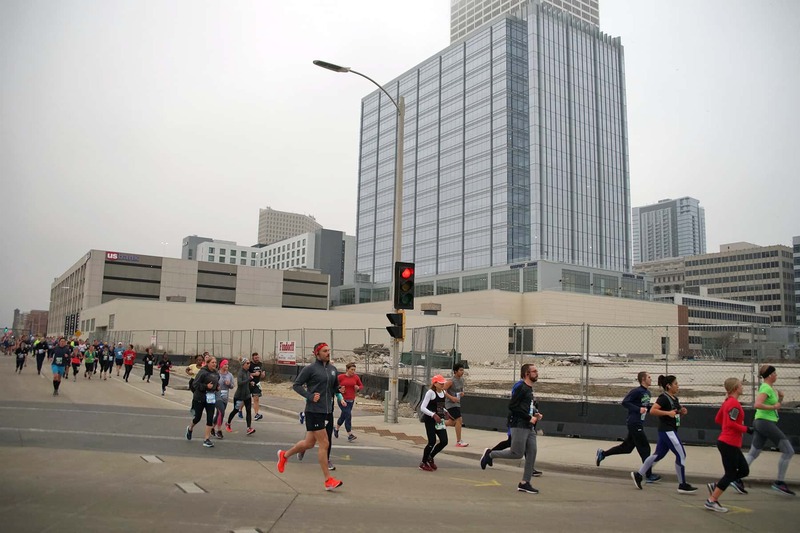 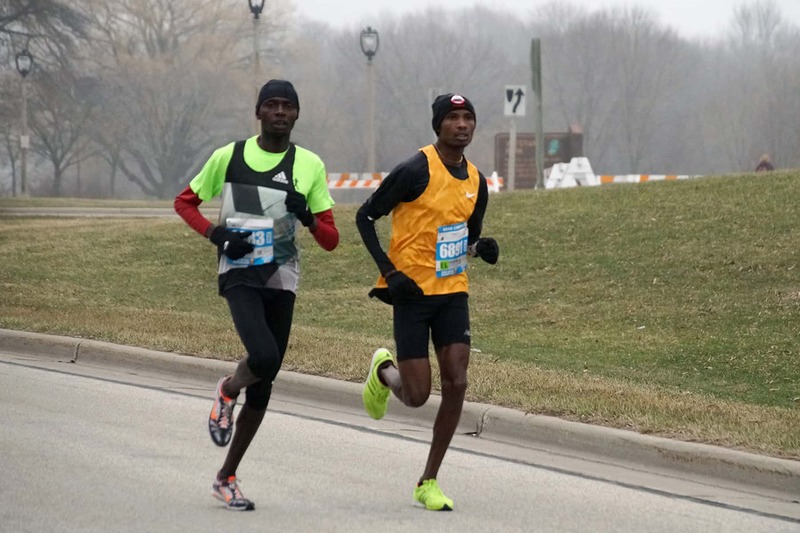 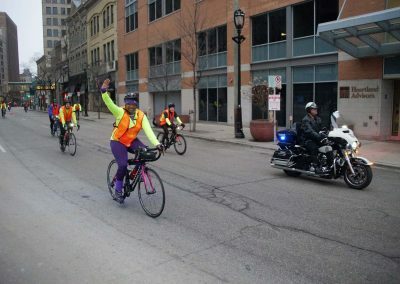 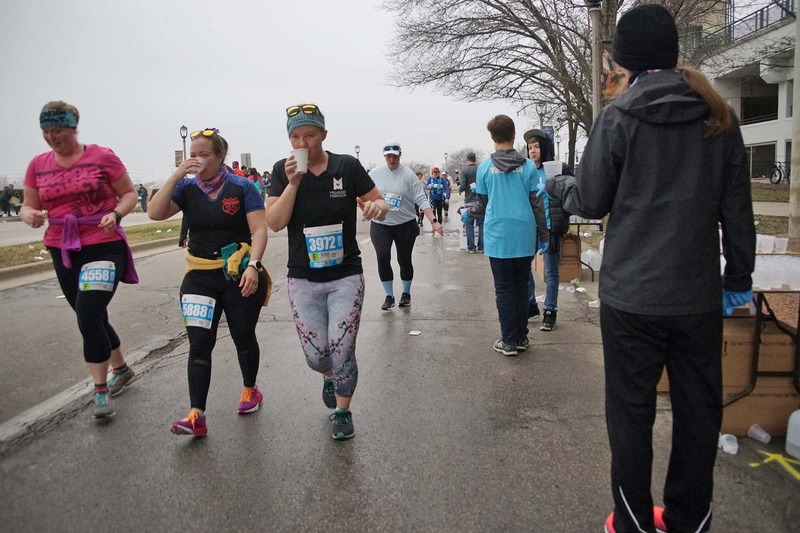 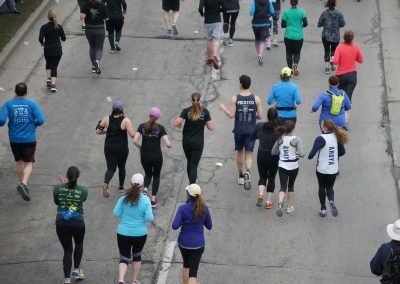 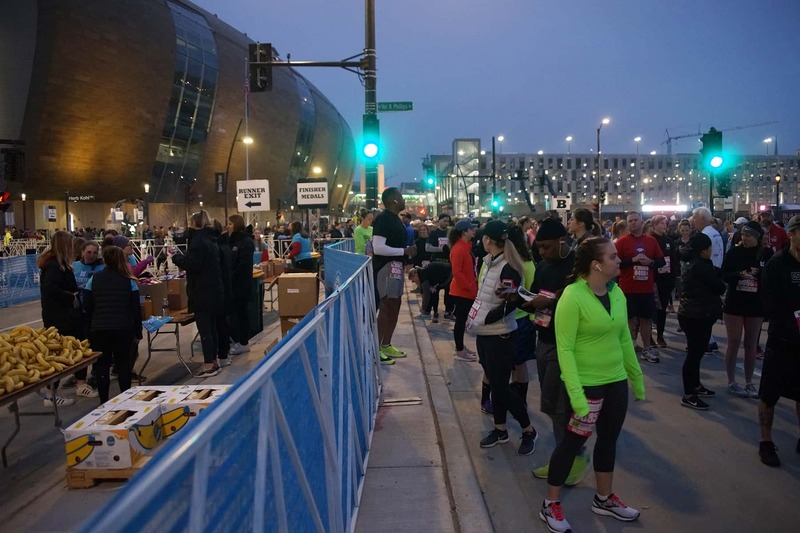 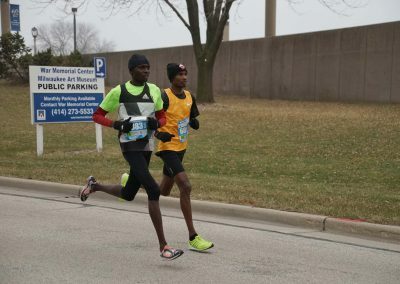 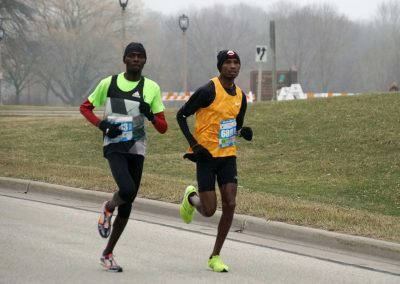 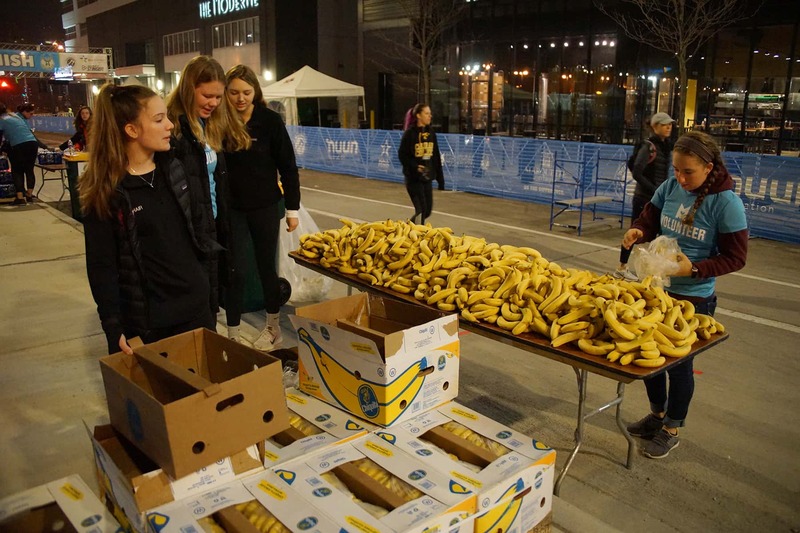 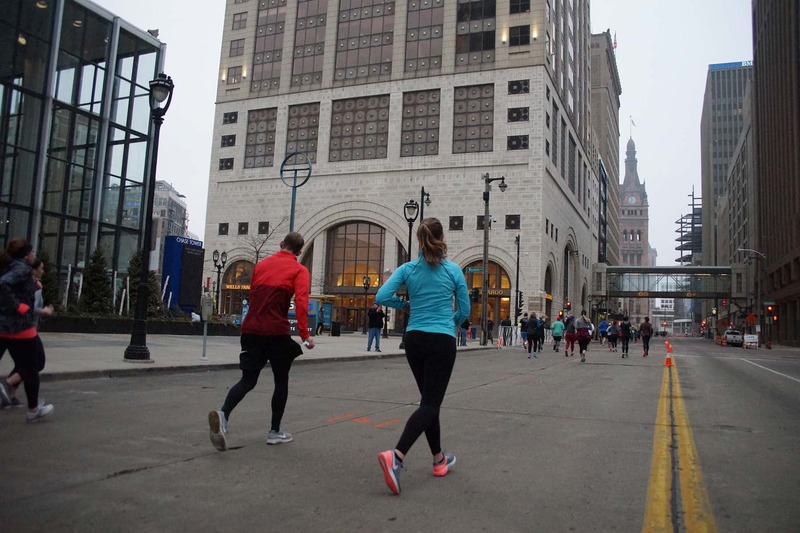 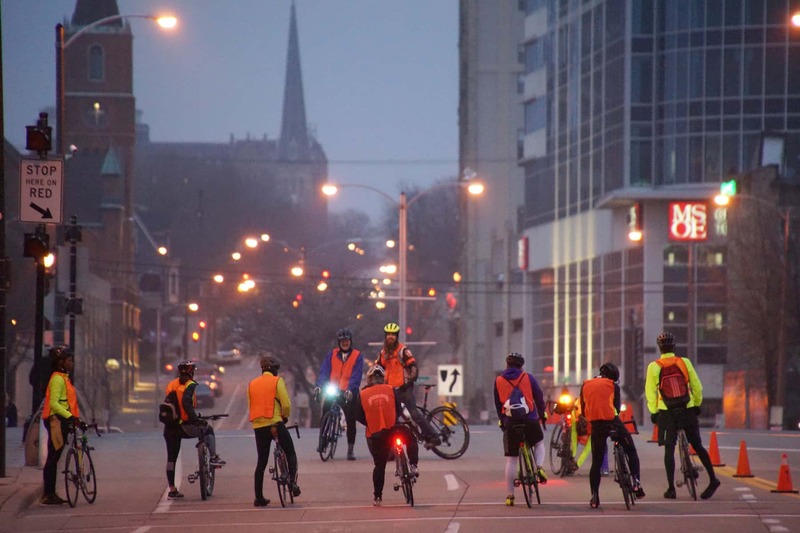 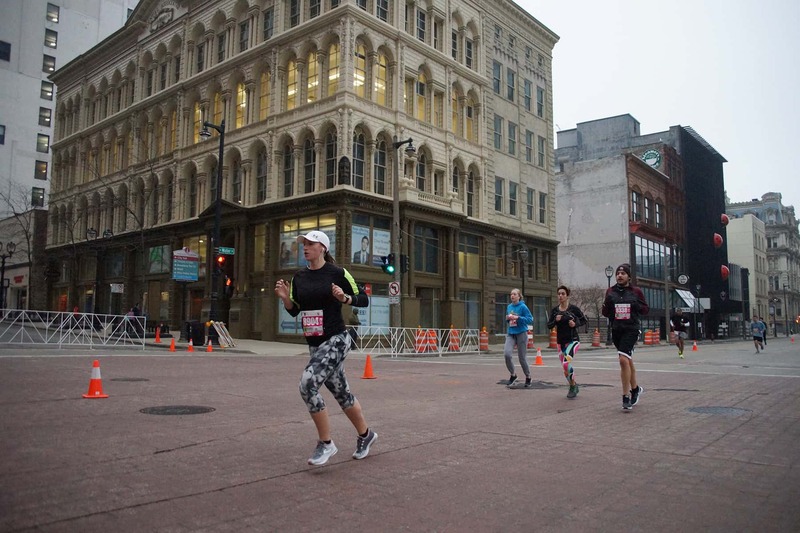 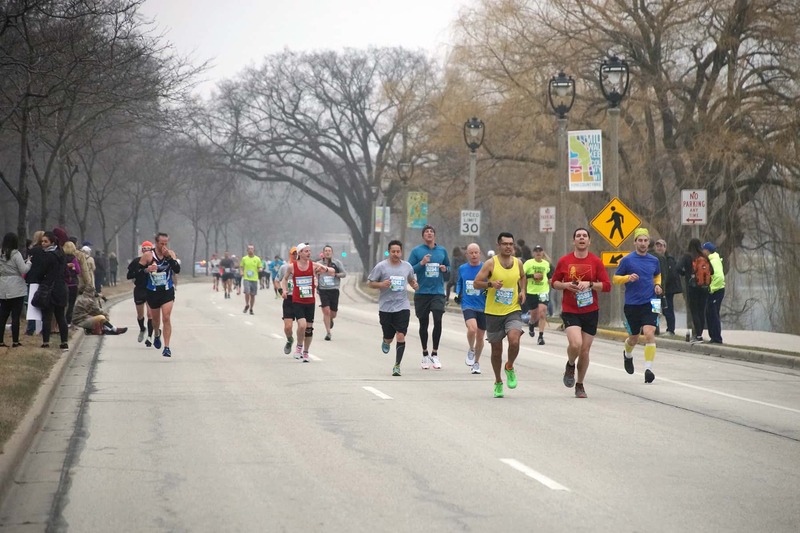 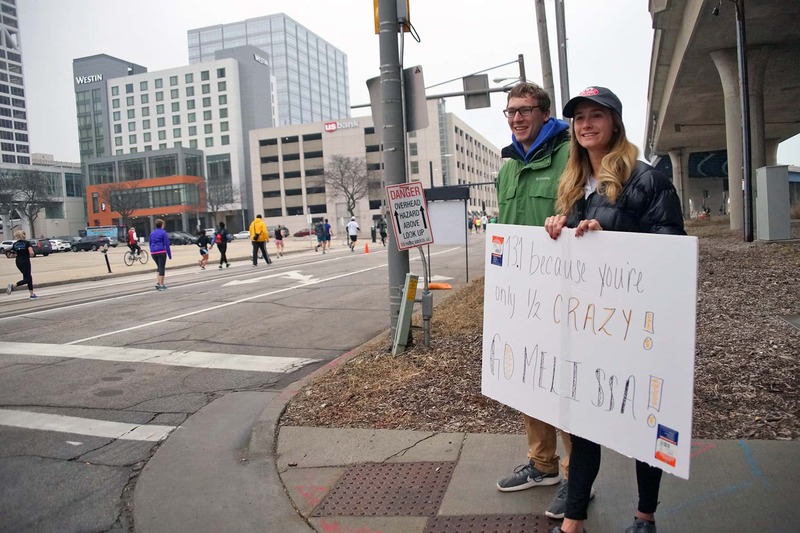 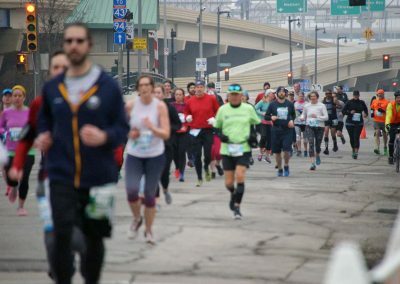 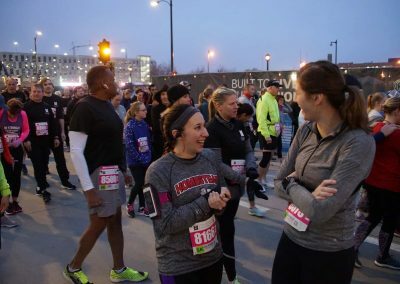 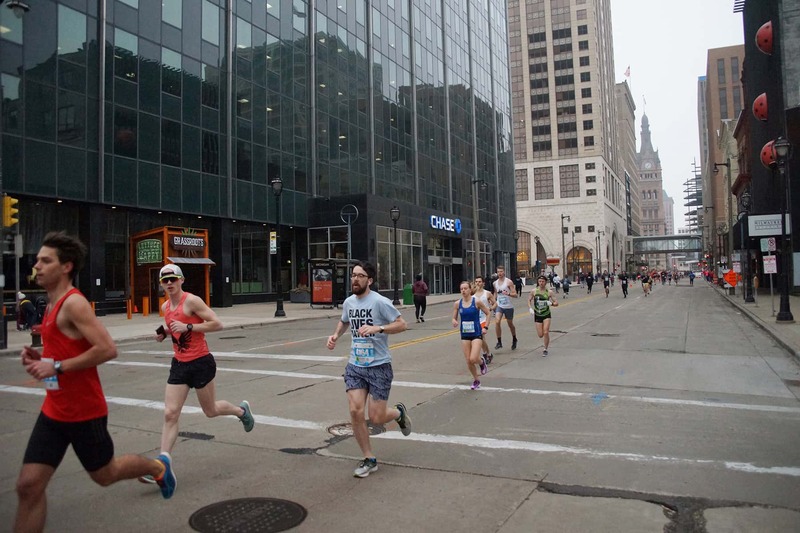 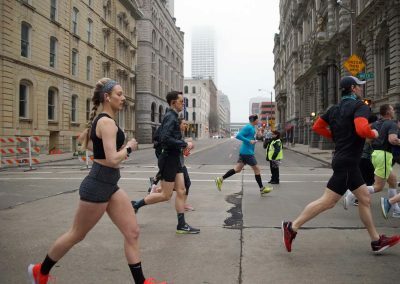 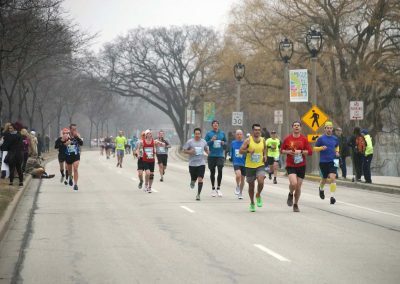 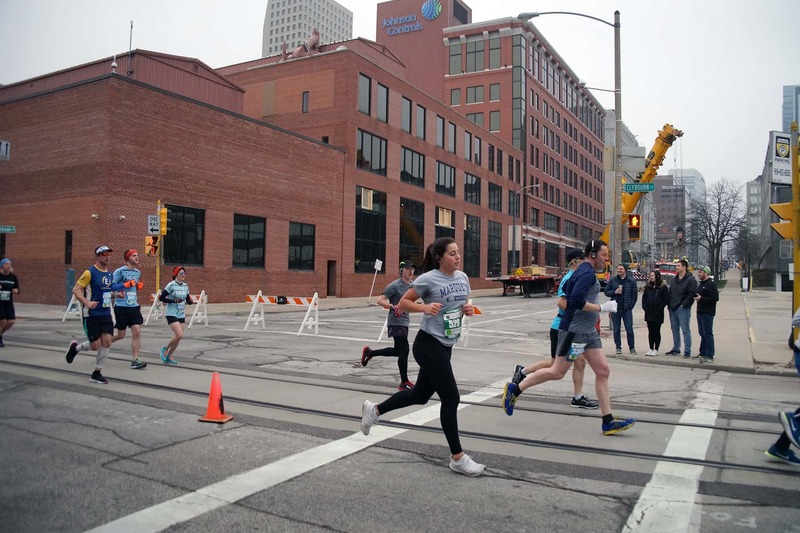 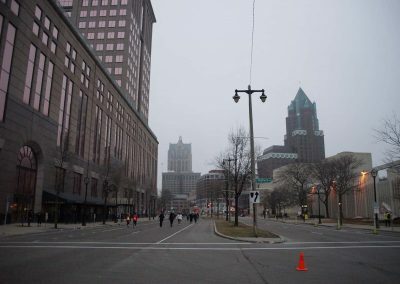 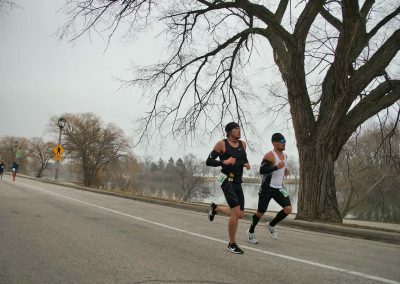 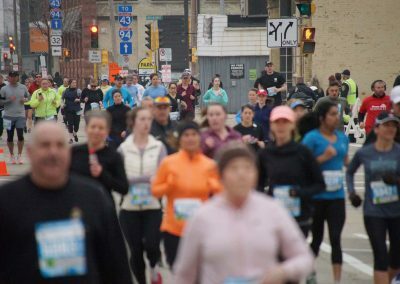 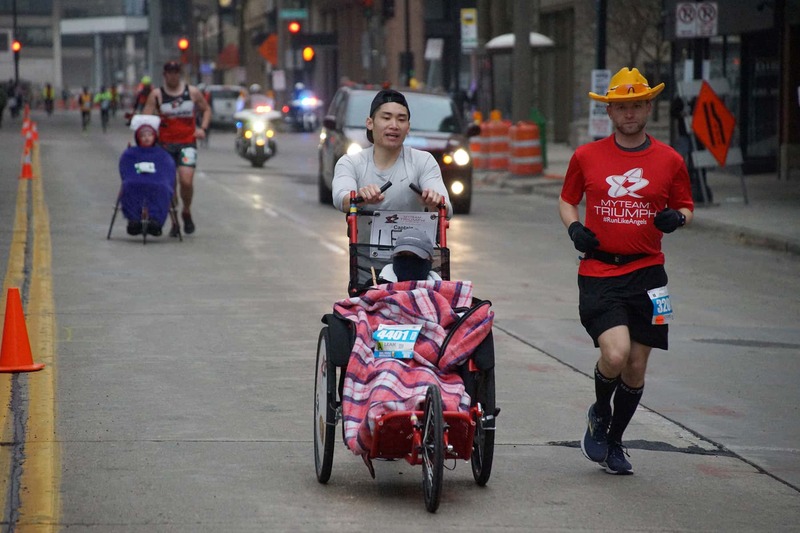 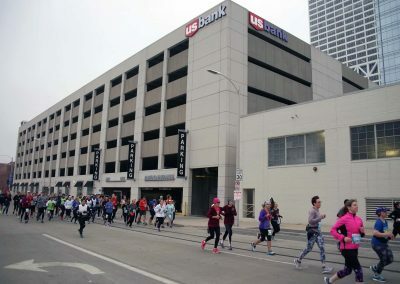 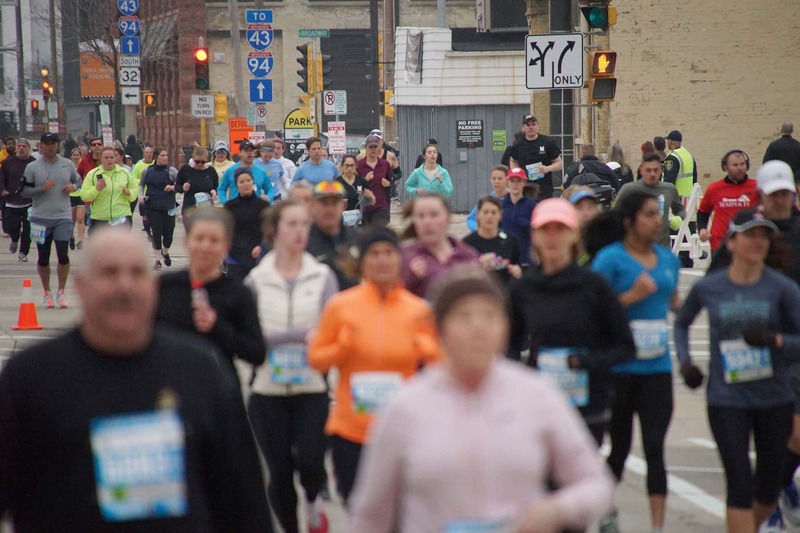 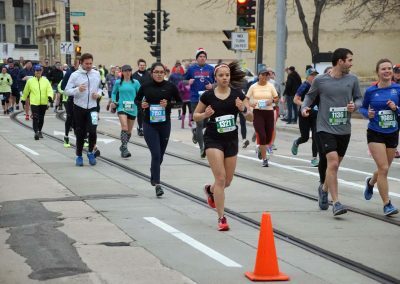 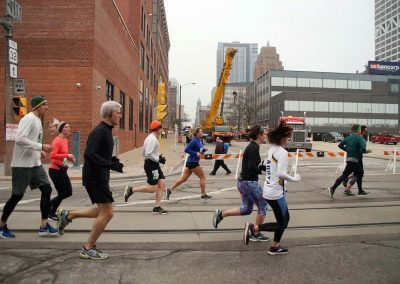 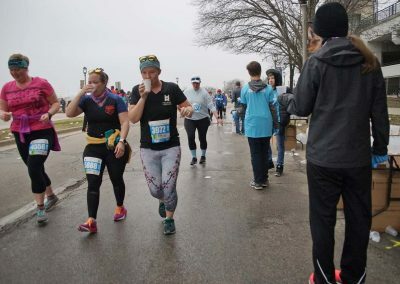 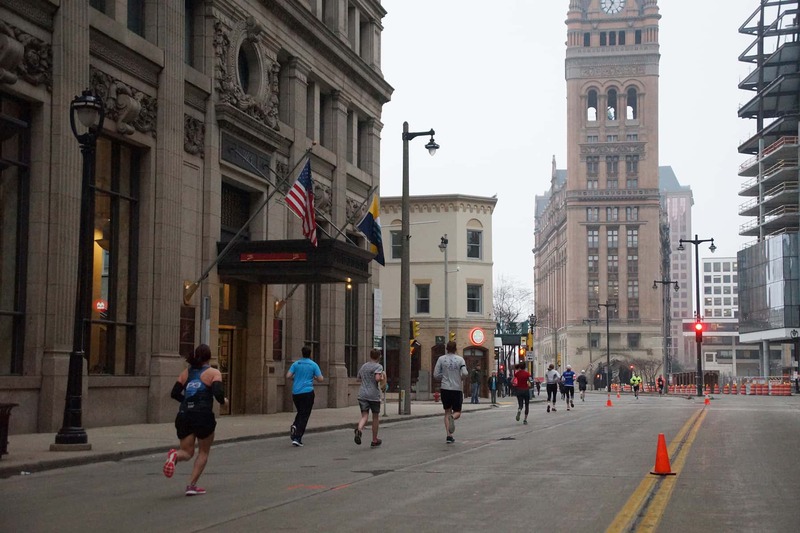 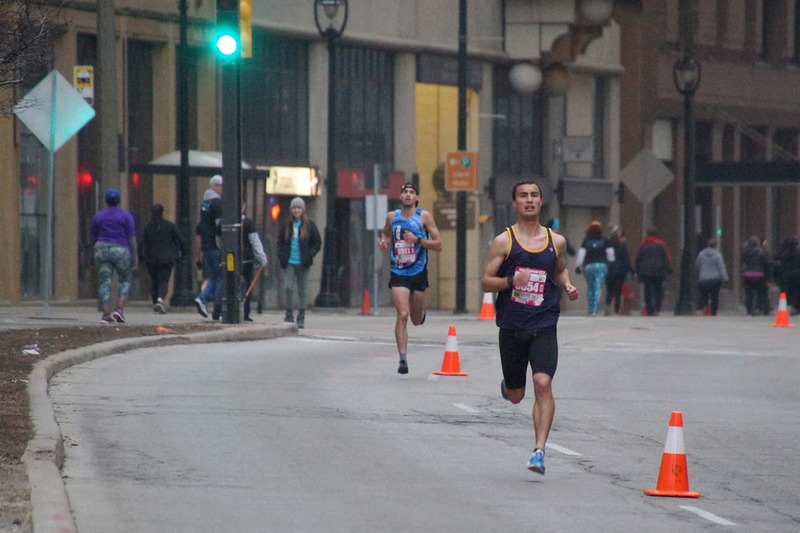 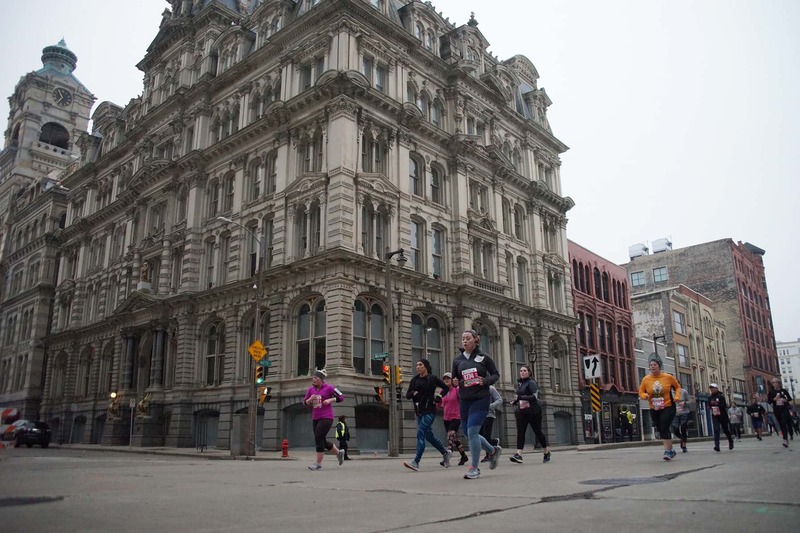 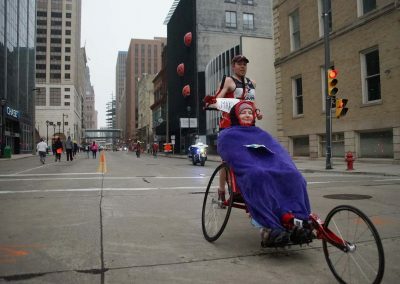 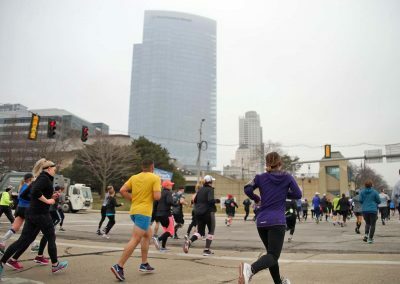 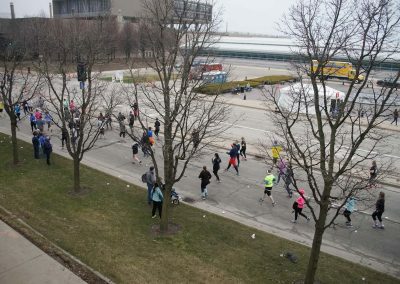 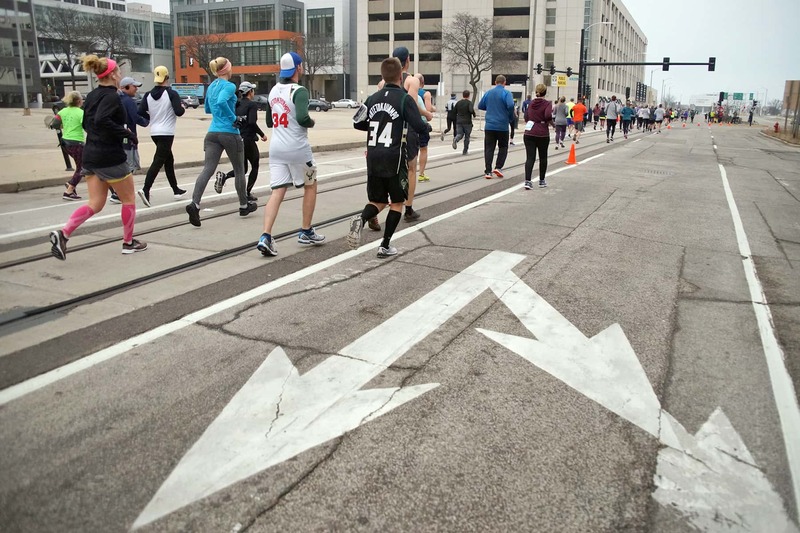 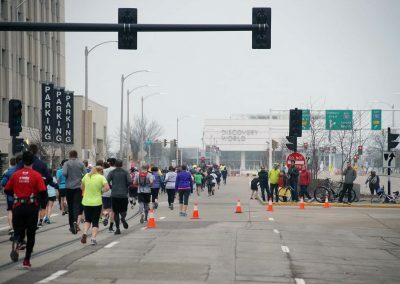 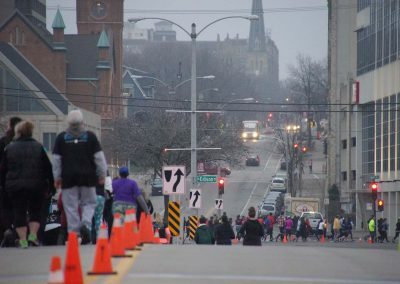 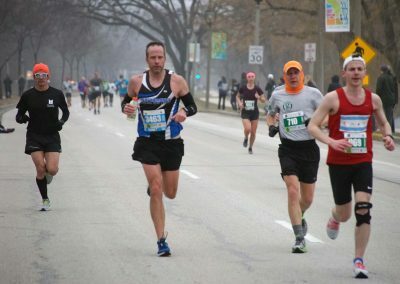 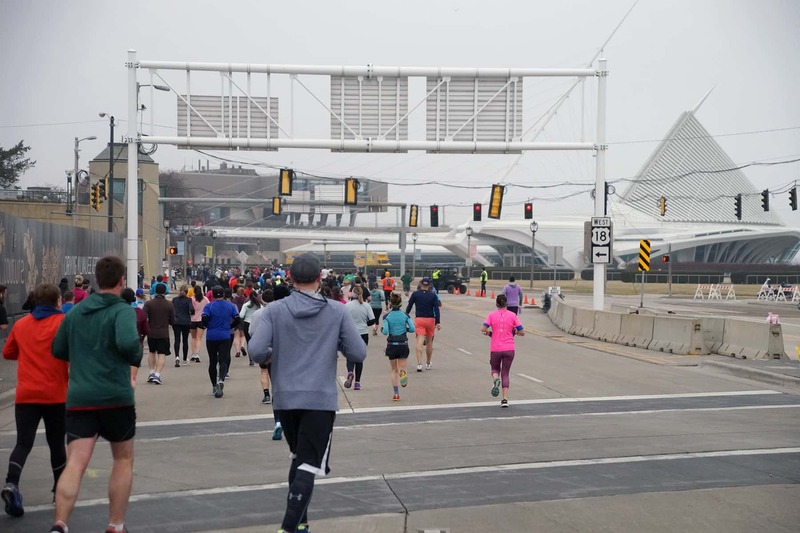 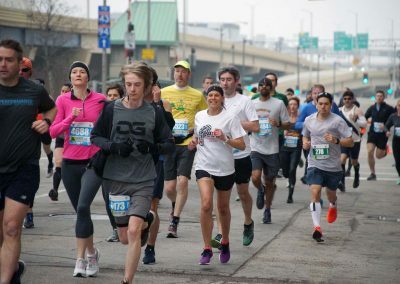 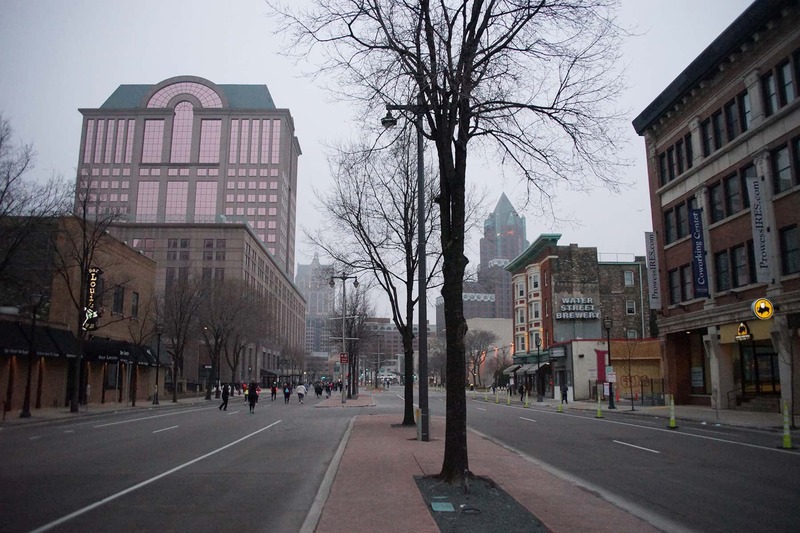 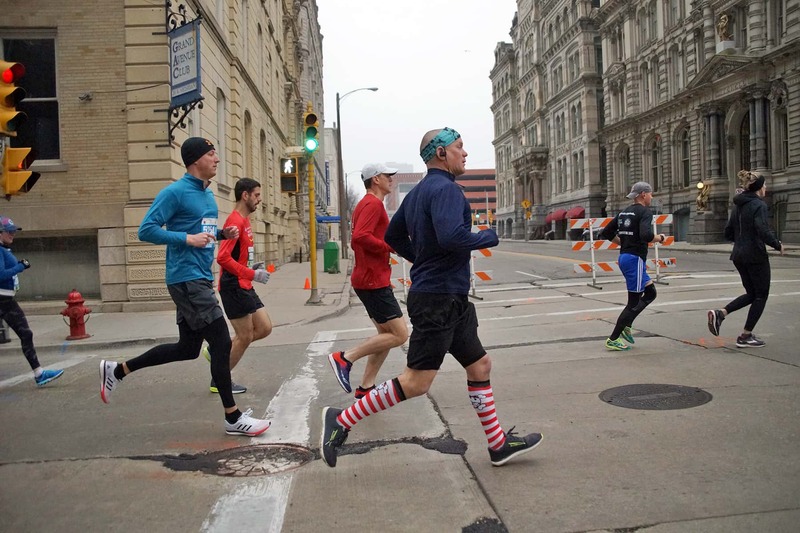 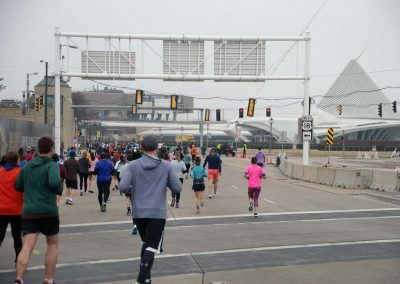 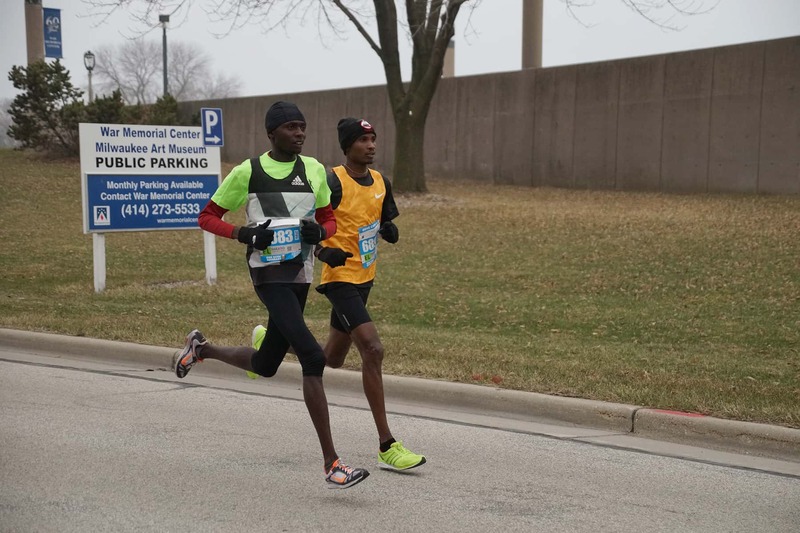 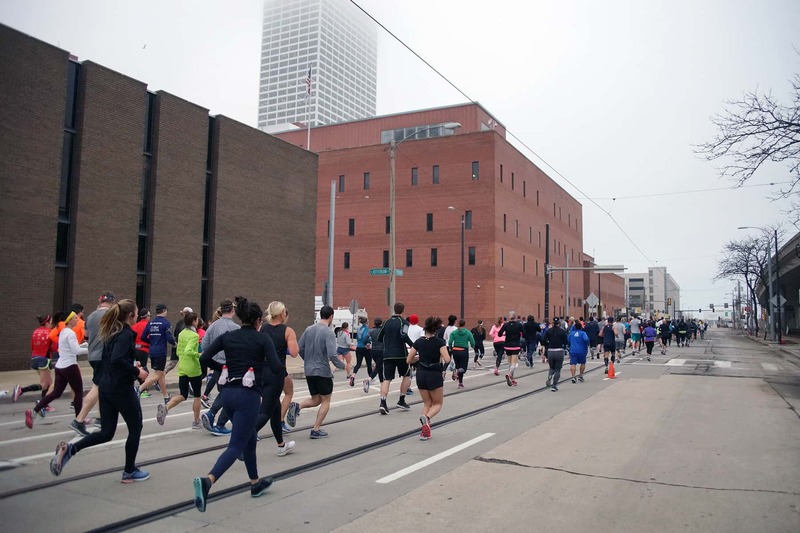 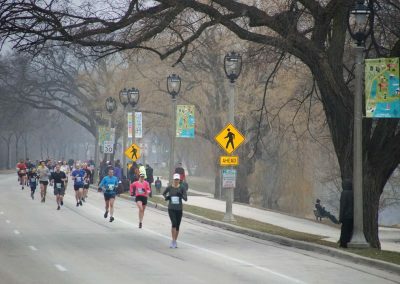 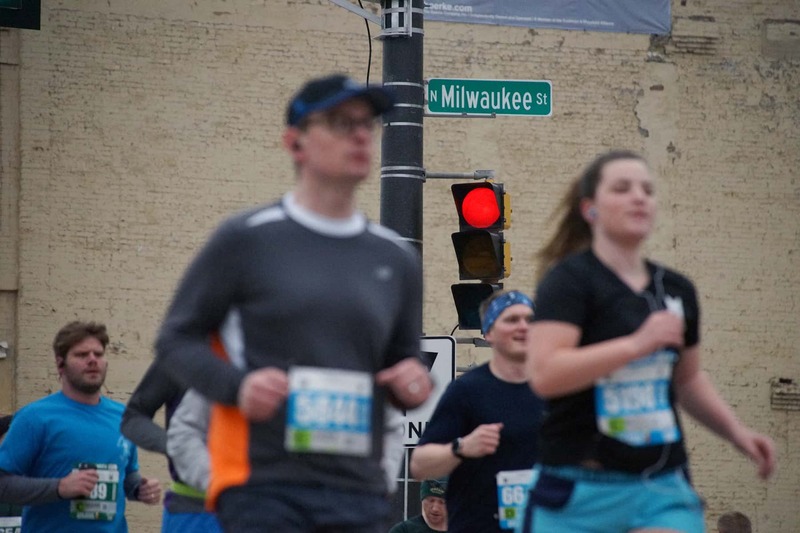 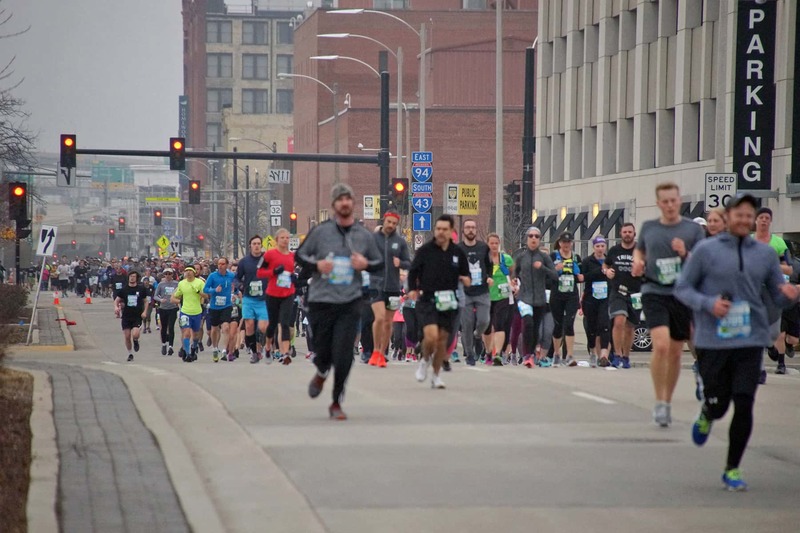 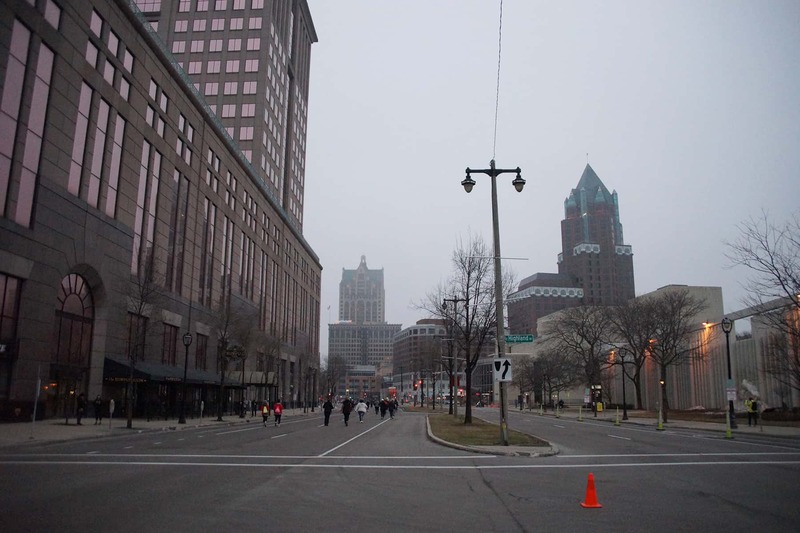 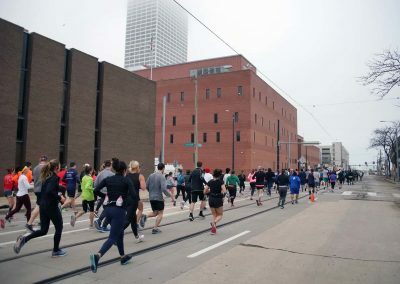 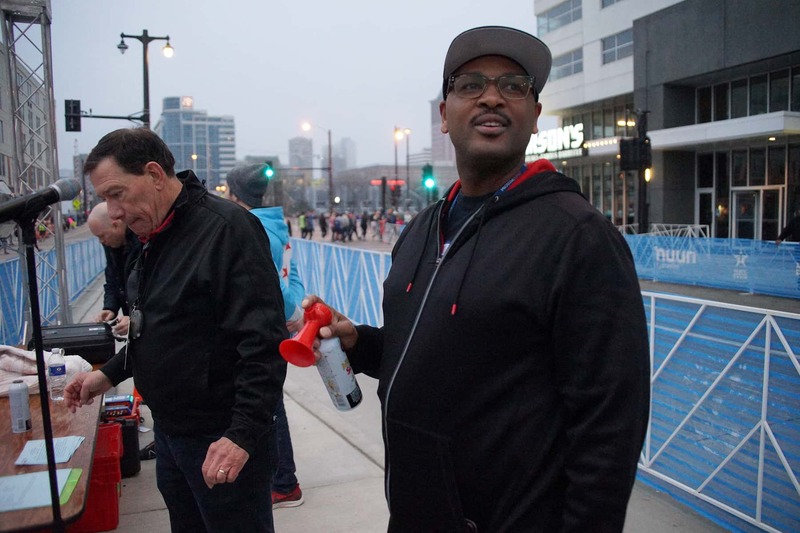 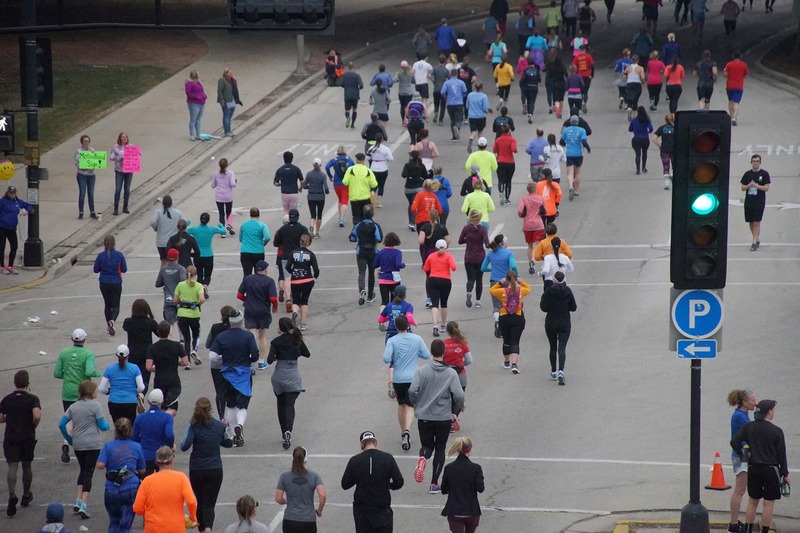 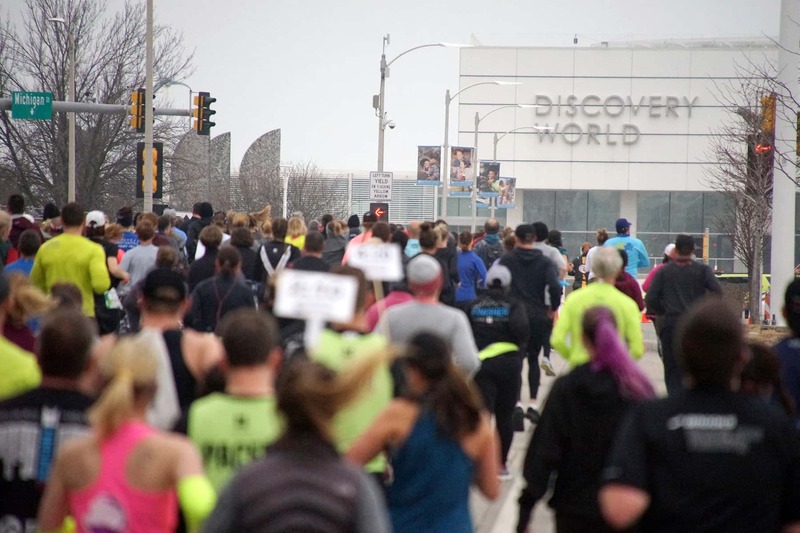 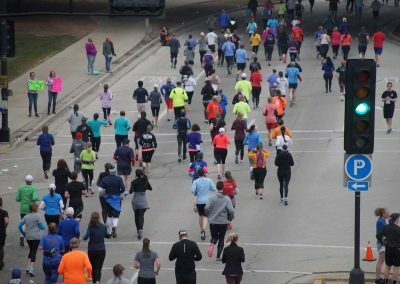 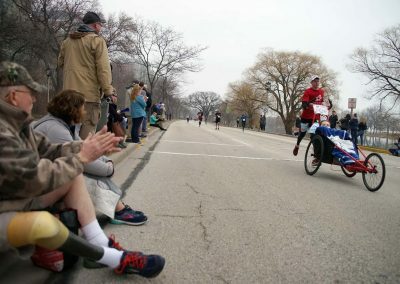 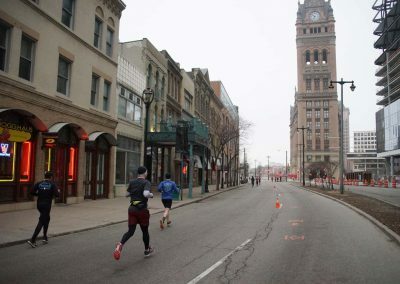 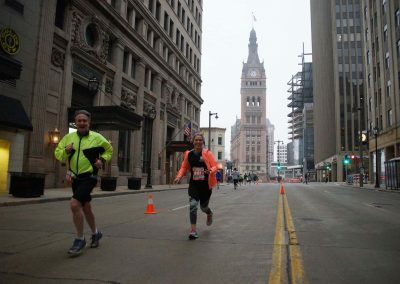 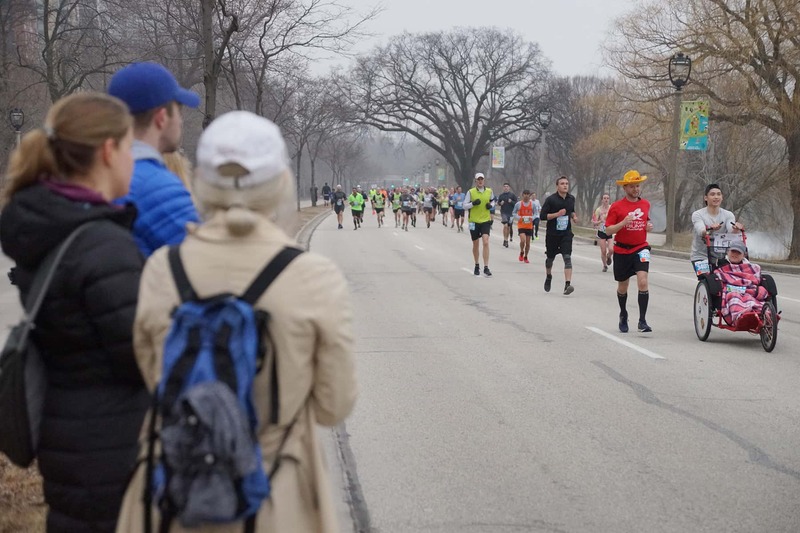 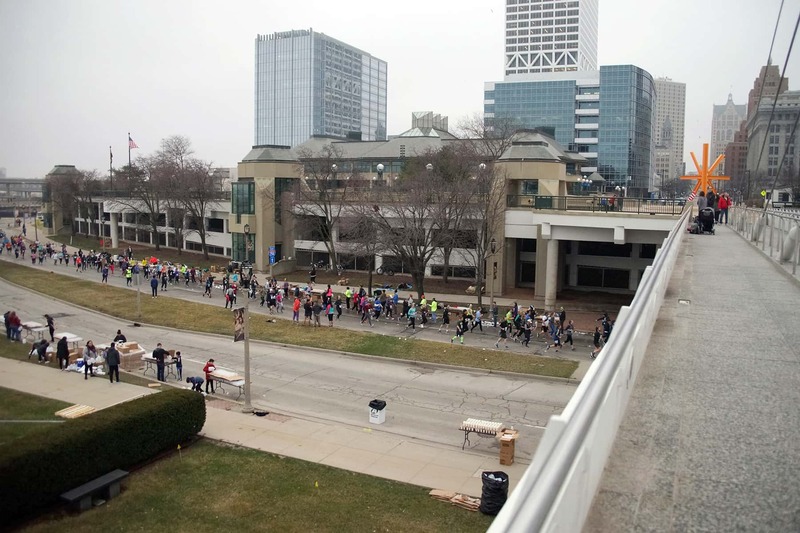 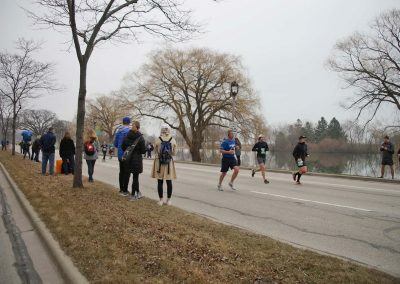 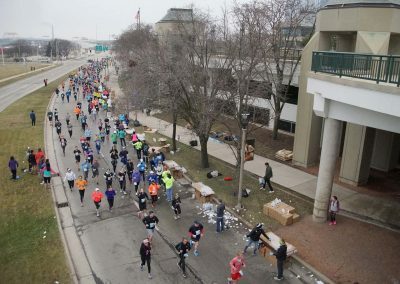 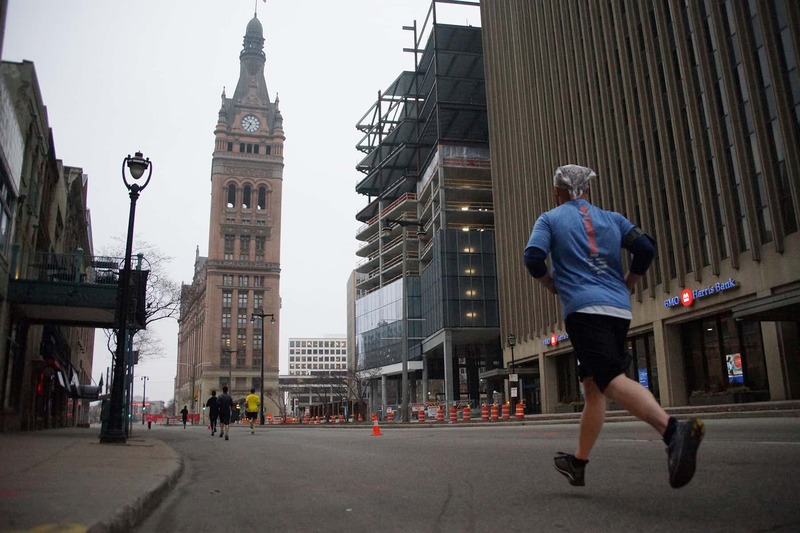 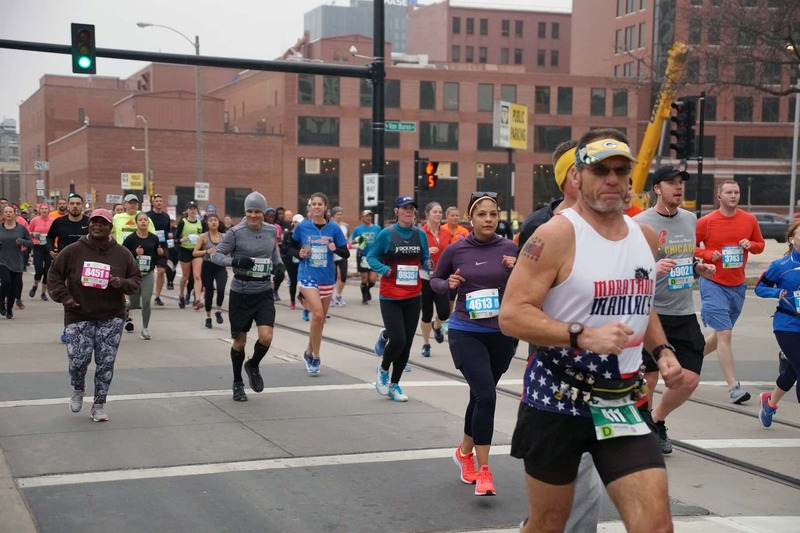 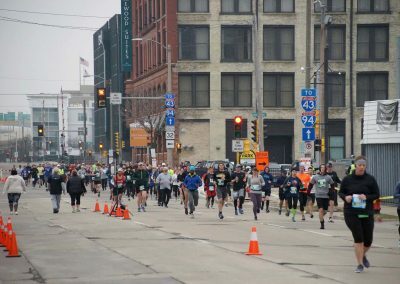 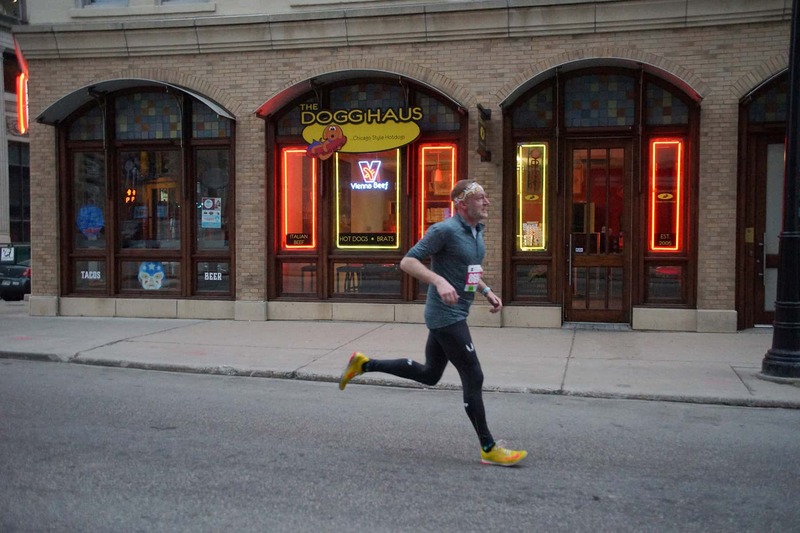 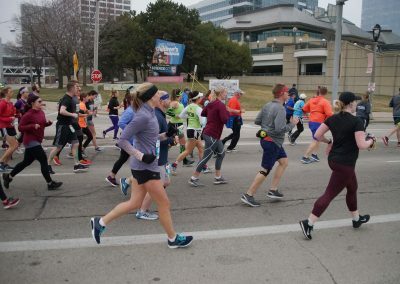 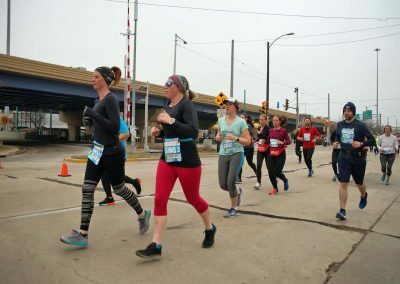 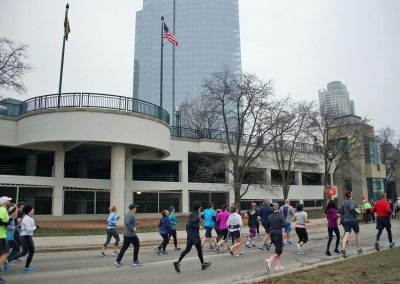 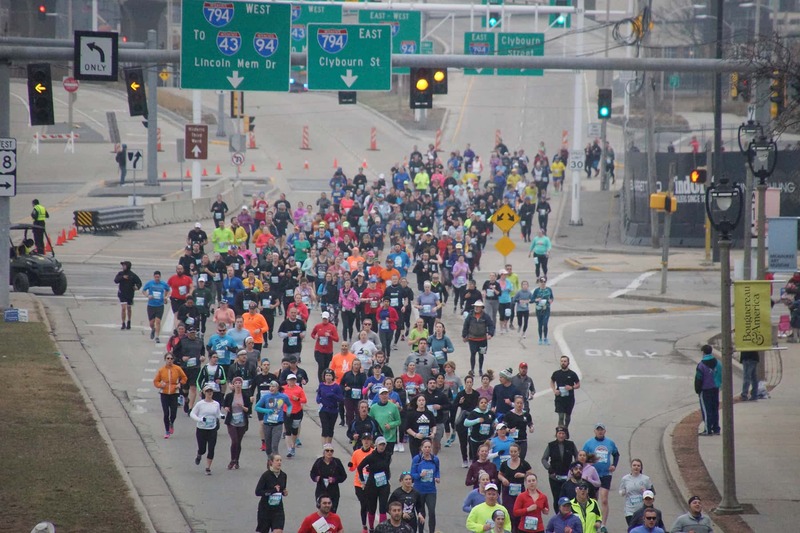 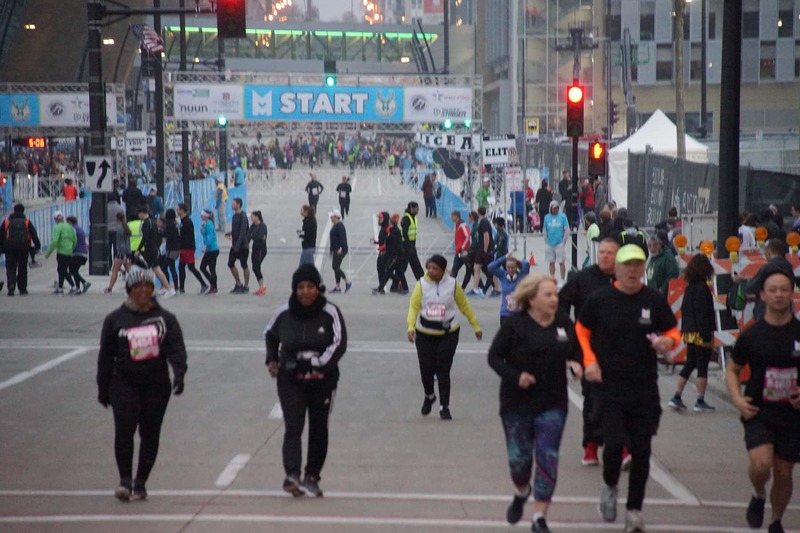 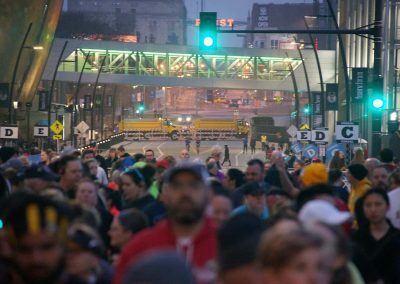 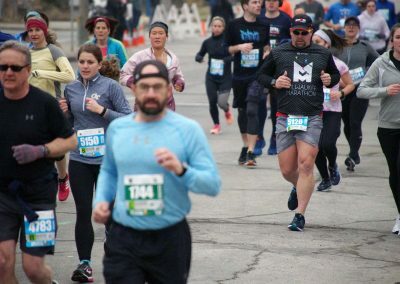 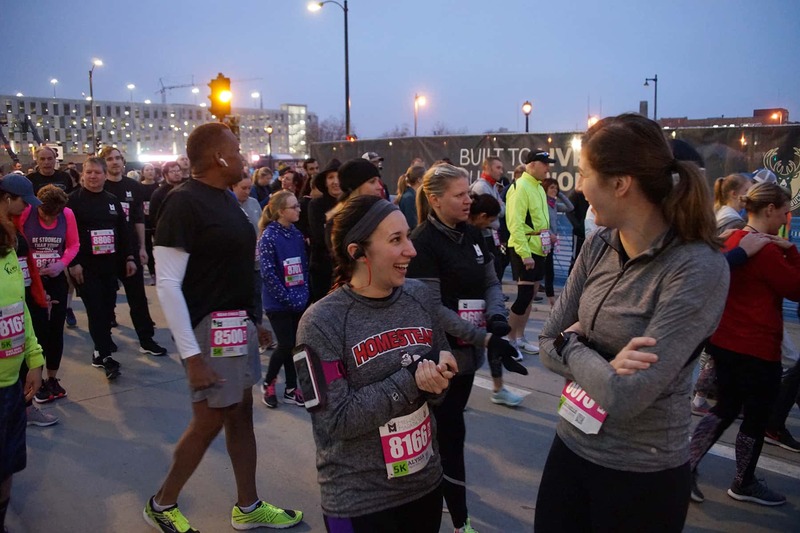 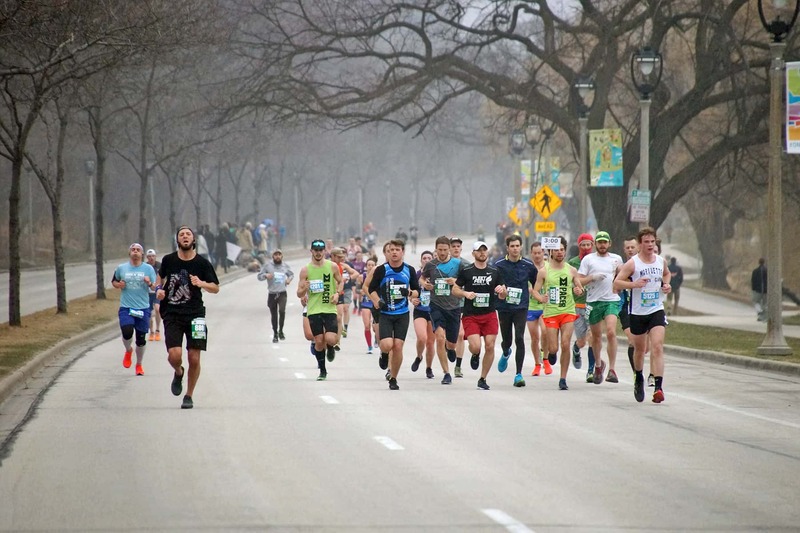 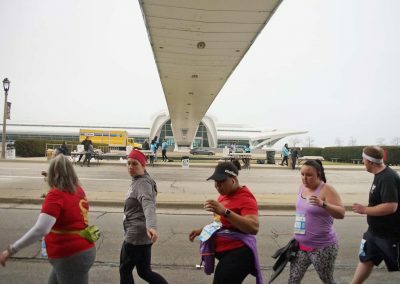 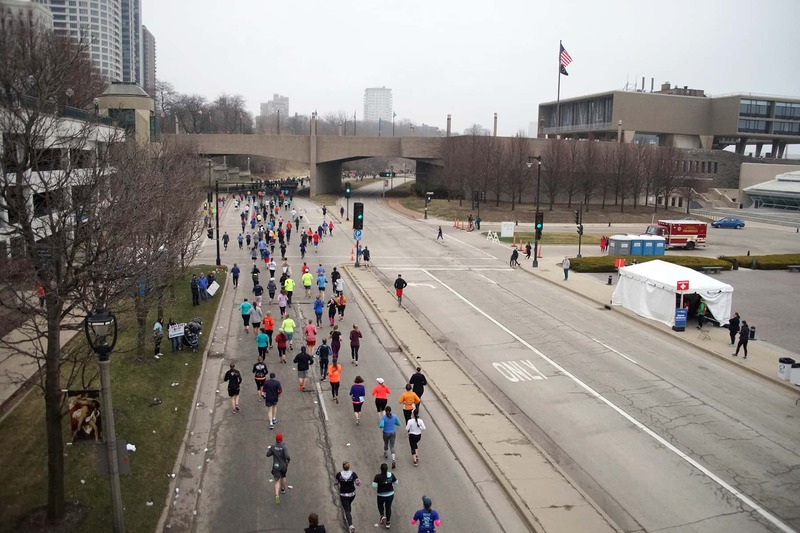 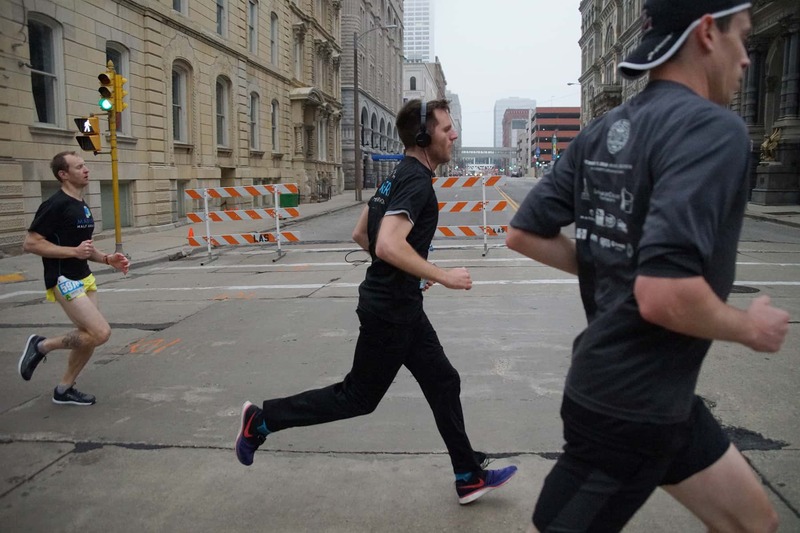 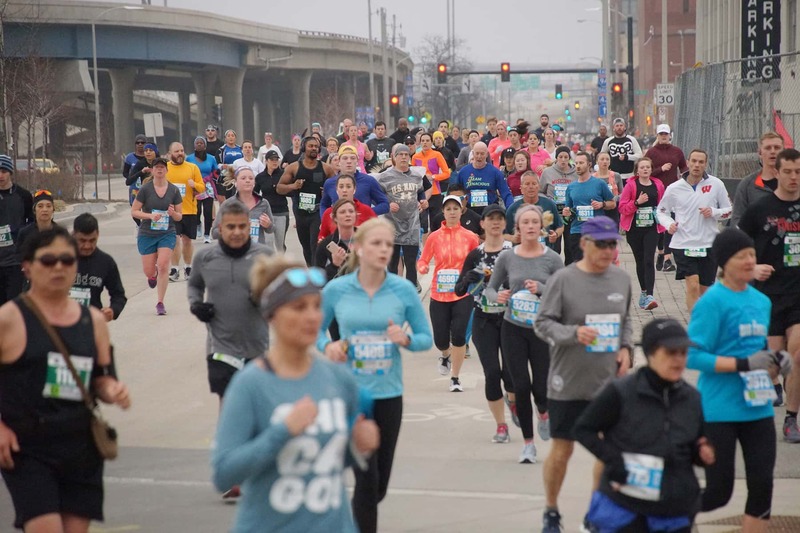 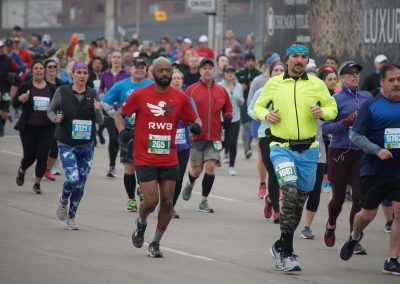 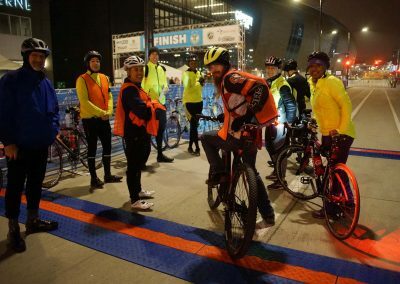 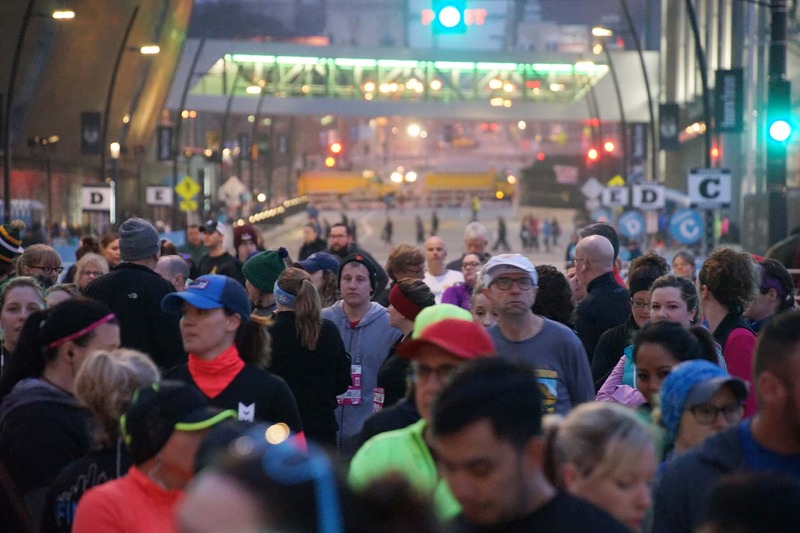 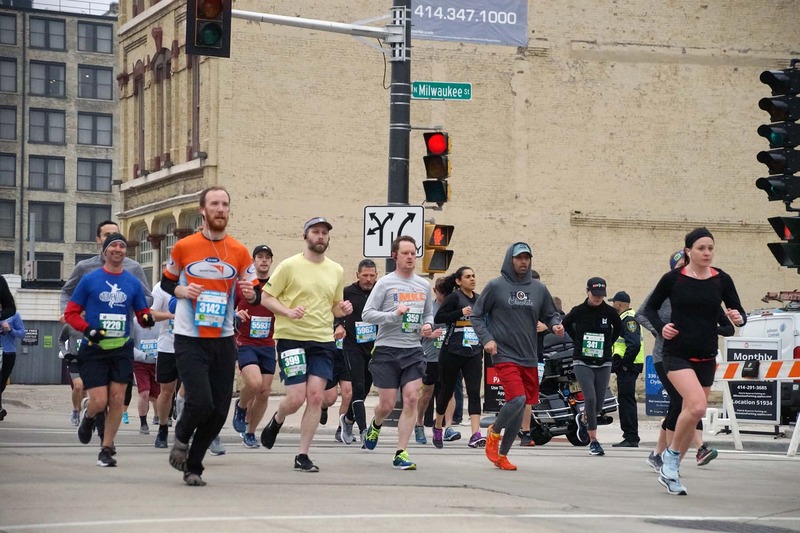 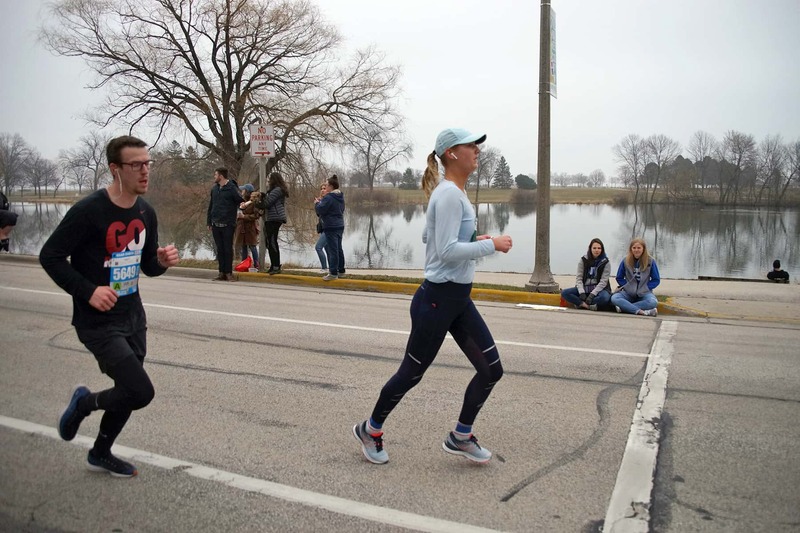 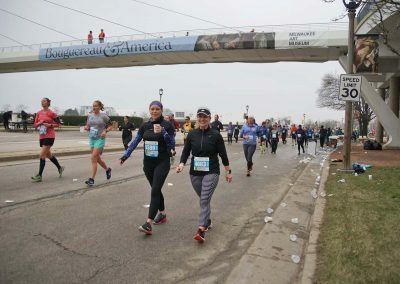 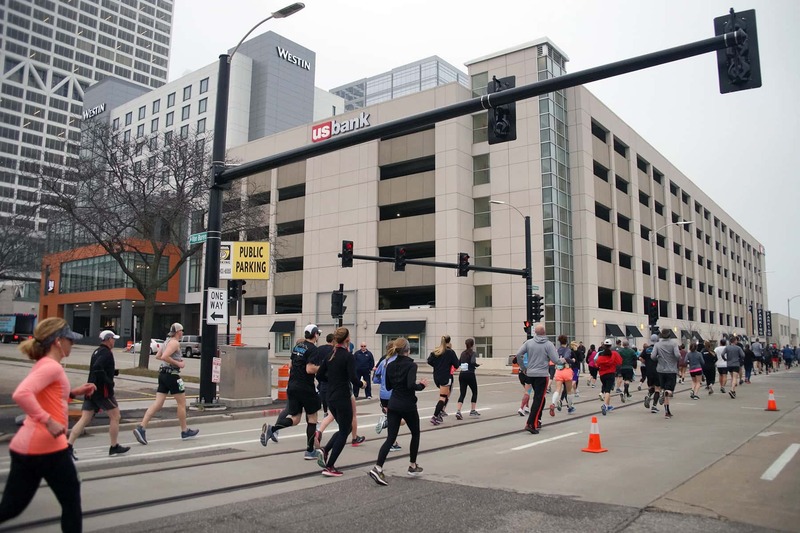 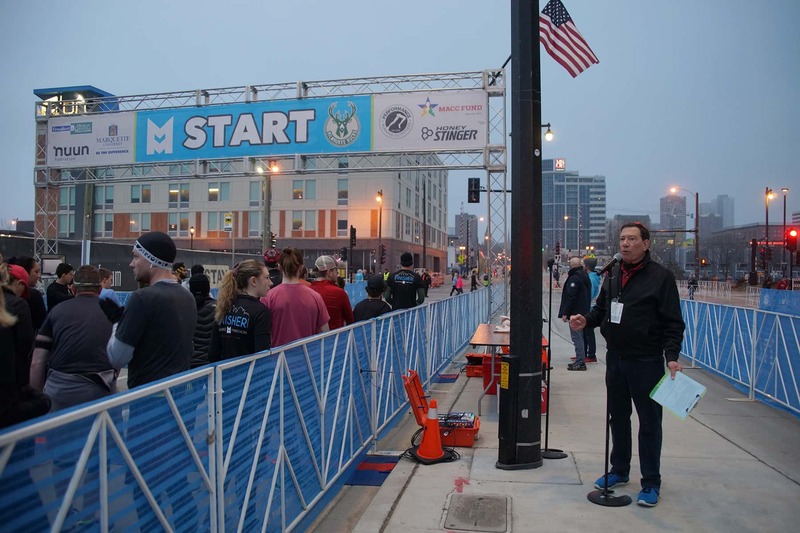 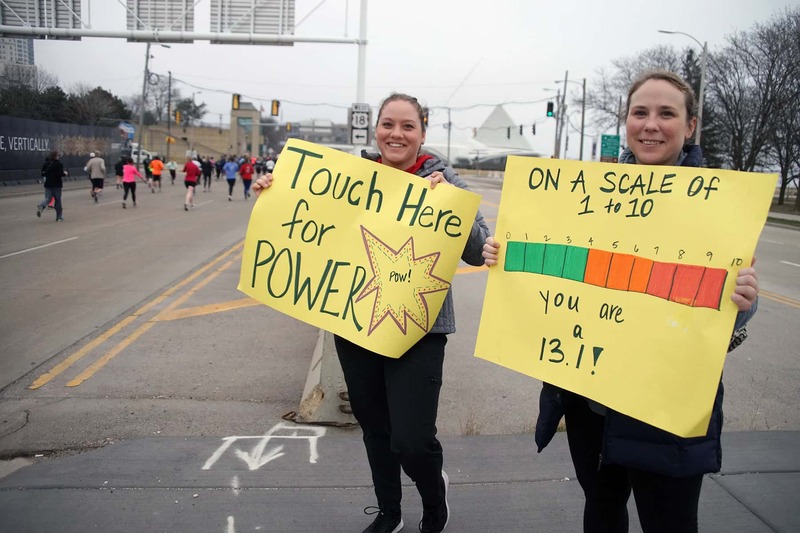 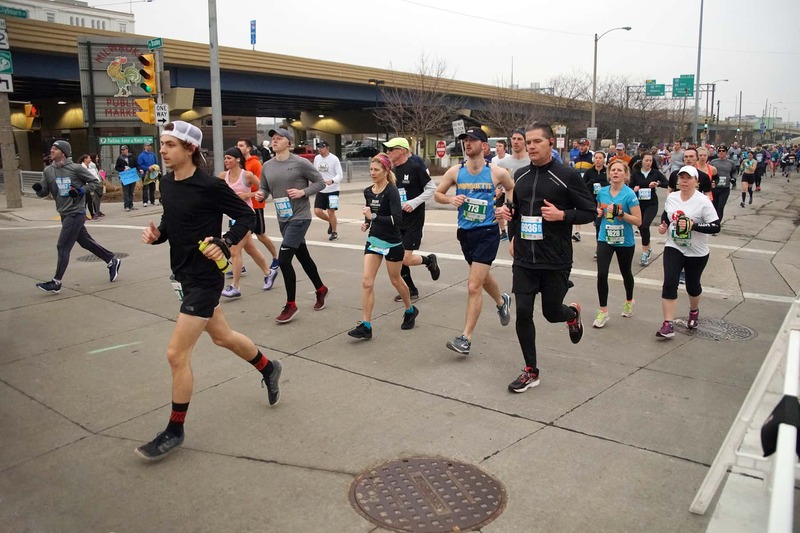 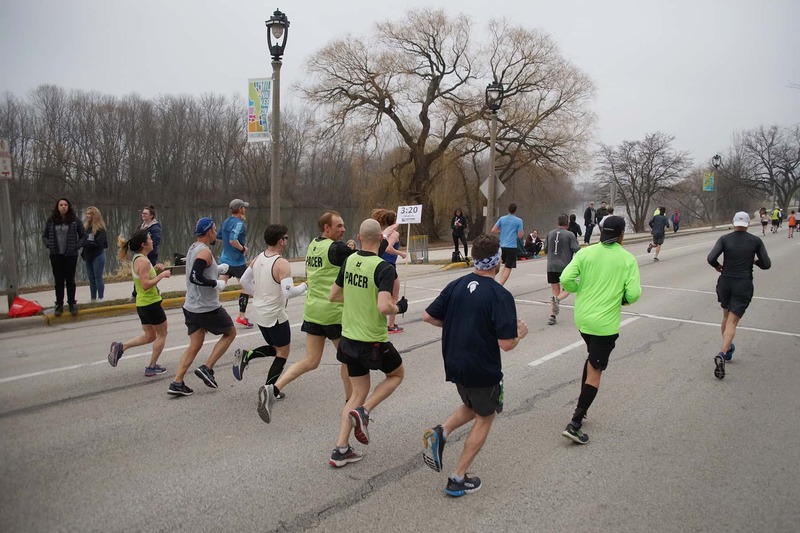 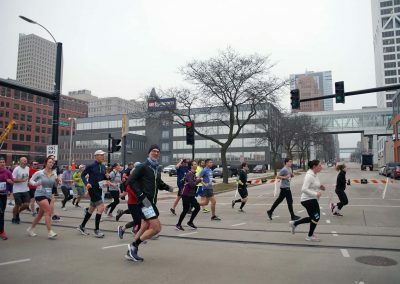 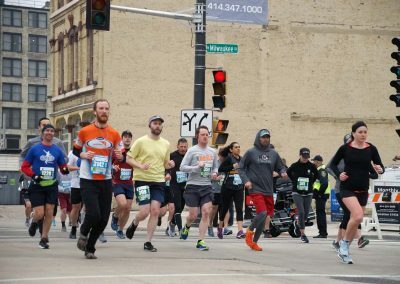 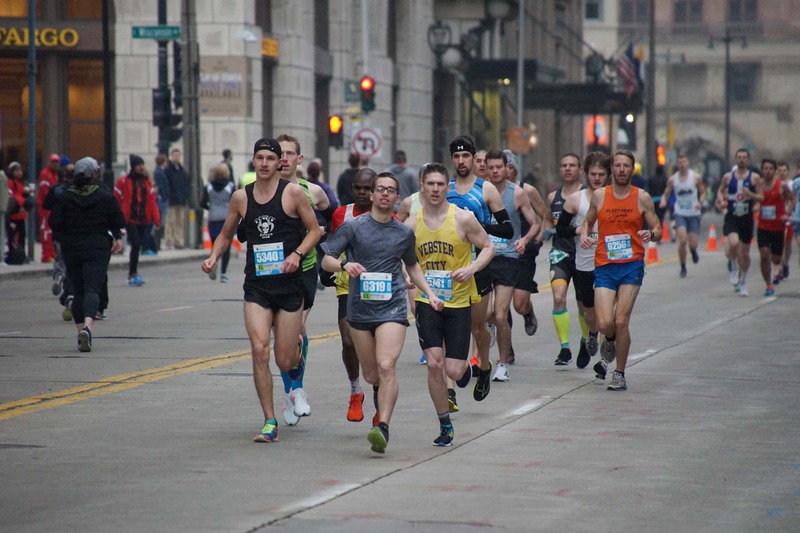 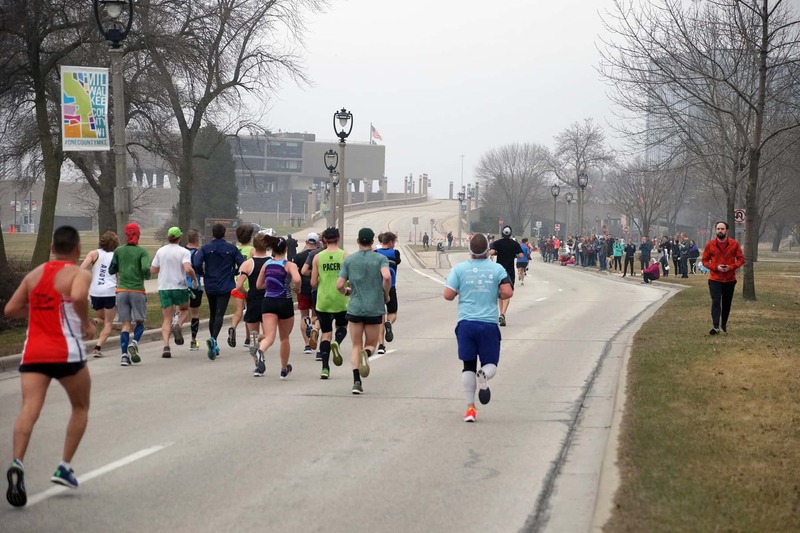 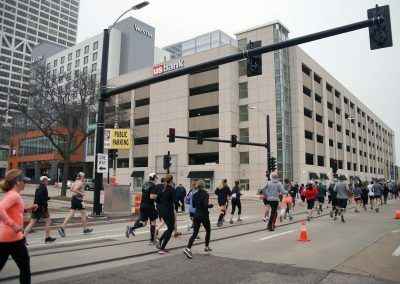 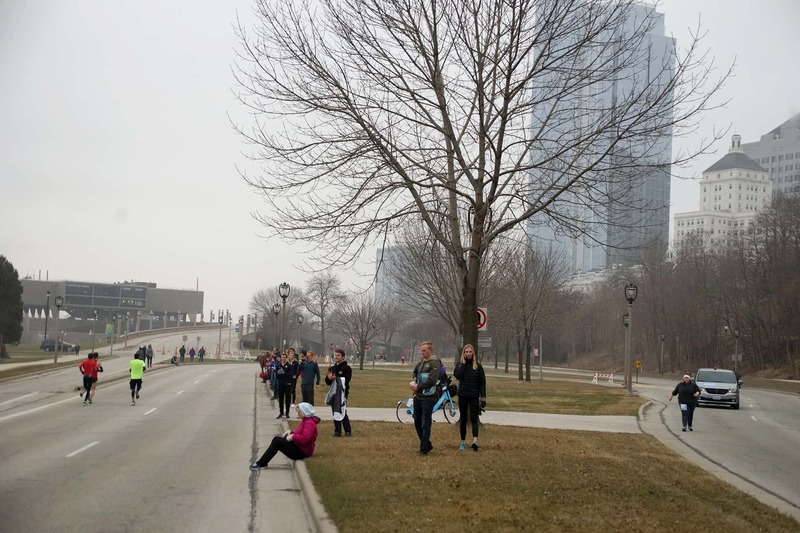 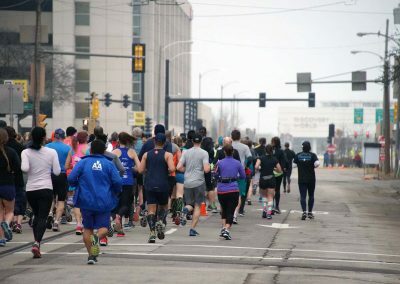 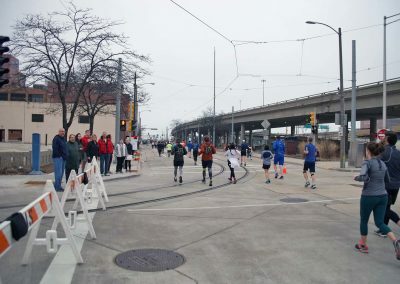 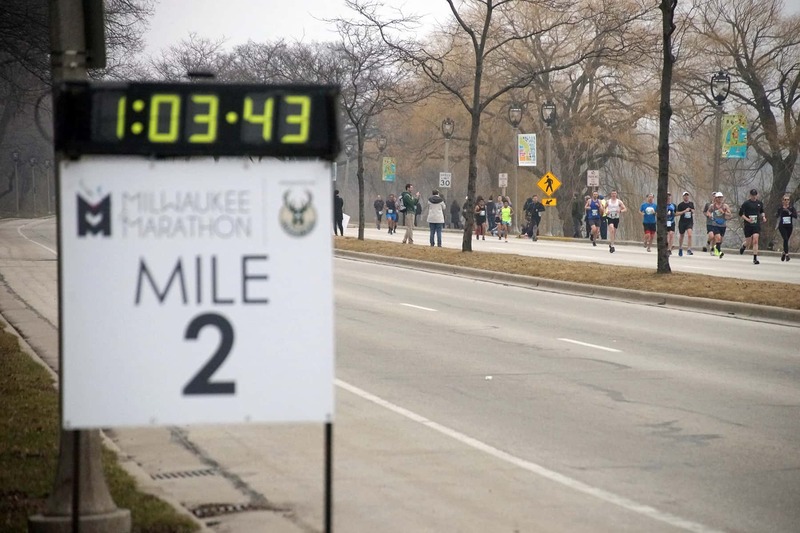 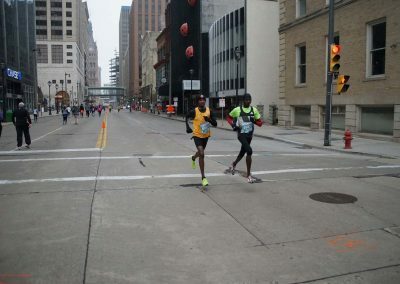 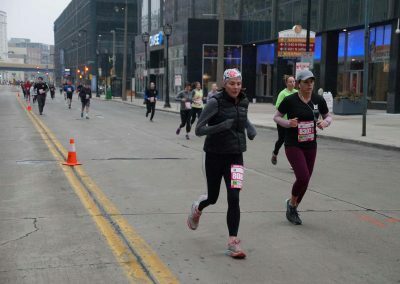 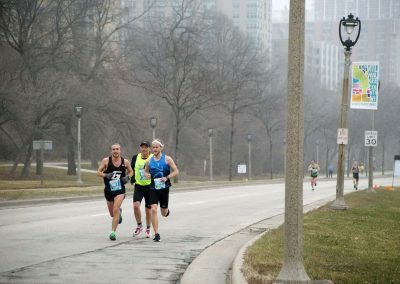 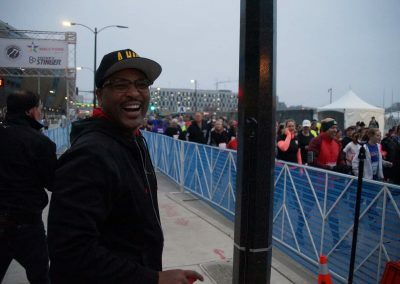 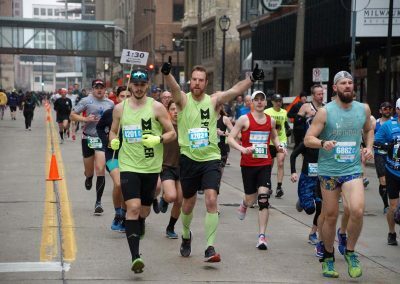 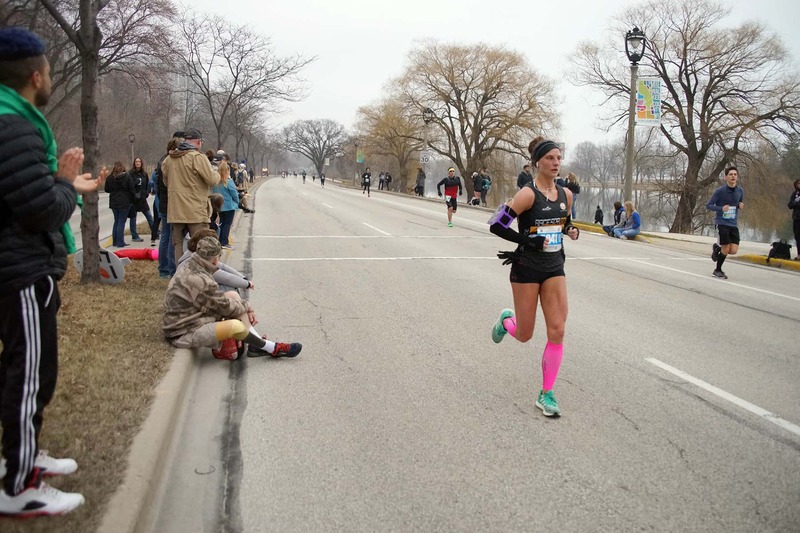 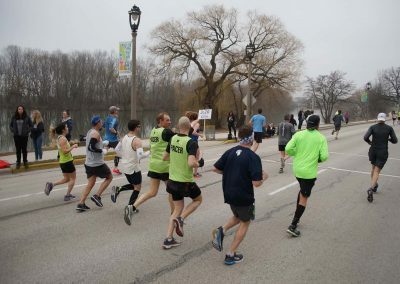 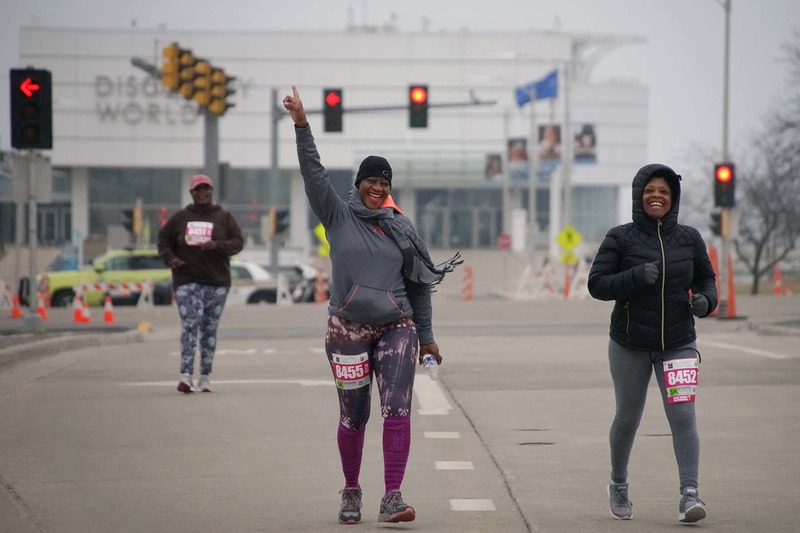 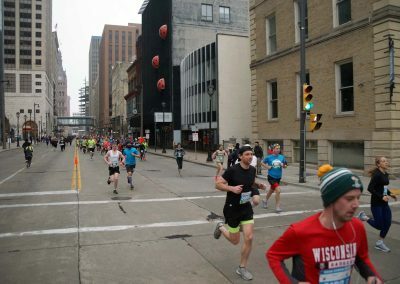 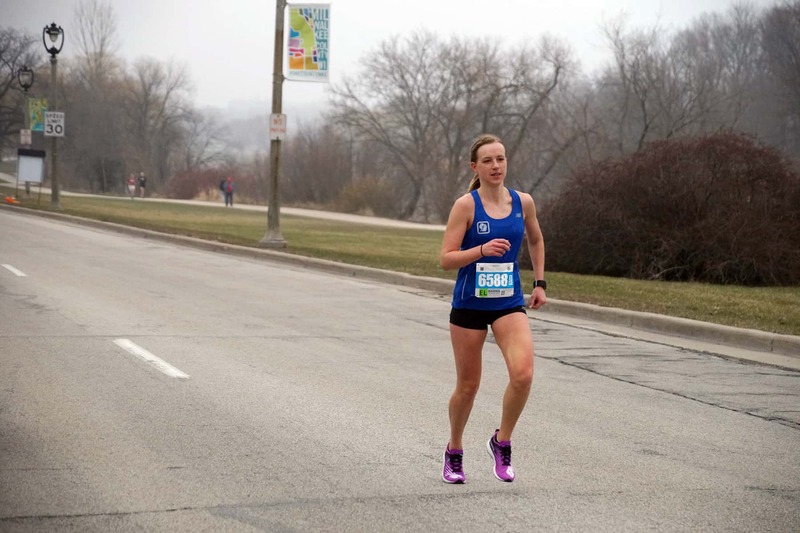 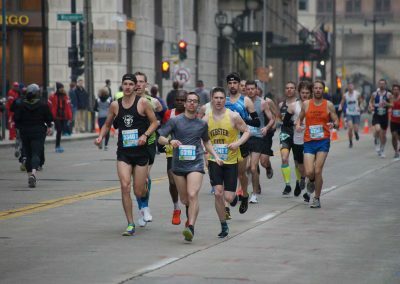 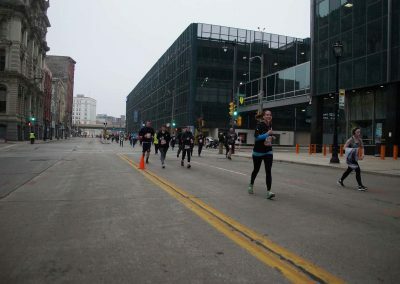 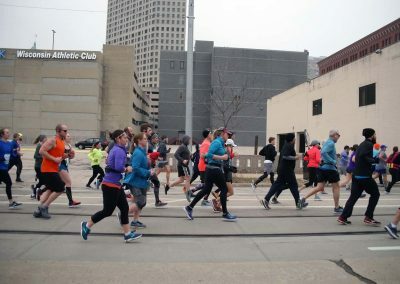 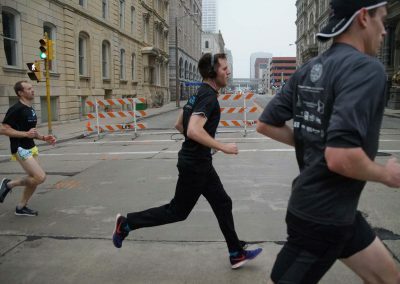 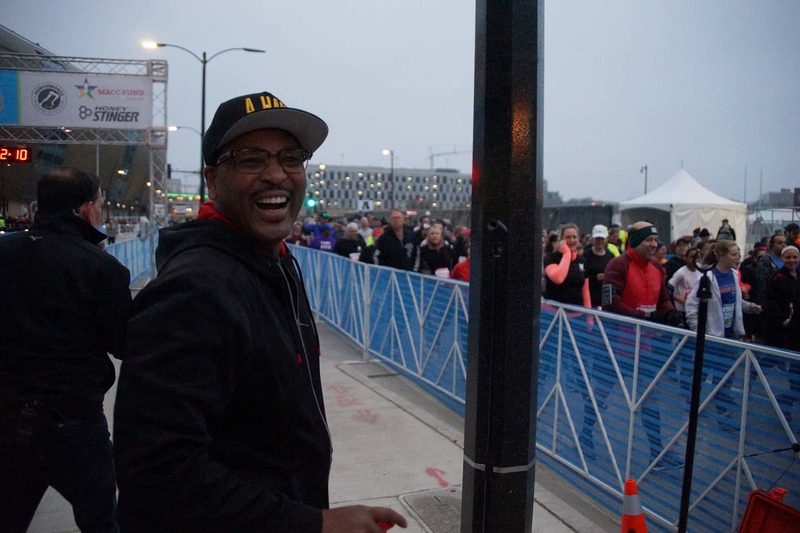 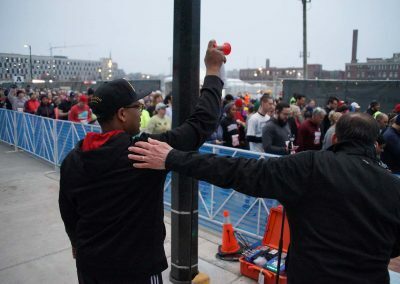 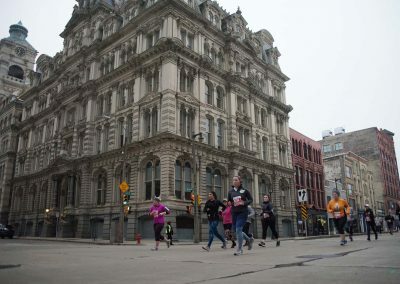 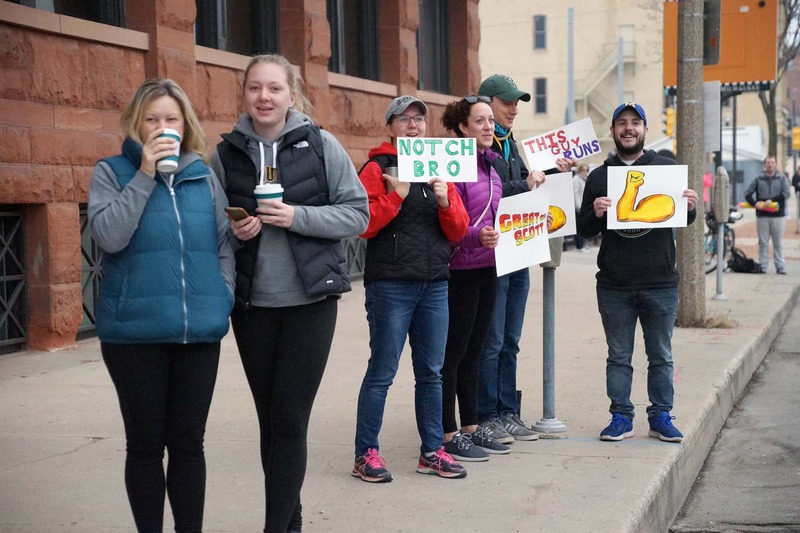 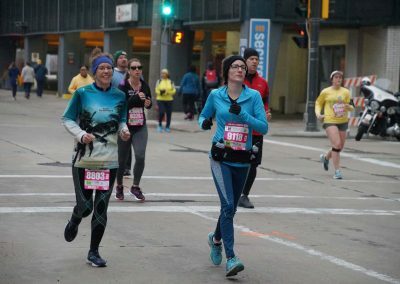 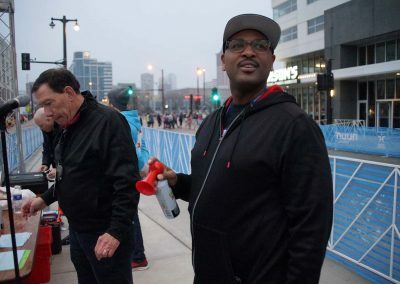 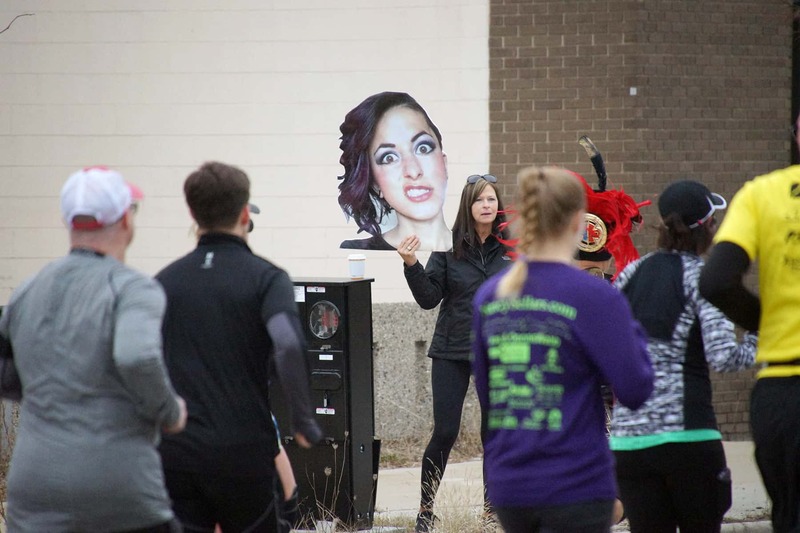 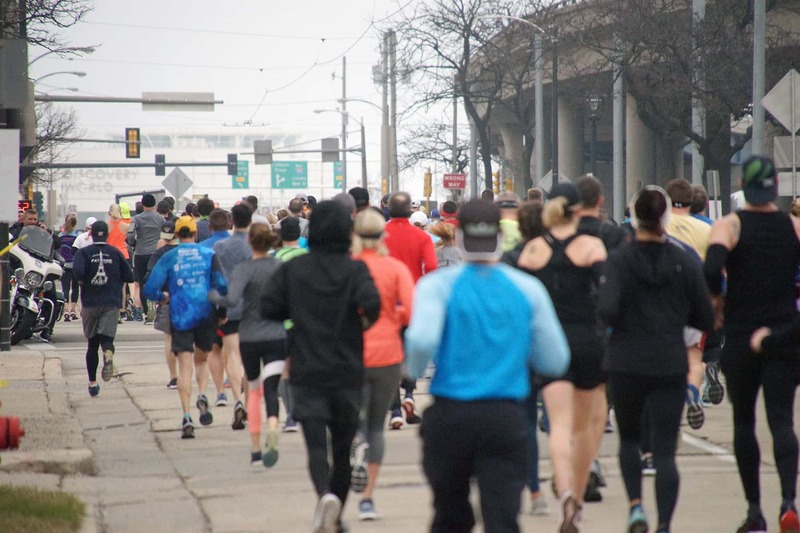 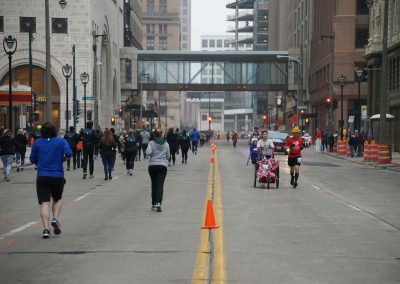 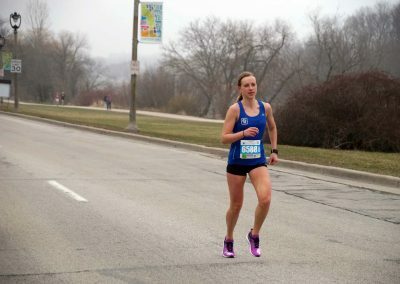 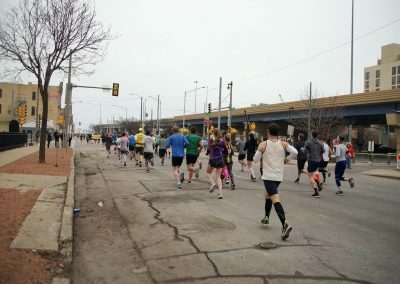 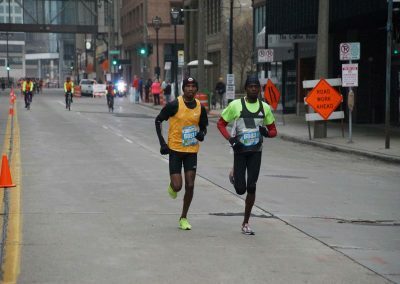 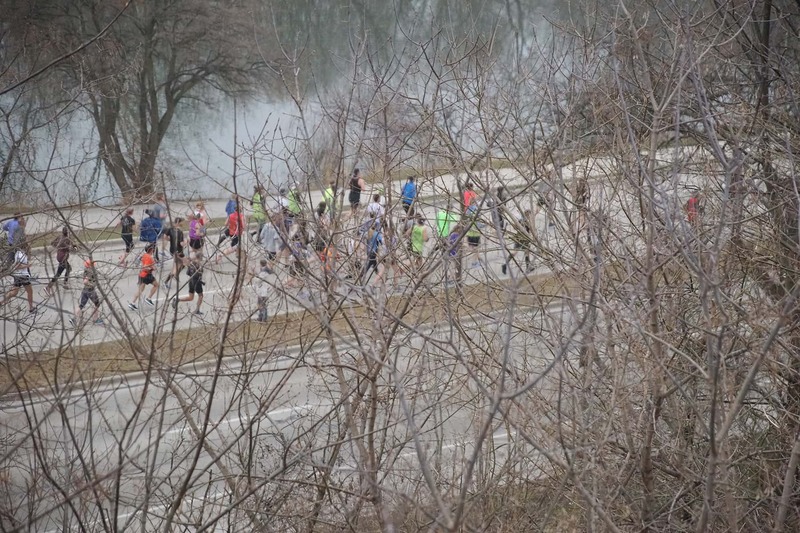 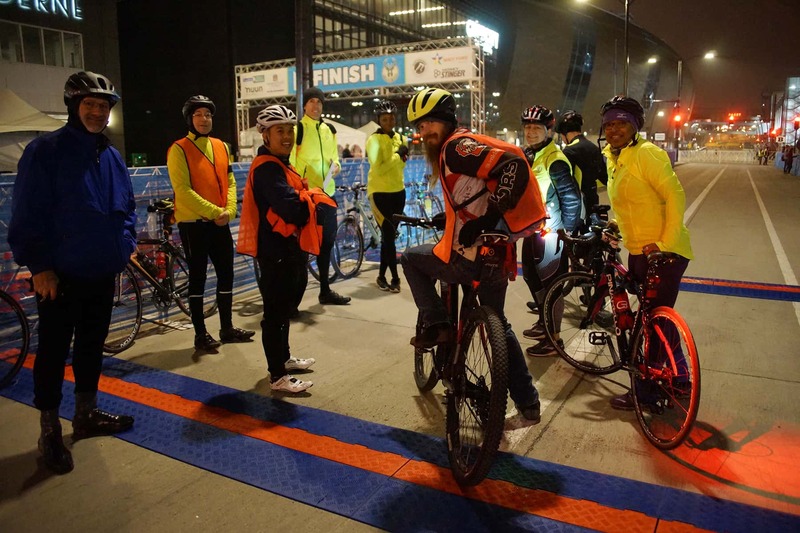 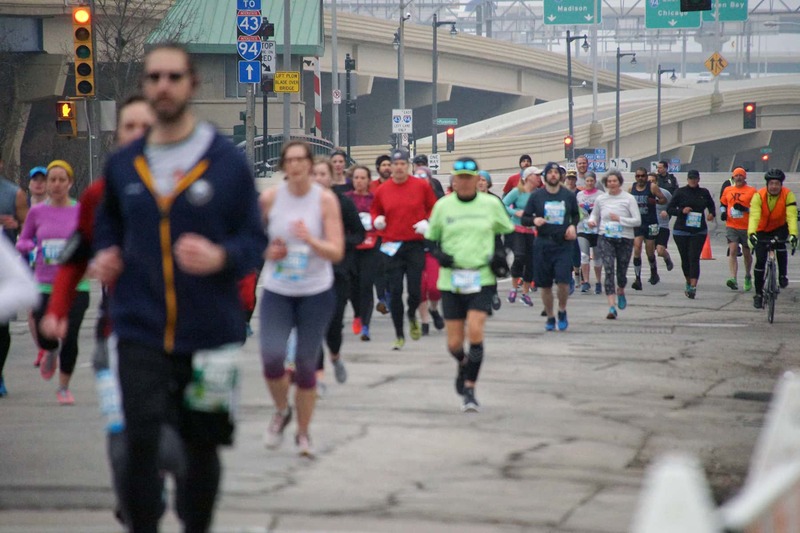 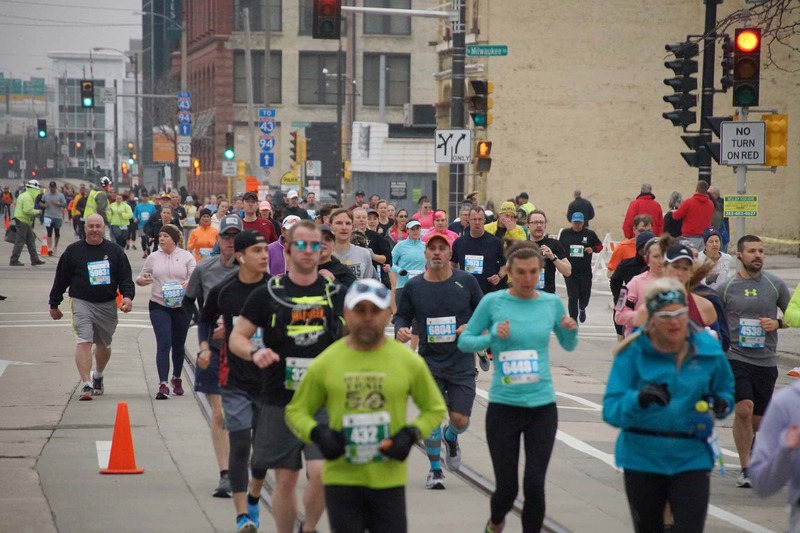 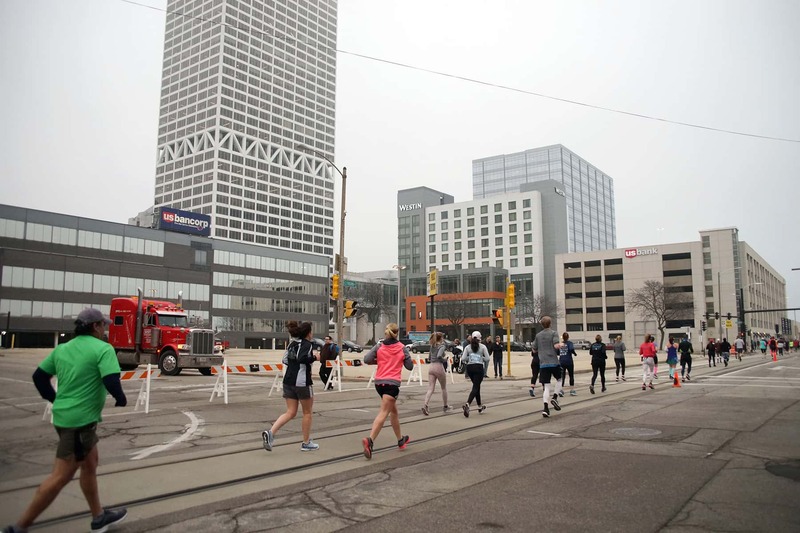 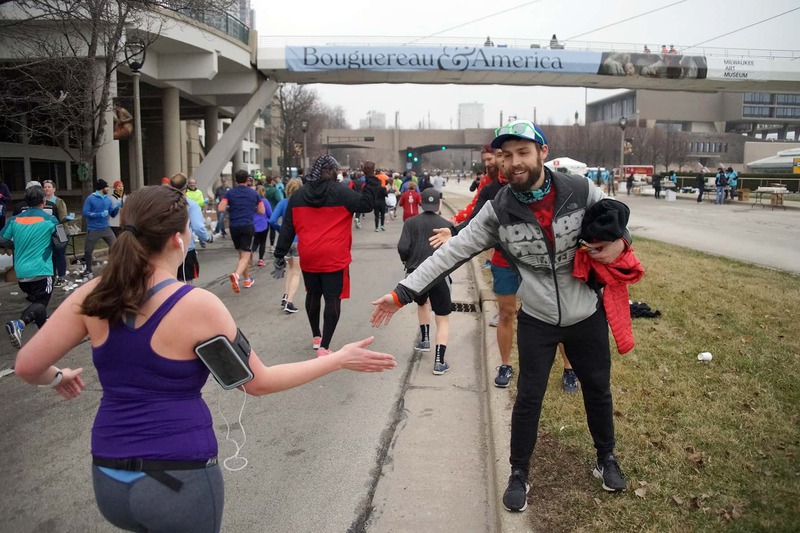 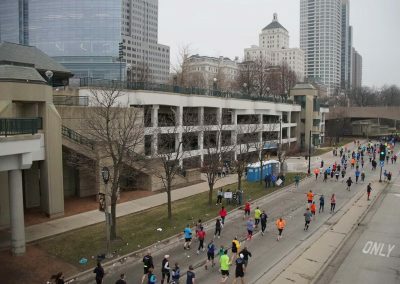 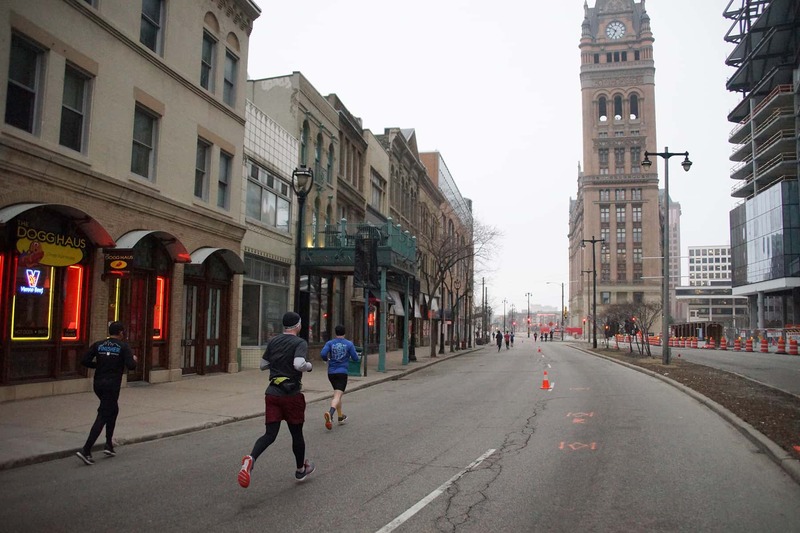 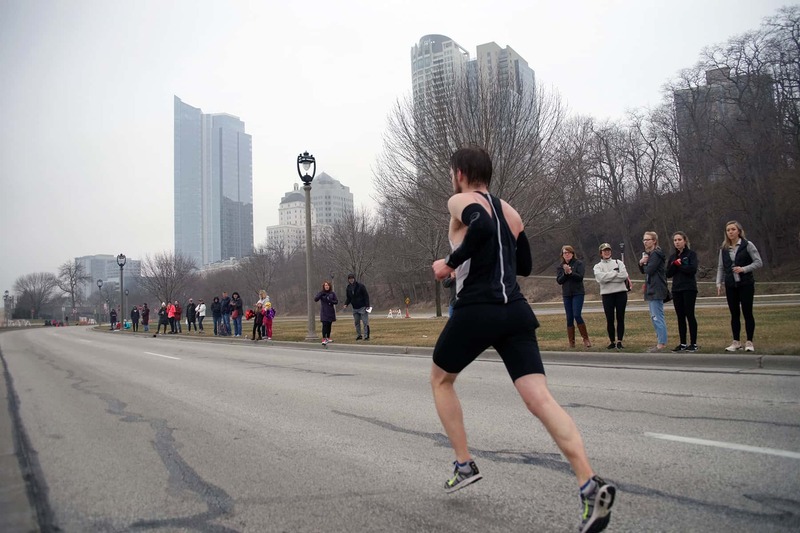 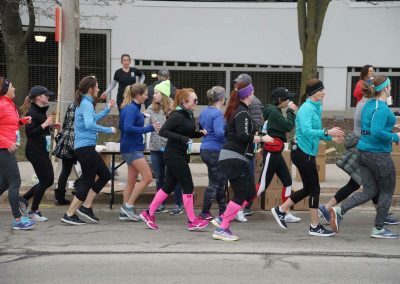 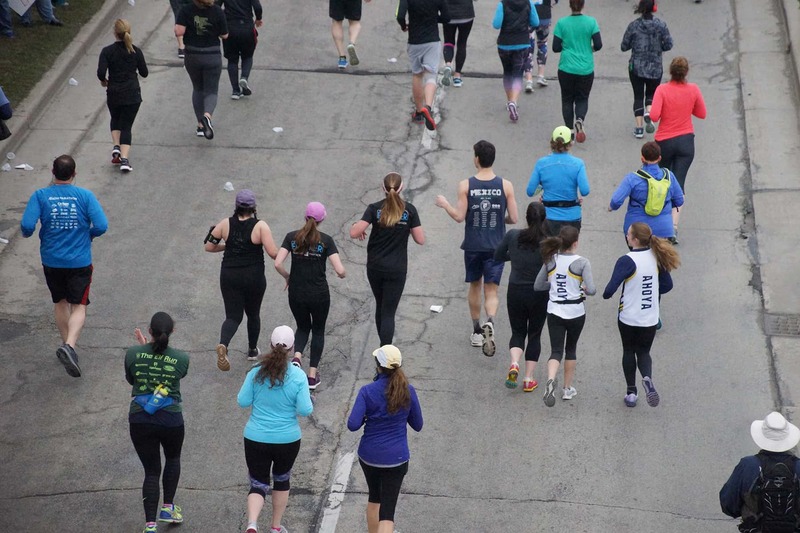 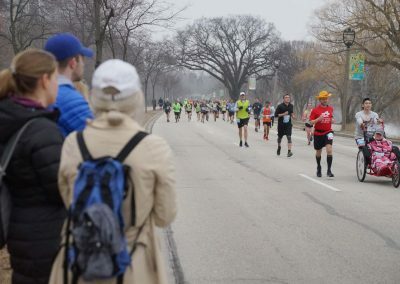 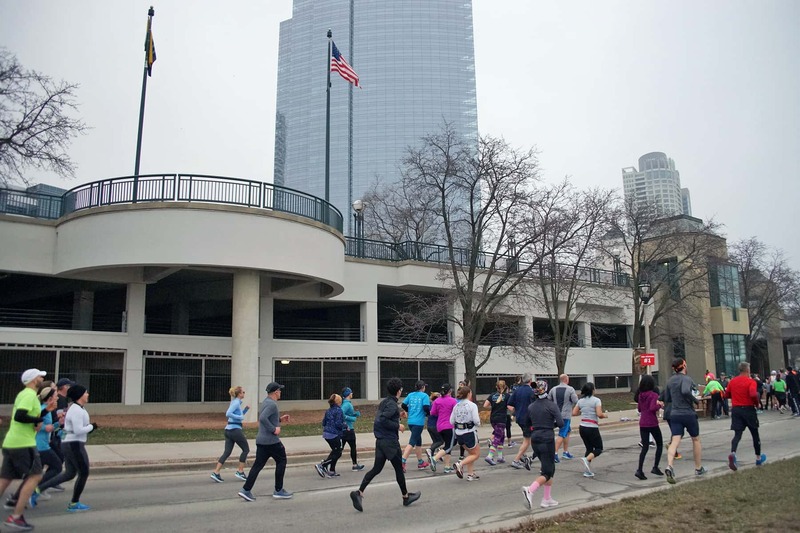 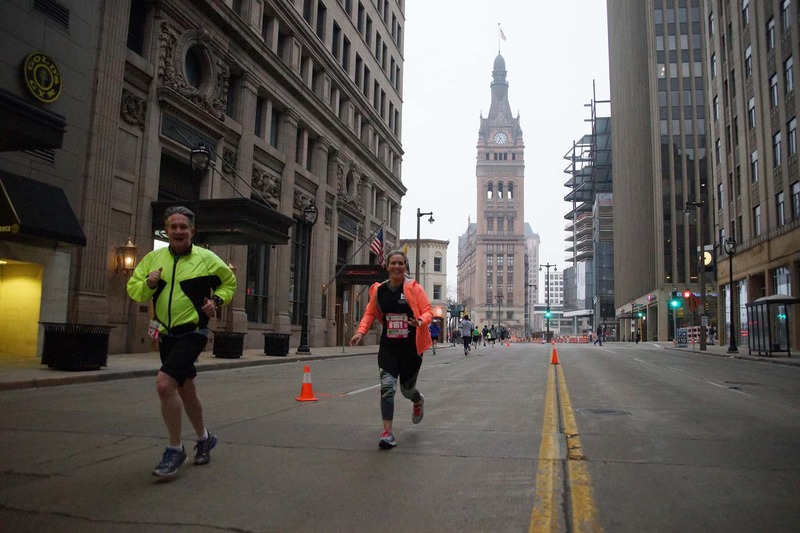 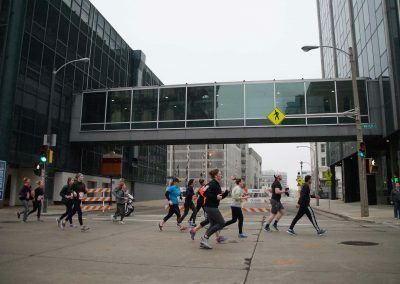 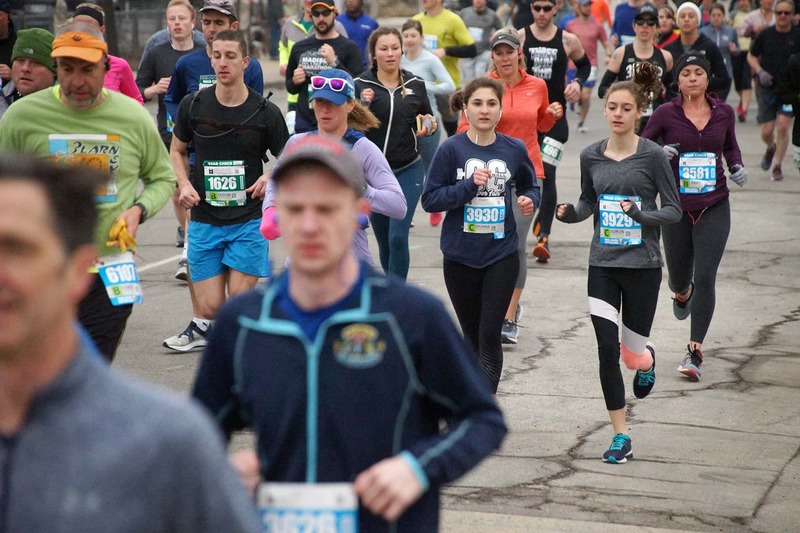 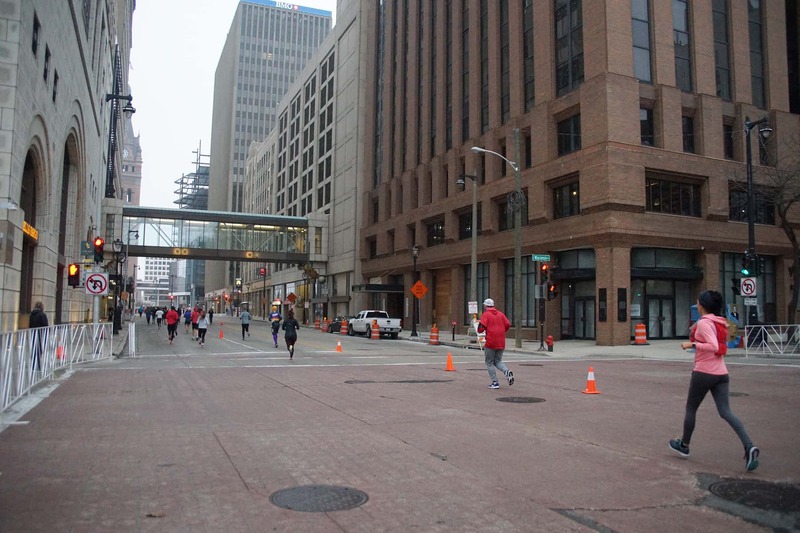 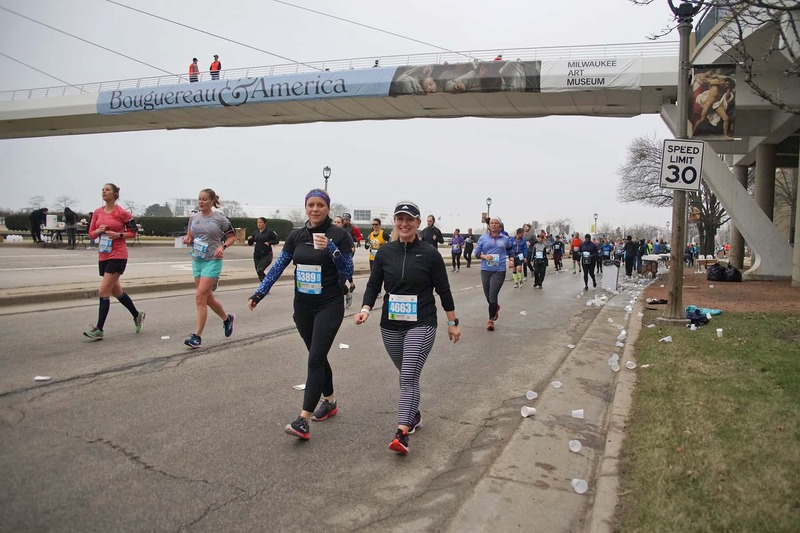 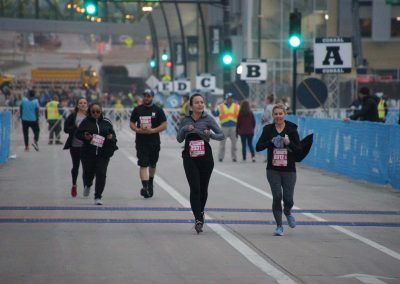 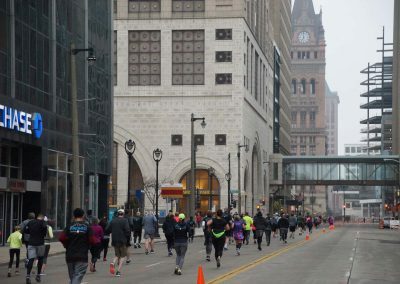 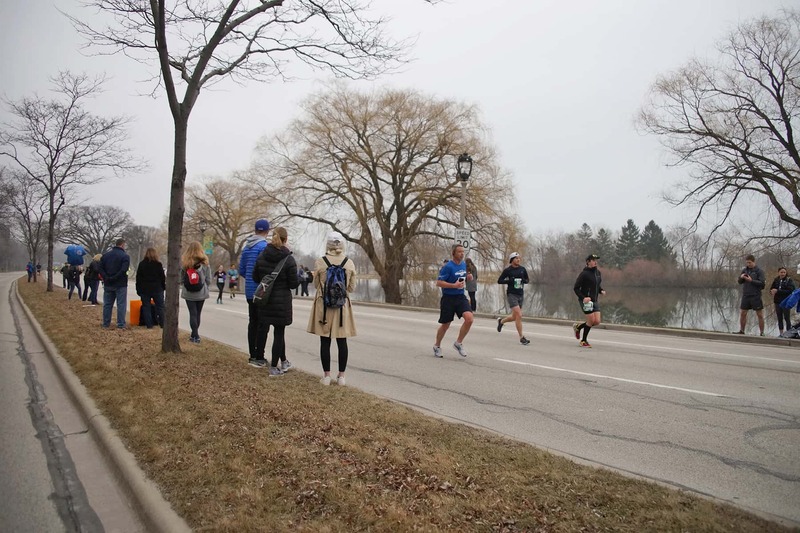 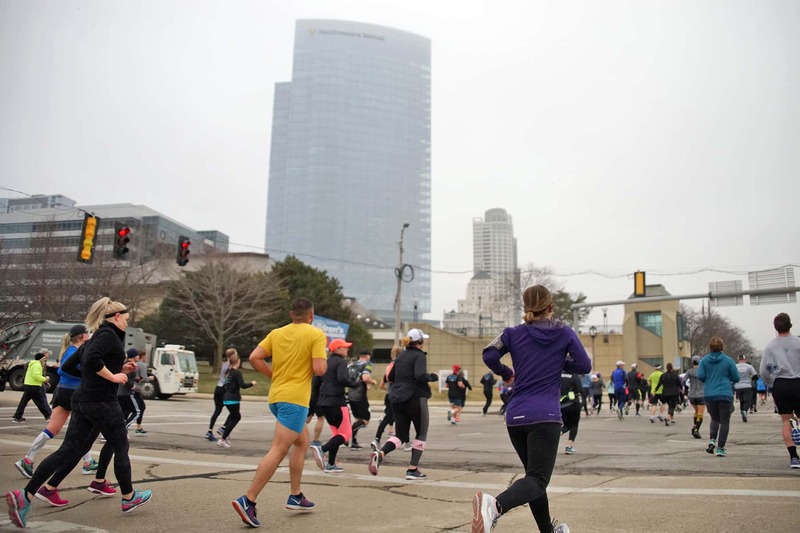 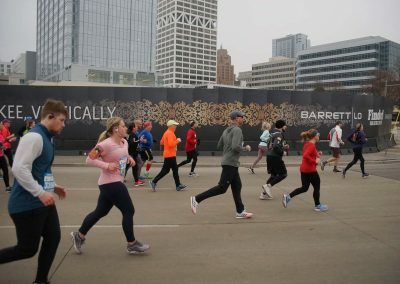 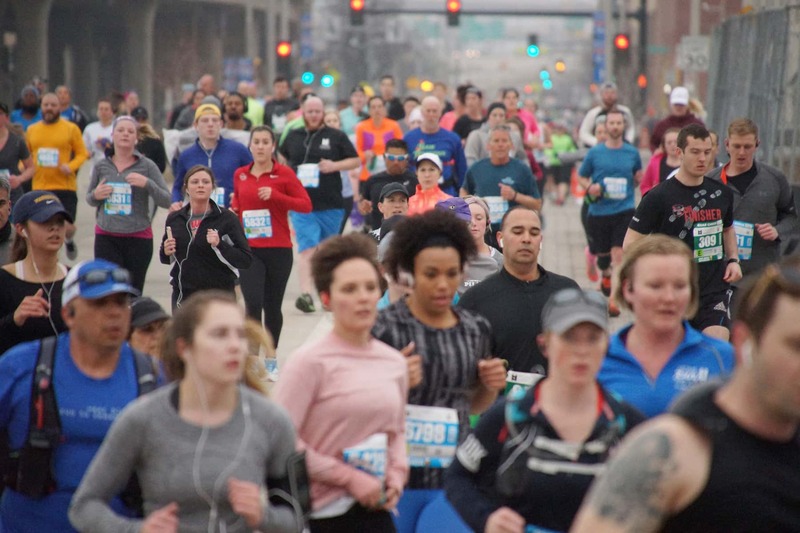 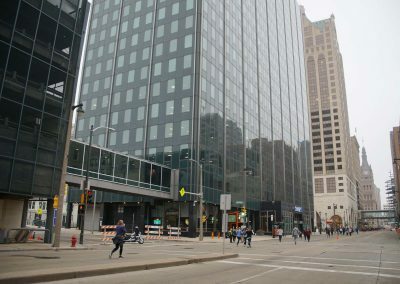 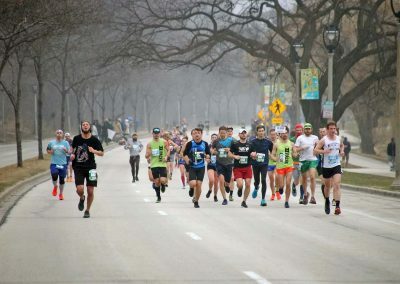 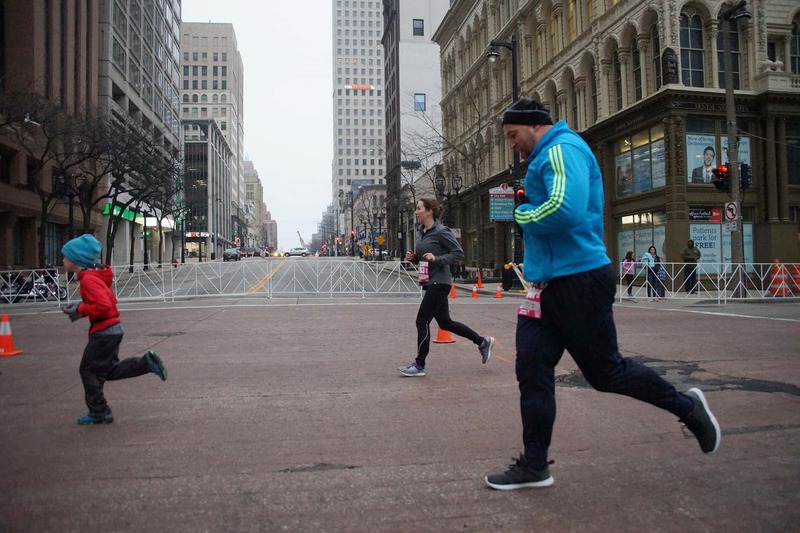 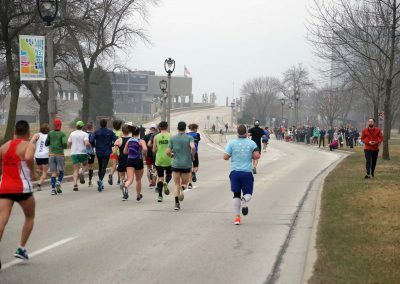 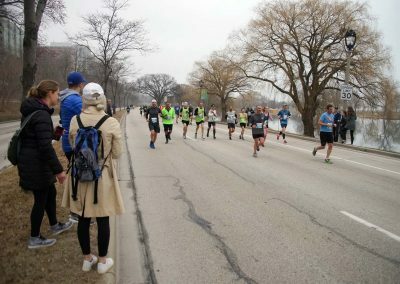 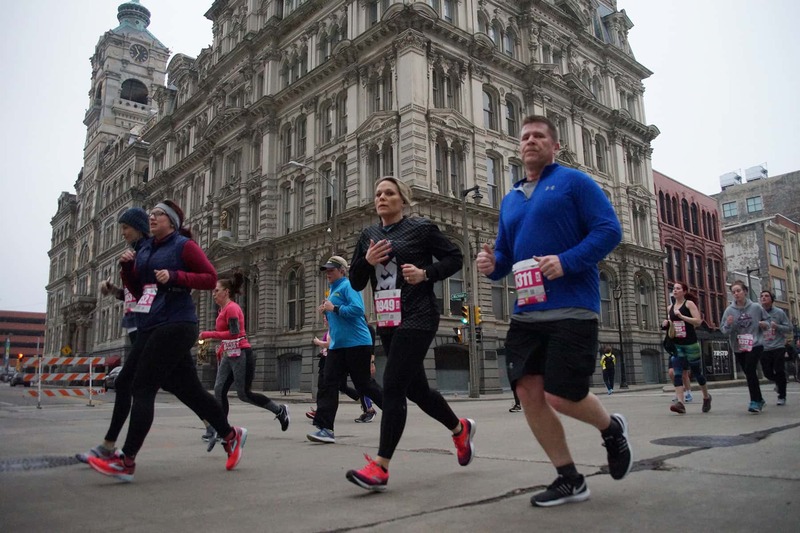 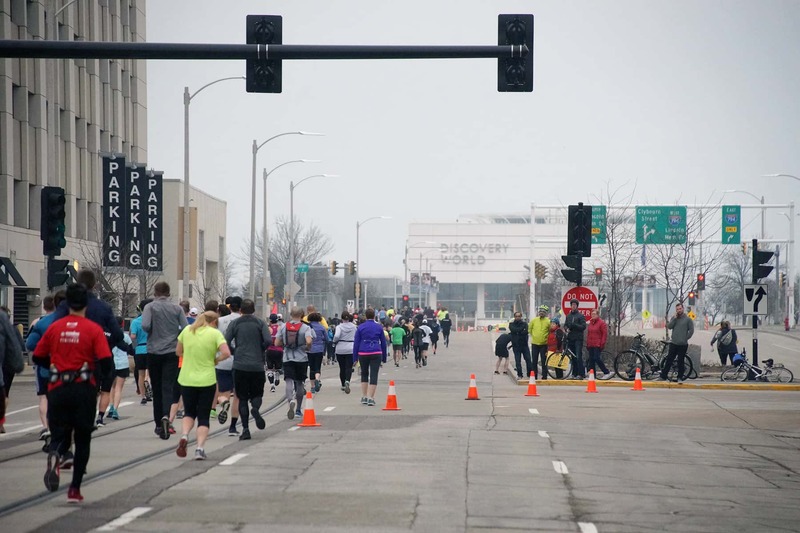 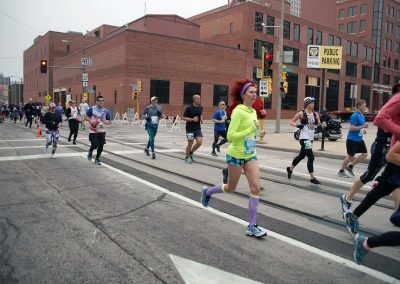 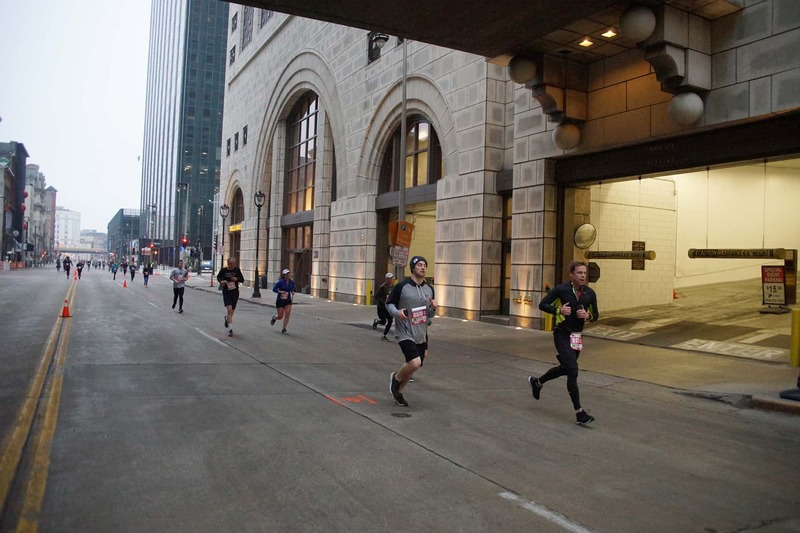 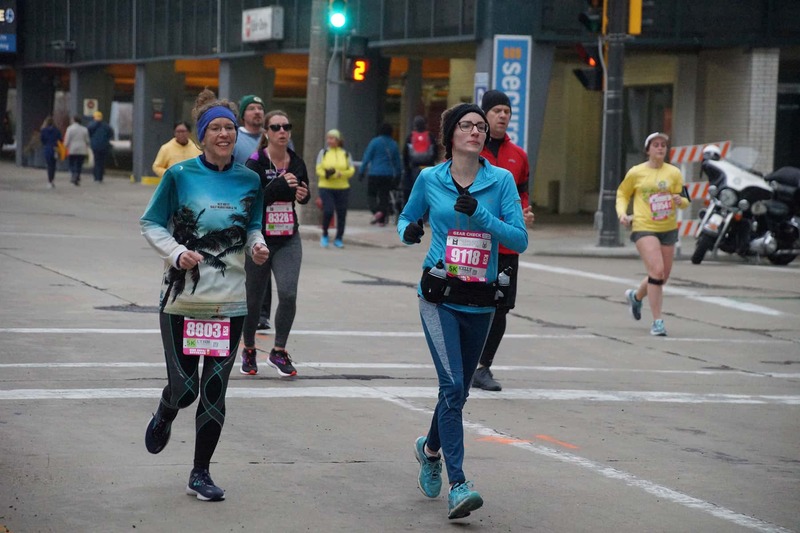 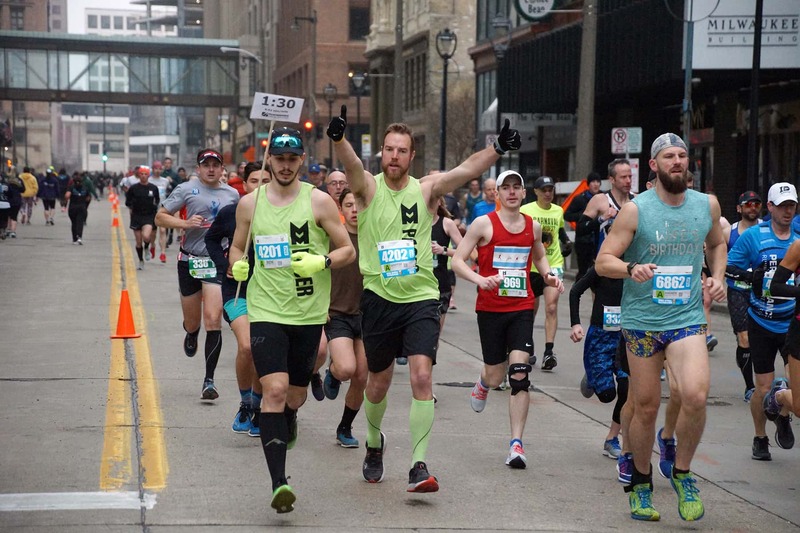 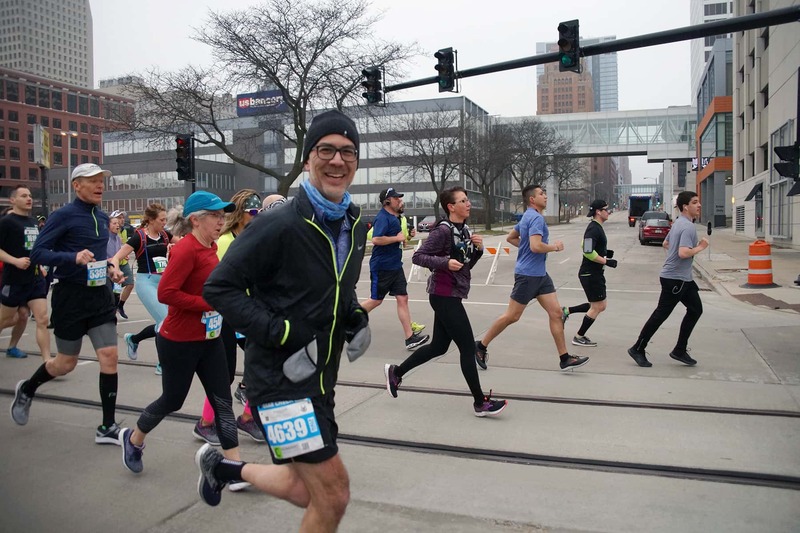 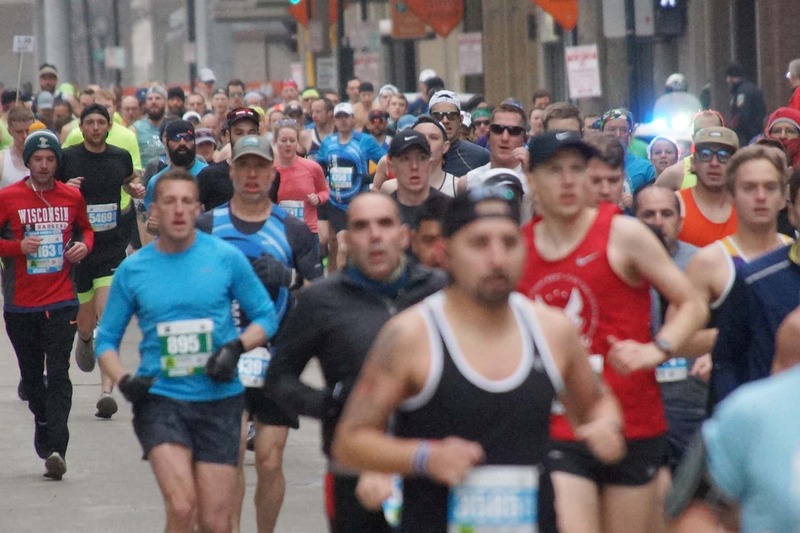 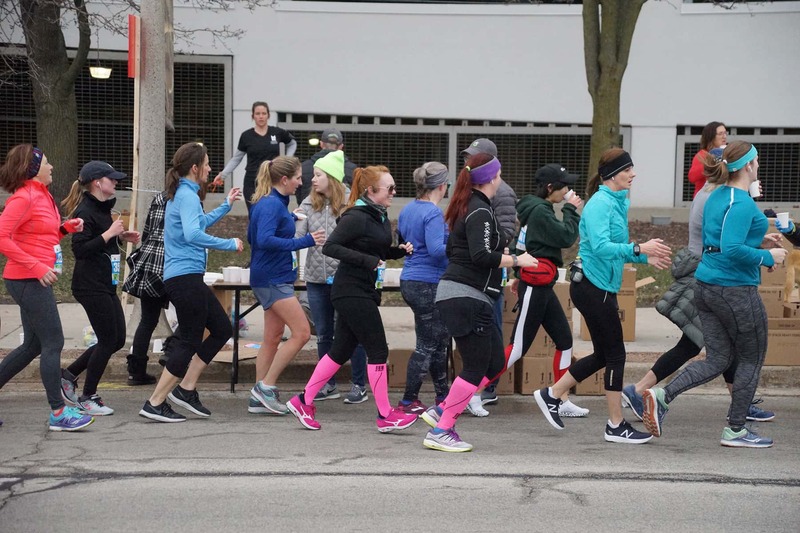 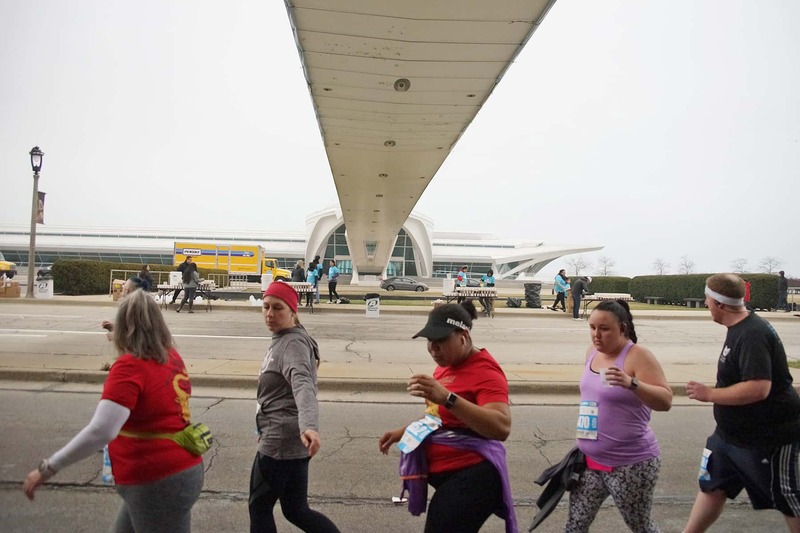 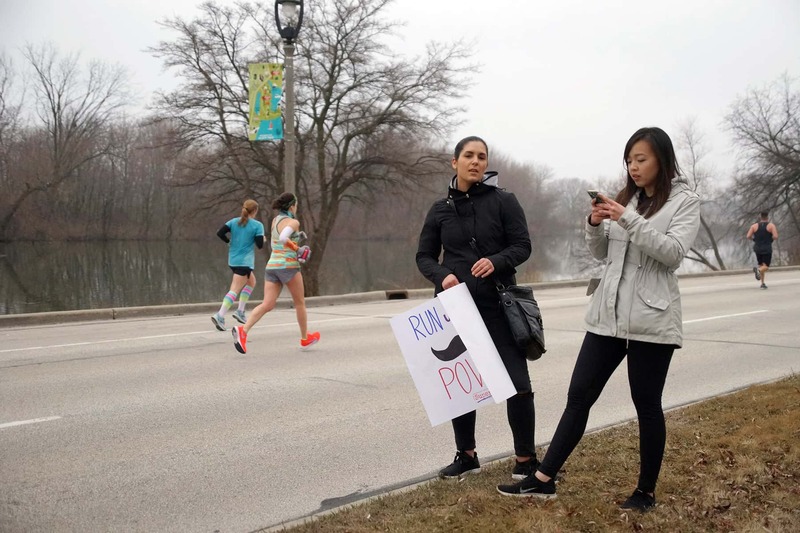 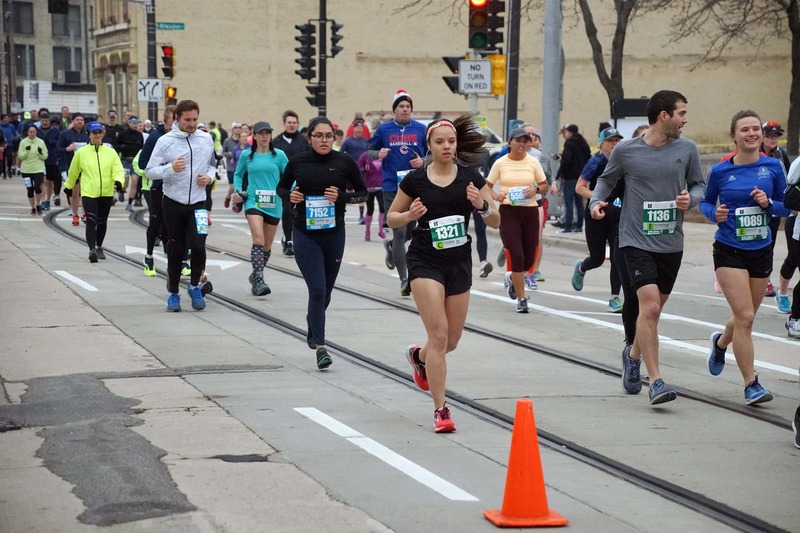 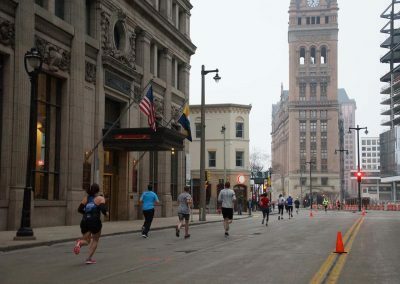 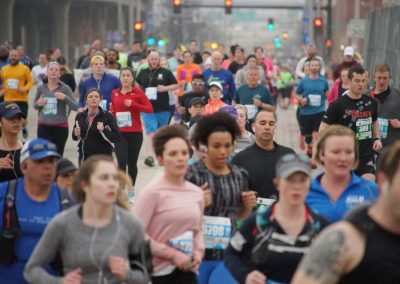 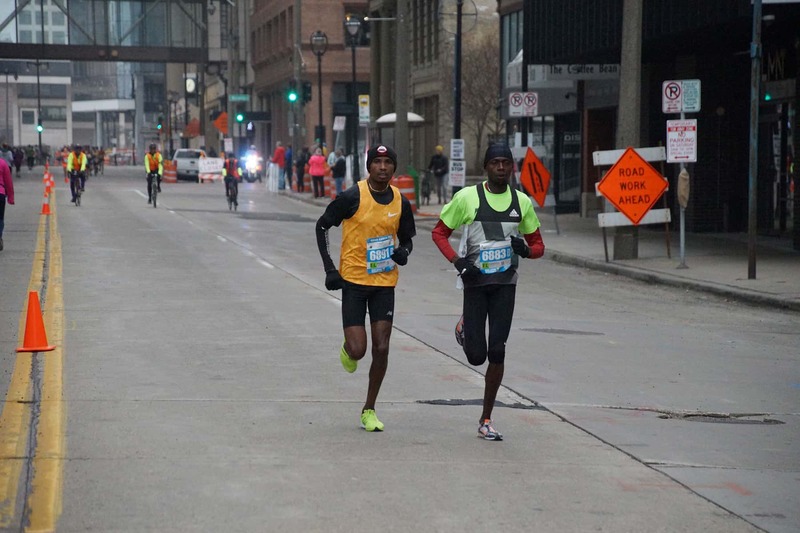 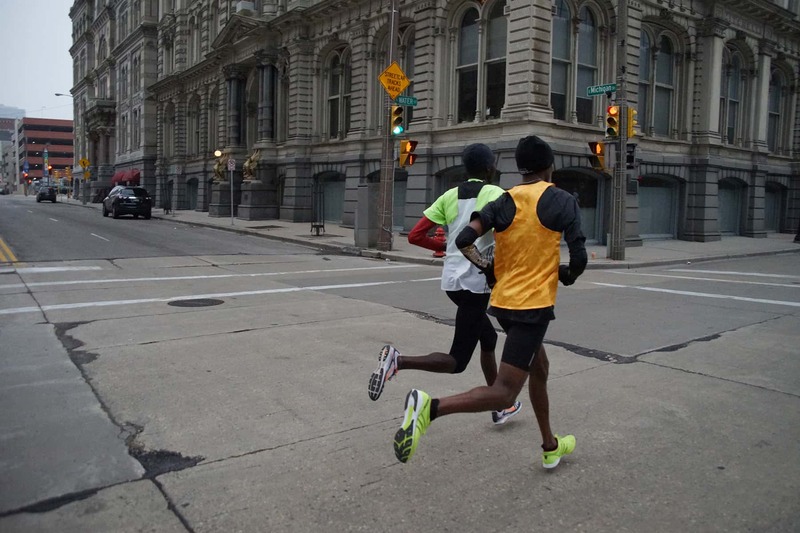 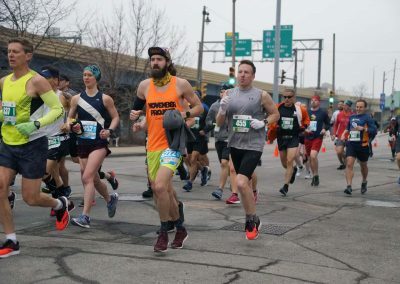 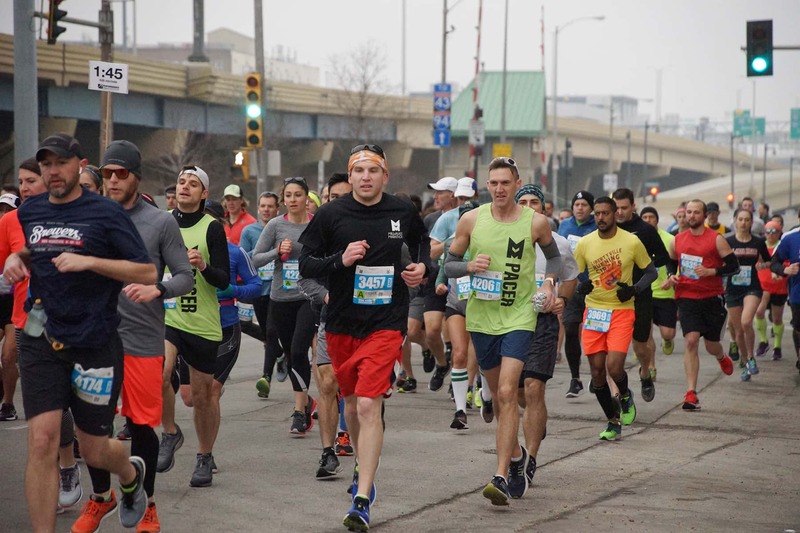 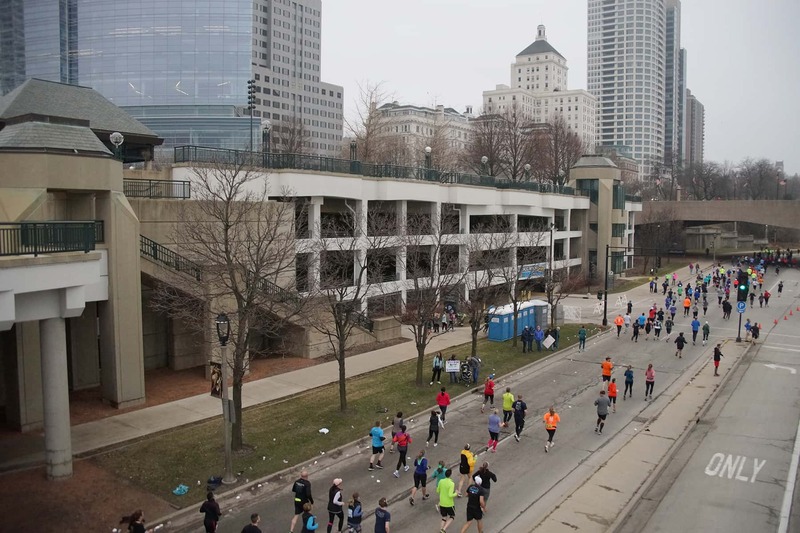 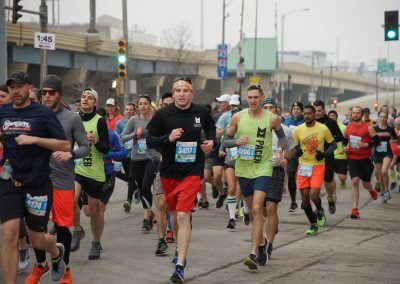 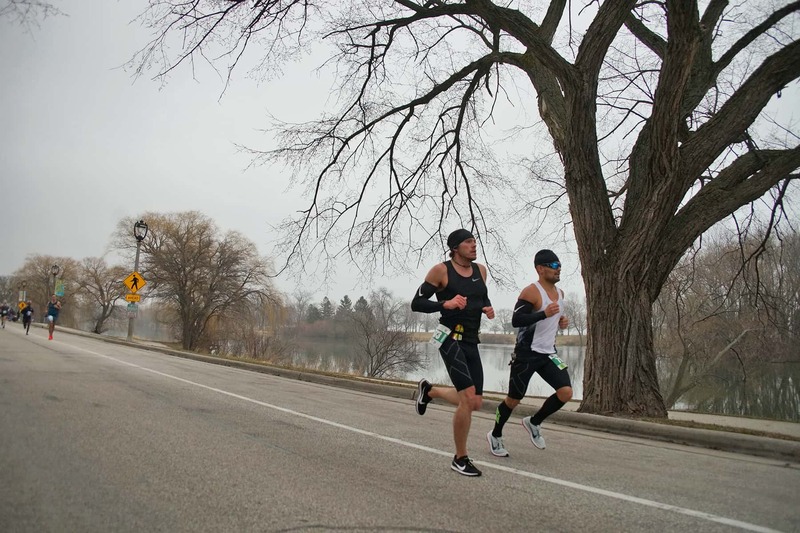 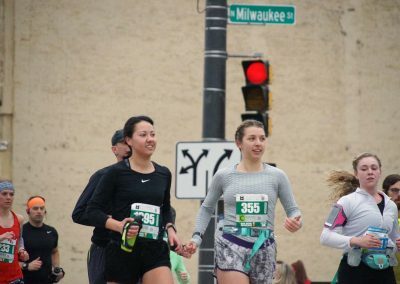 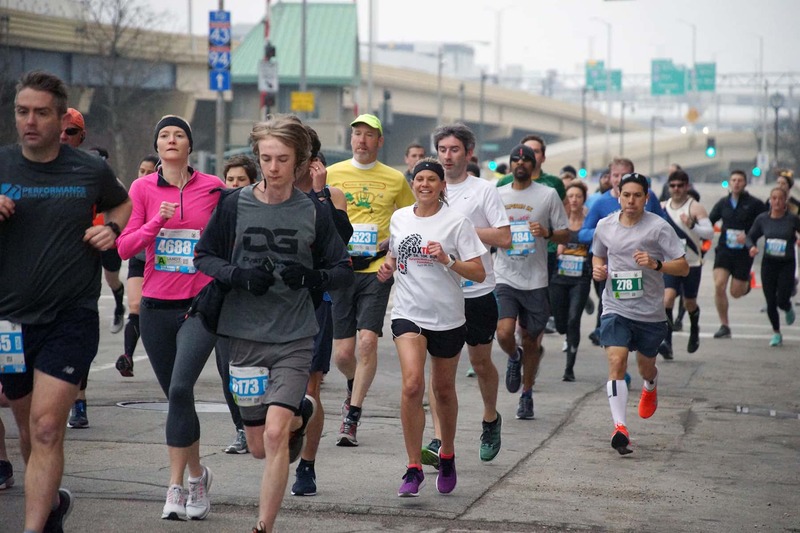 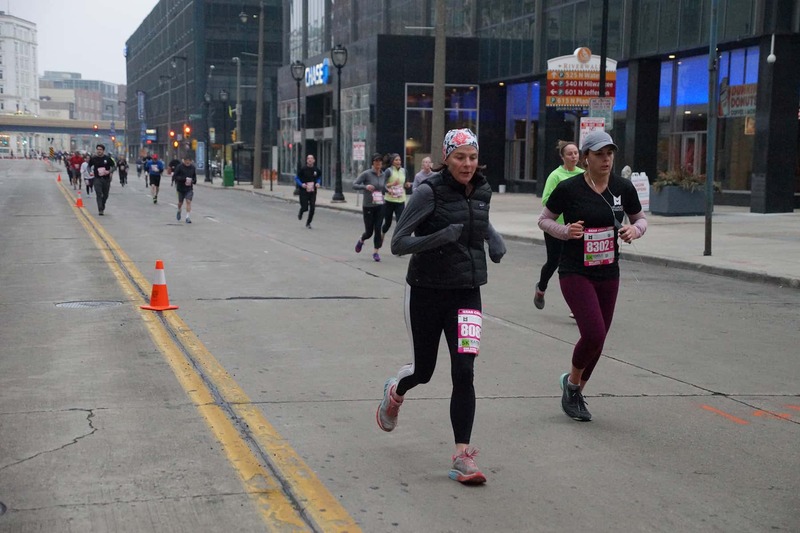 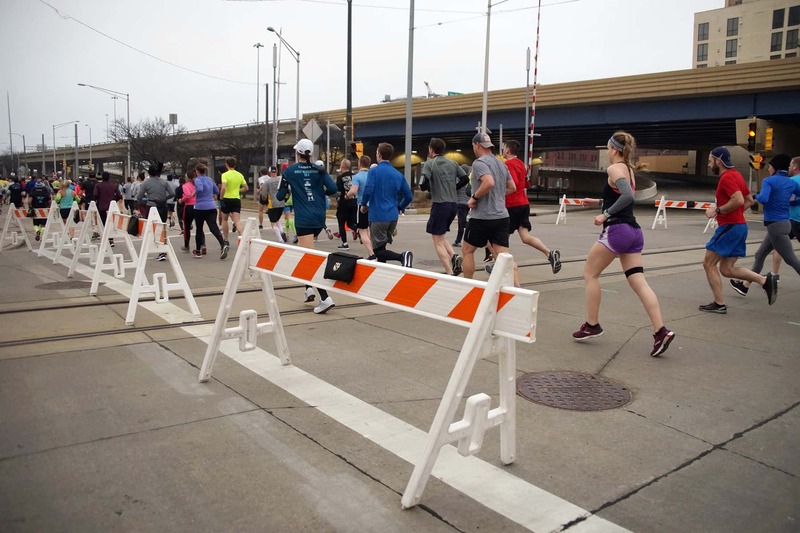 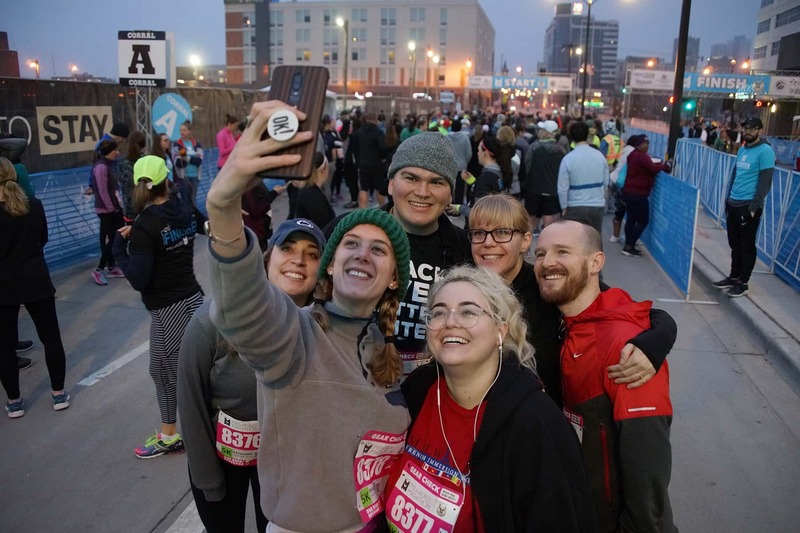 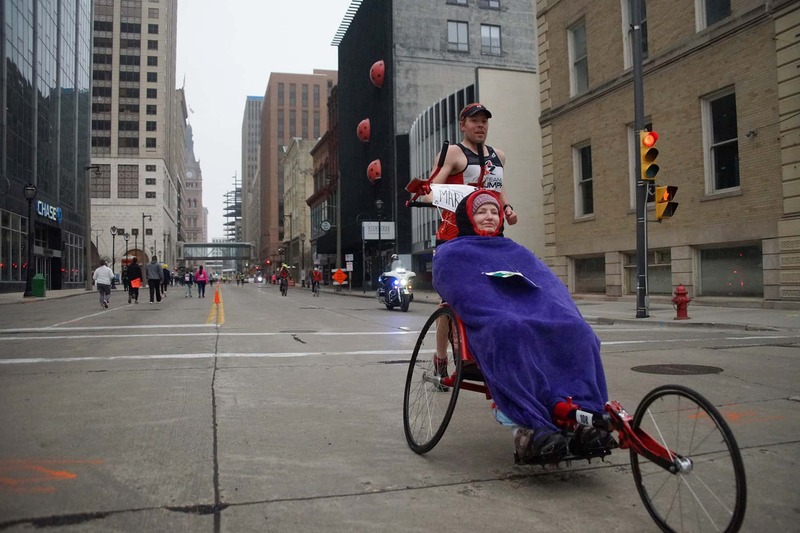 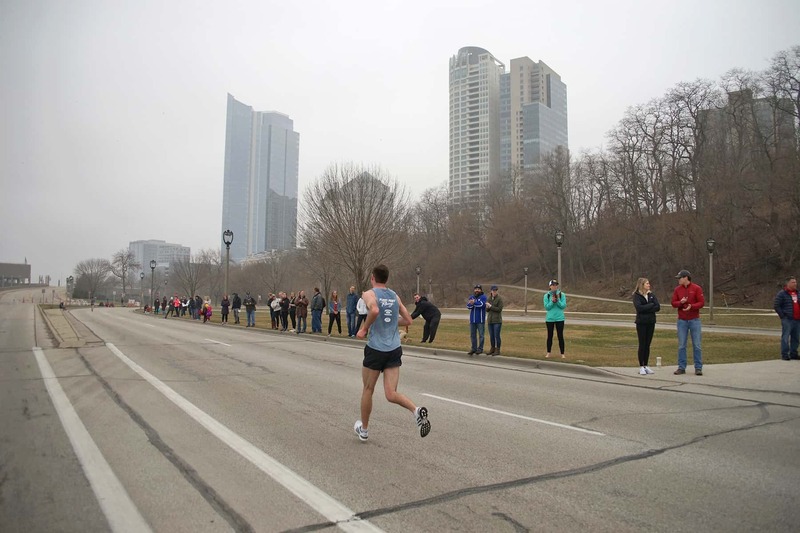 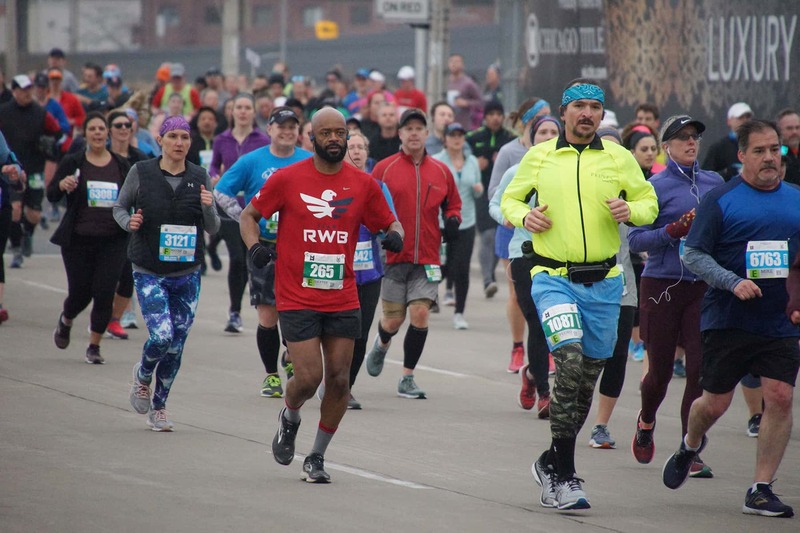 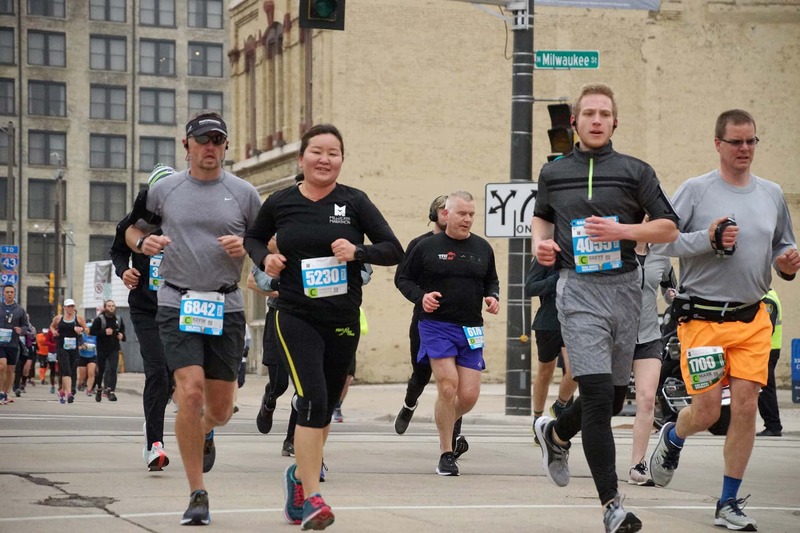 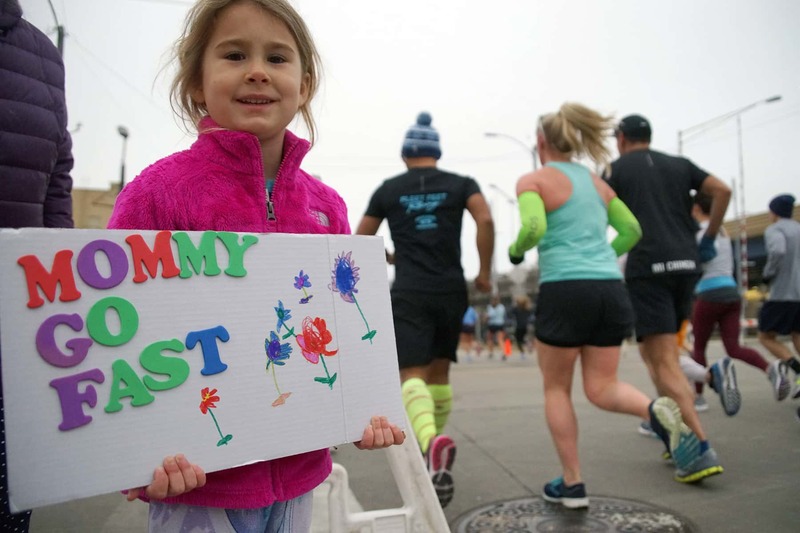 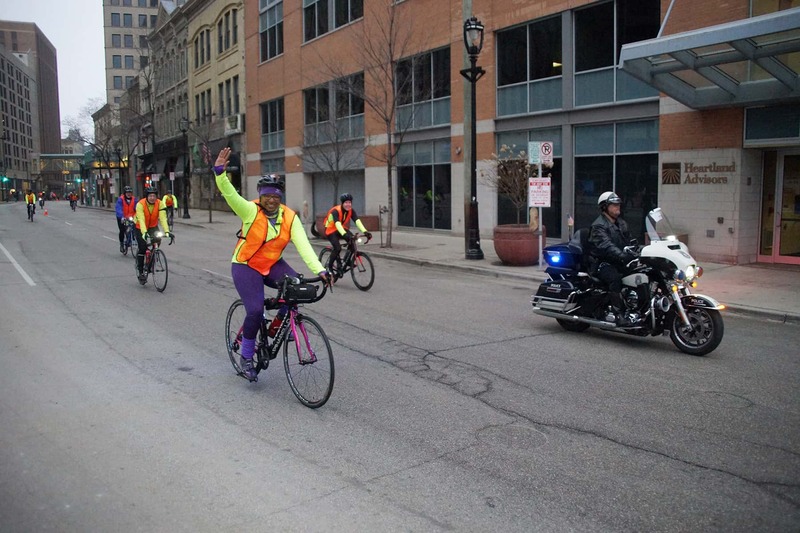 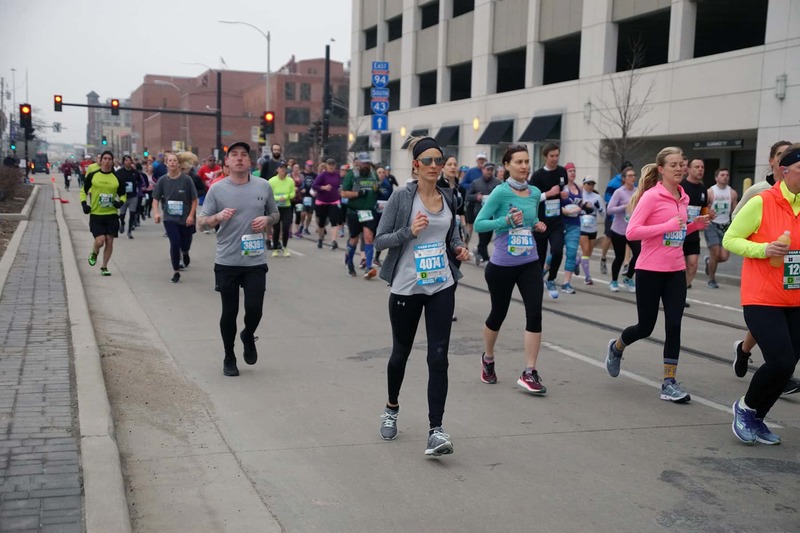 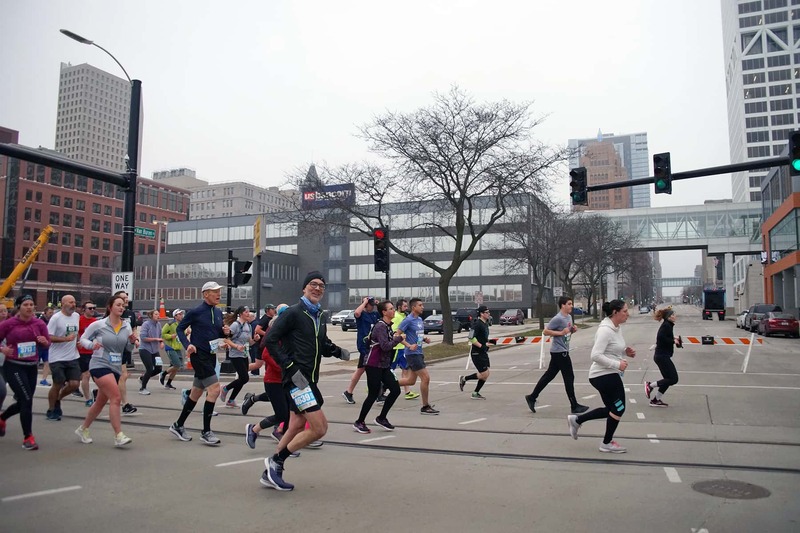 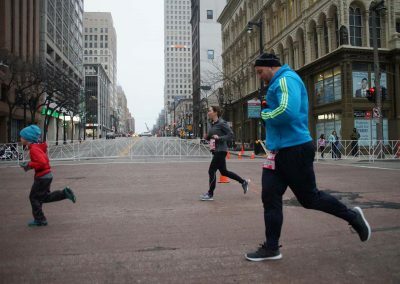 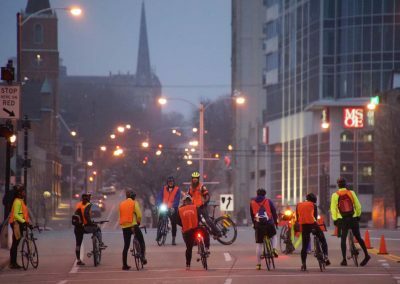 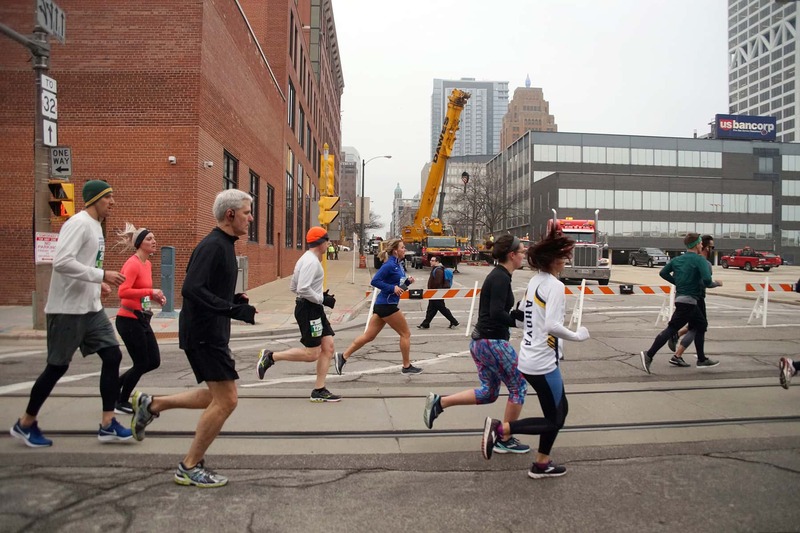 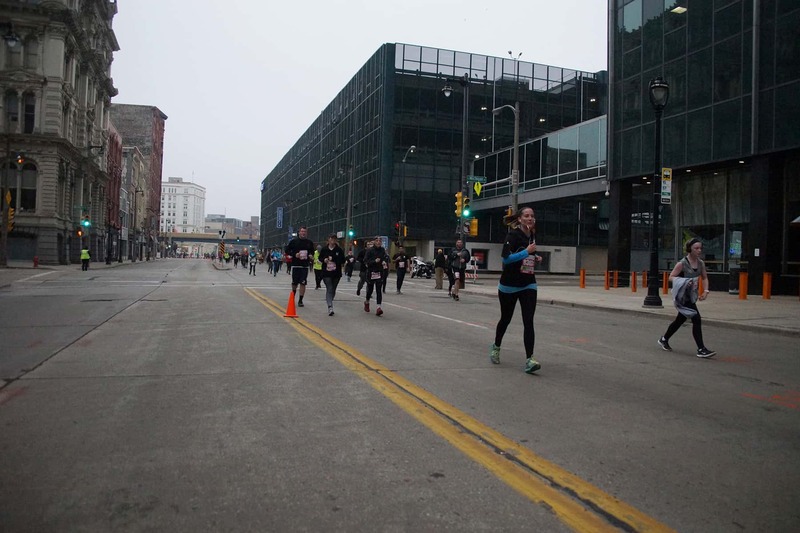 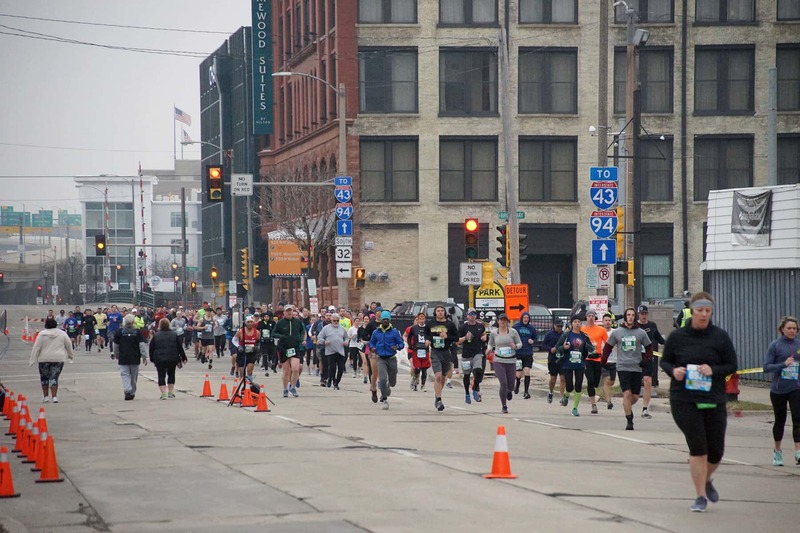 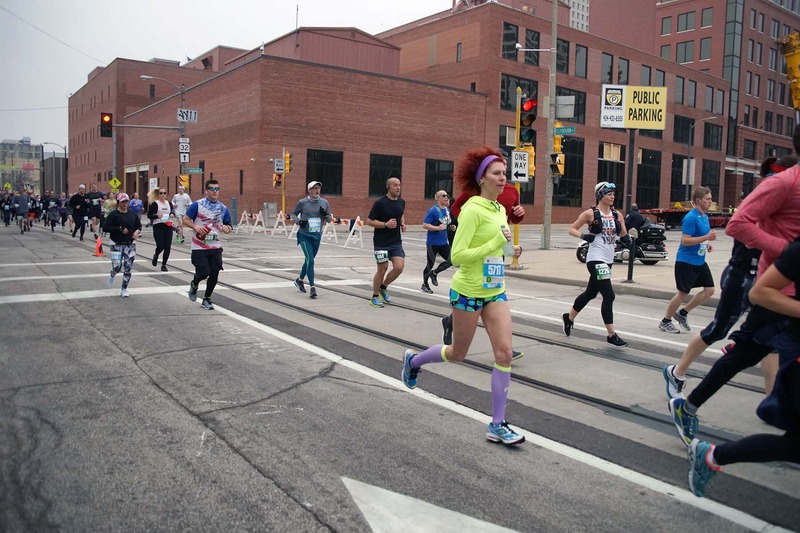 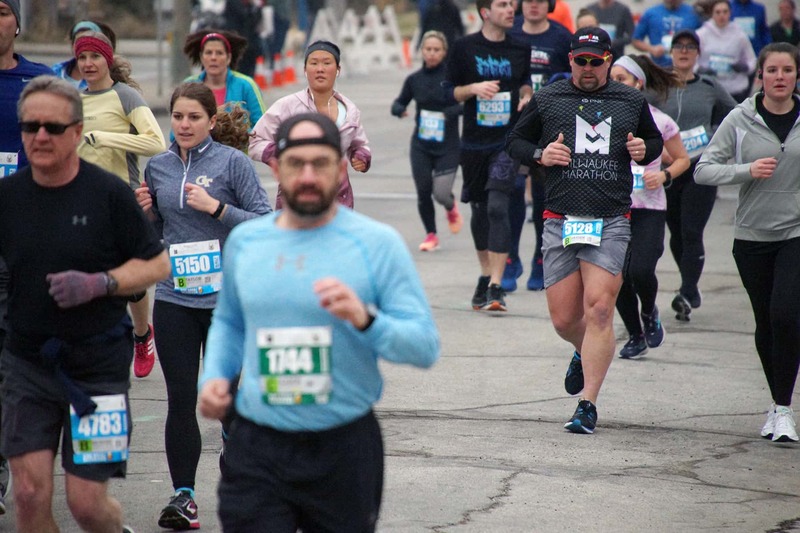 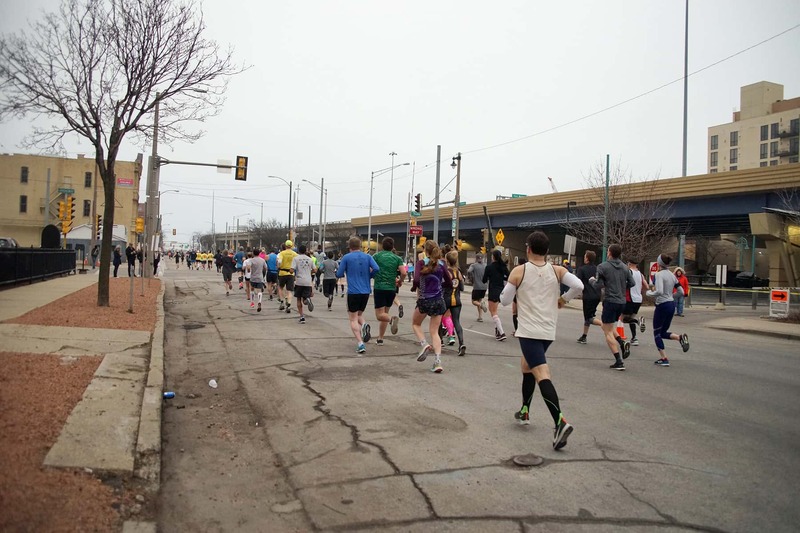 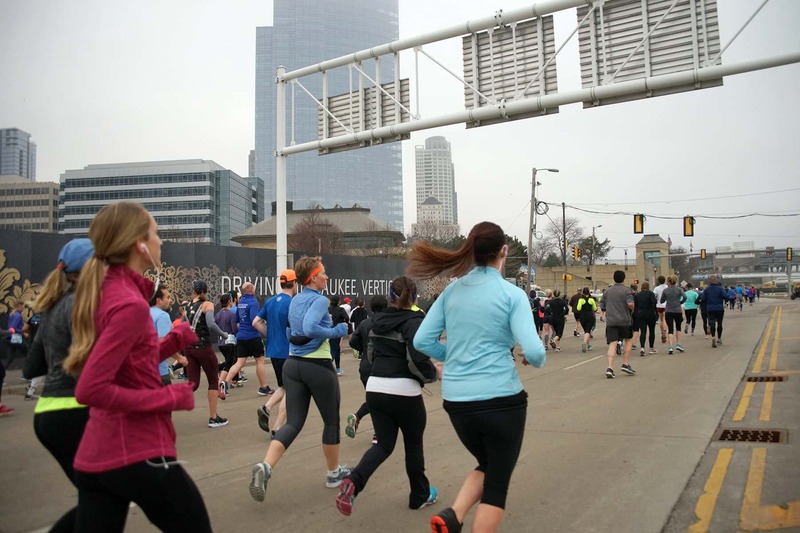 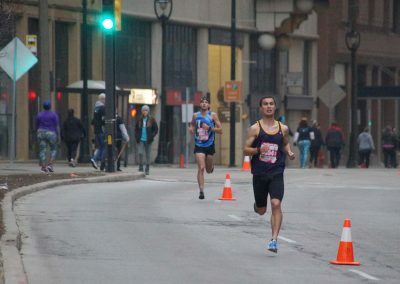 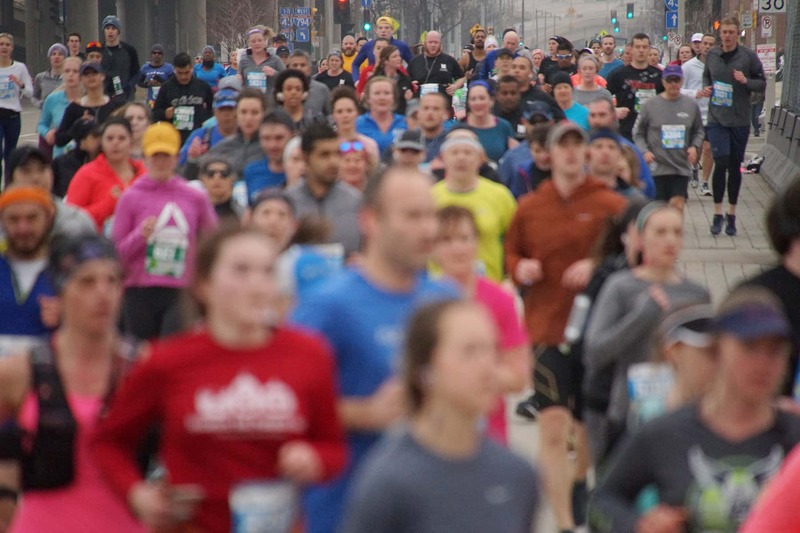 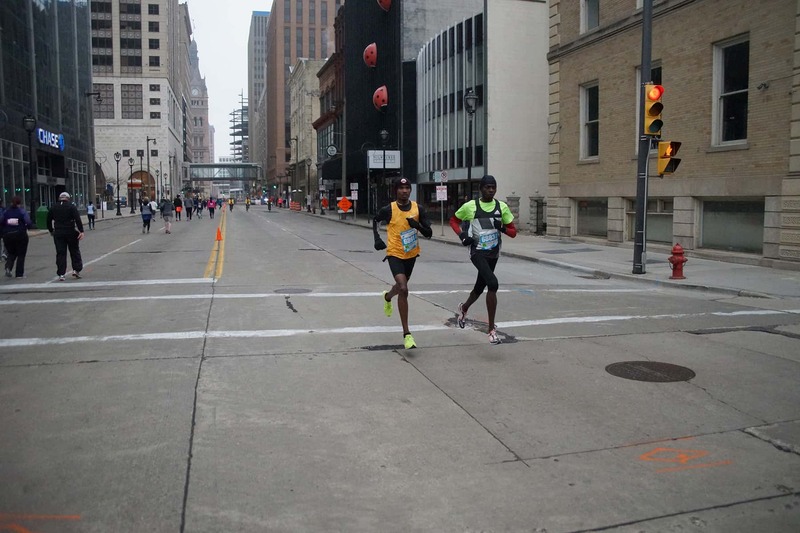 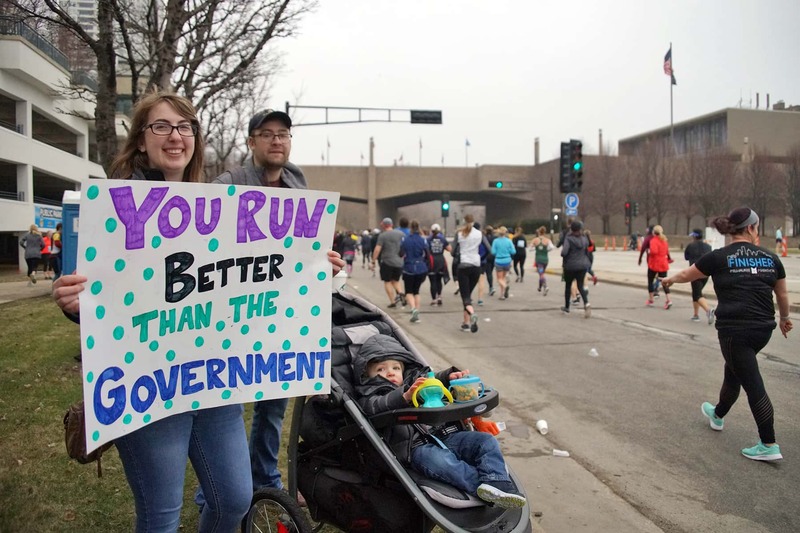 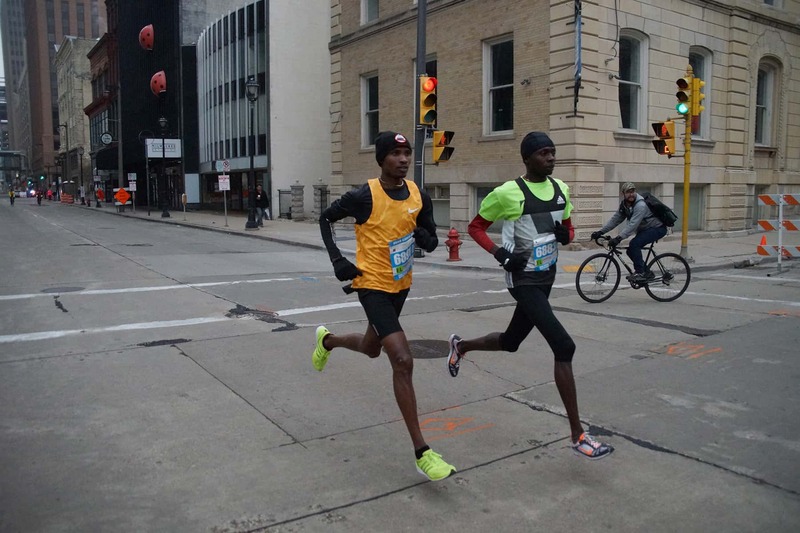 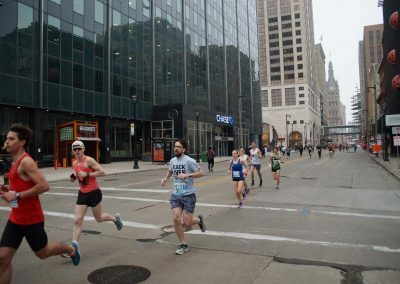 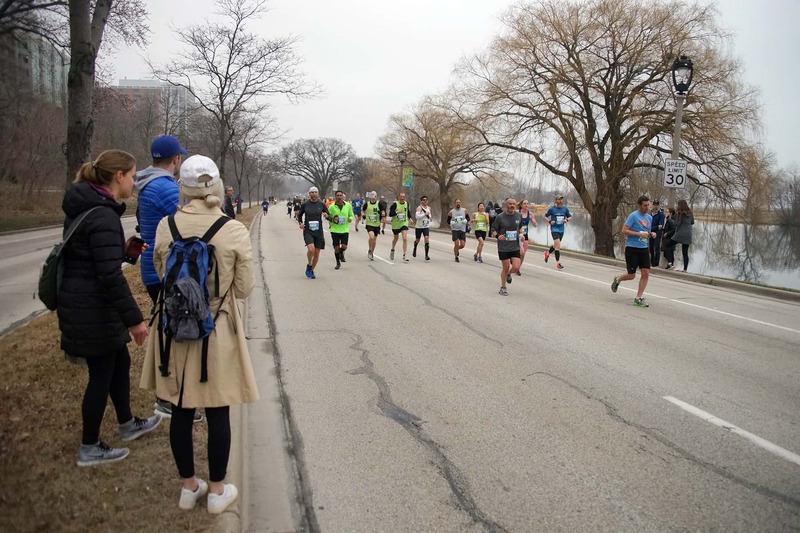 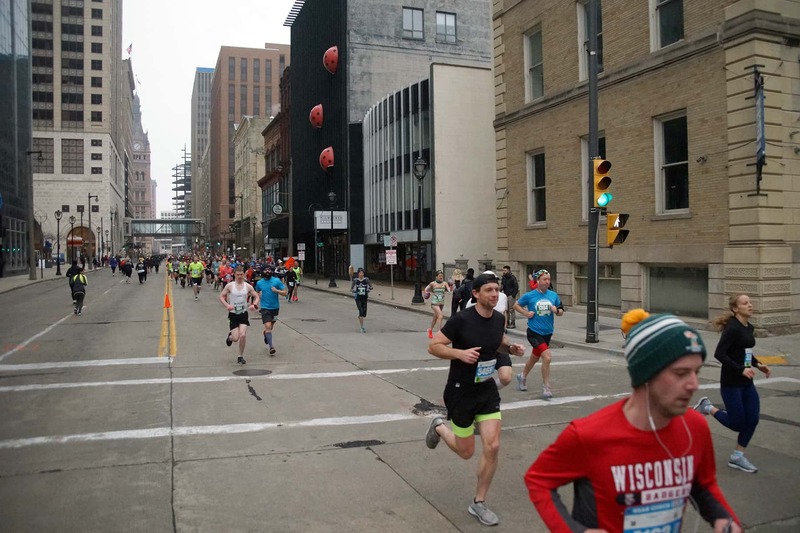 After twice measuring the route incorrectly, a monumental gaff that prevented participating runners from using the race a qualifier for larger competitions, the Milwaukee Marathon was back on track for its 2019 race on April 6. 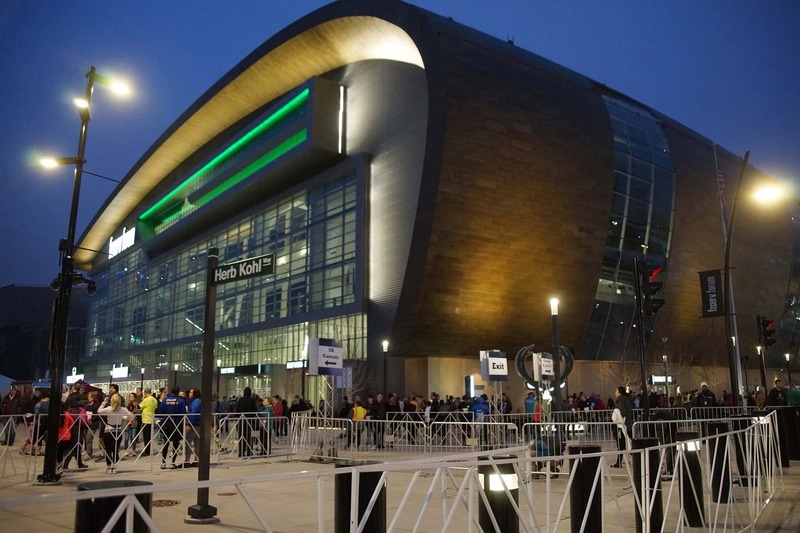 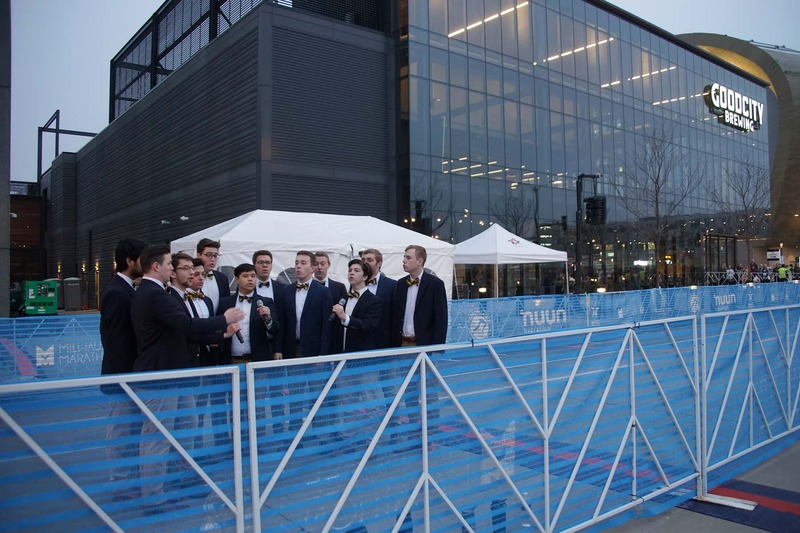 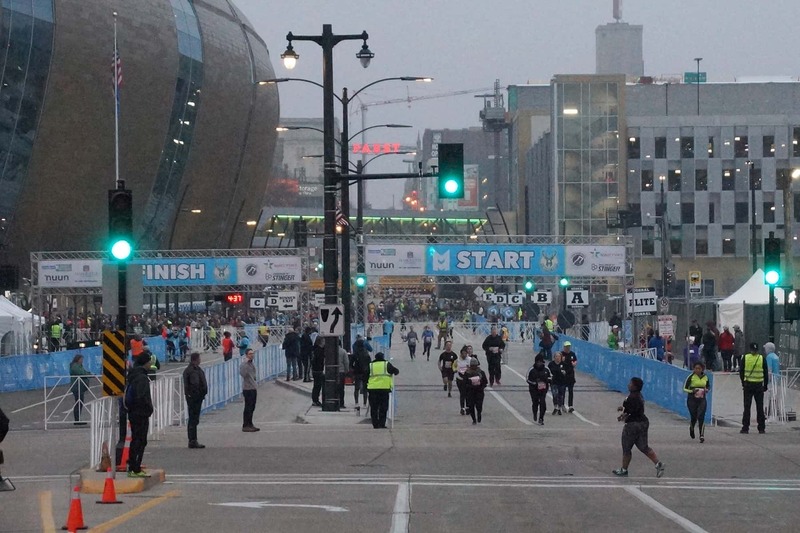 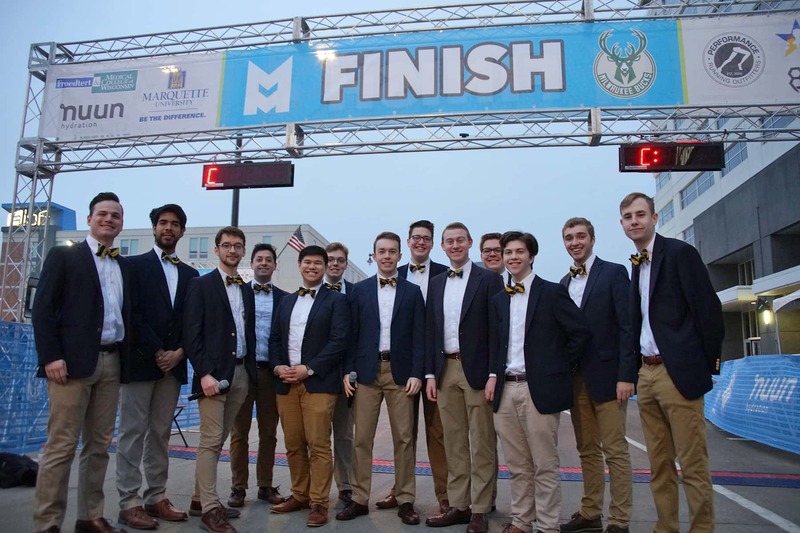 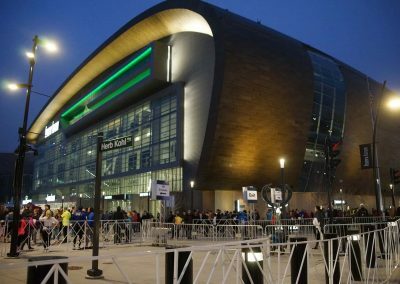 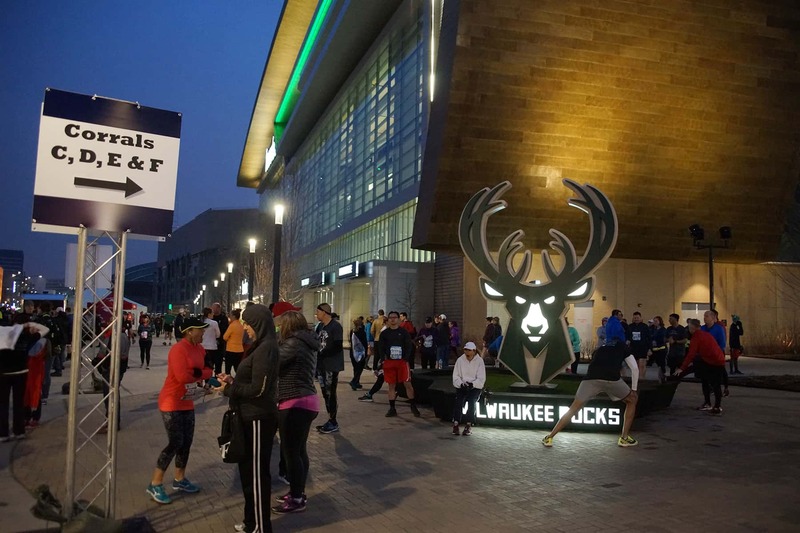 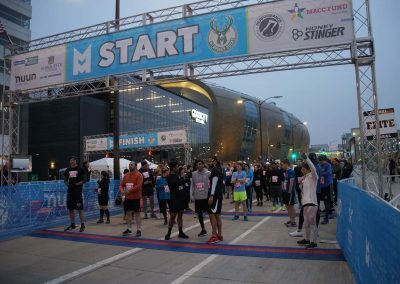 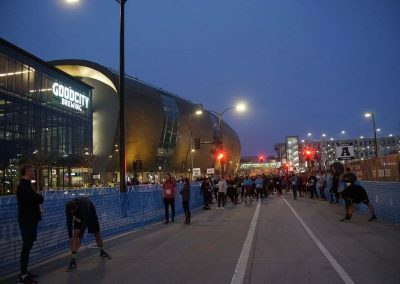 The Milwaukee Bucks presented the race this year, after the marathon was cancelled in 2018, with the course starting and finishing at Fiserv Forum. 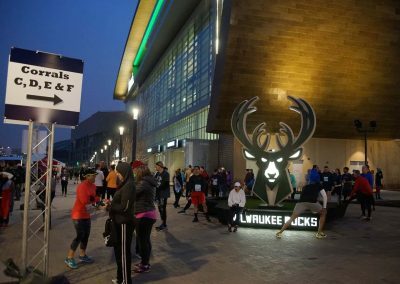 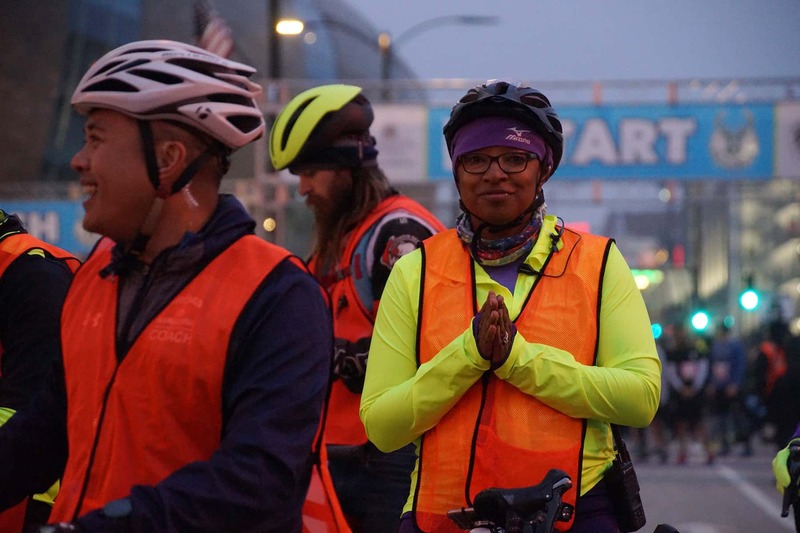 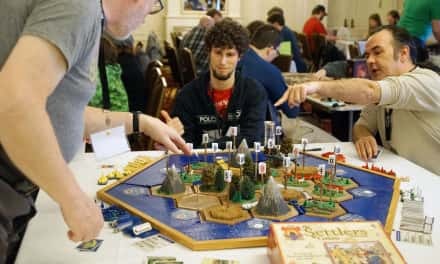 The Bucks brought in a nationally known operator to run the event and the new organizer, Rugged Races, promised to make everything right this time. 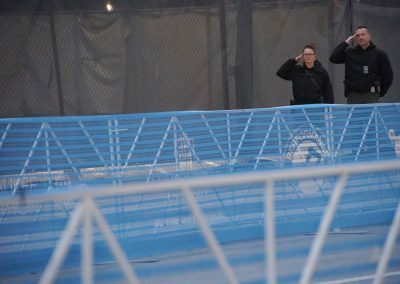 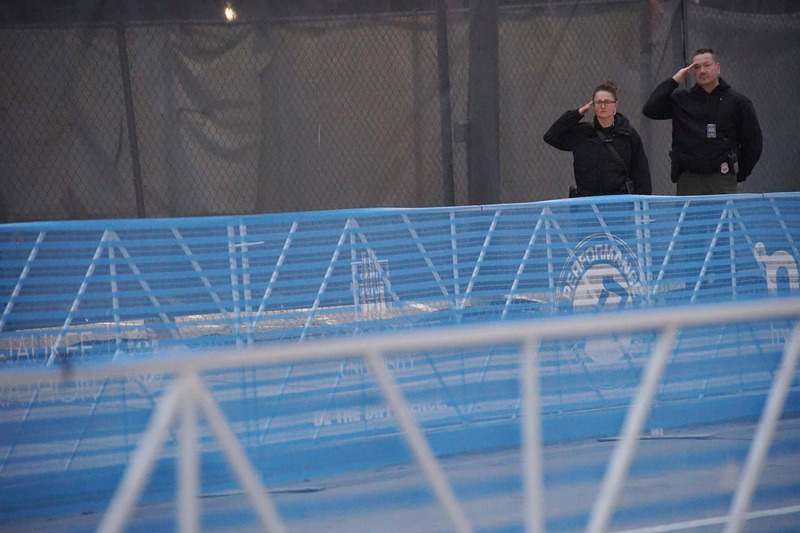 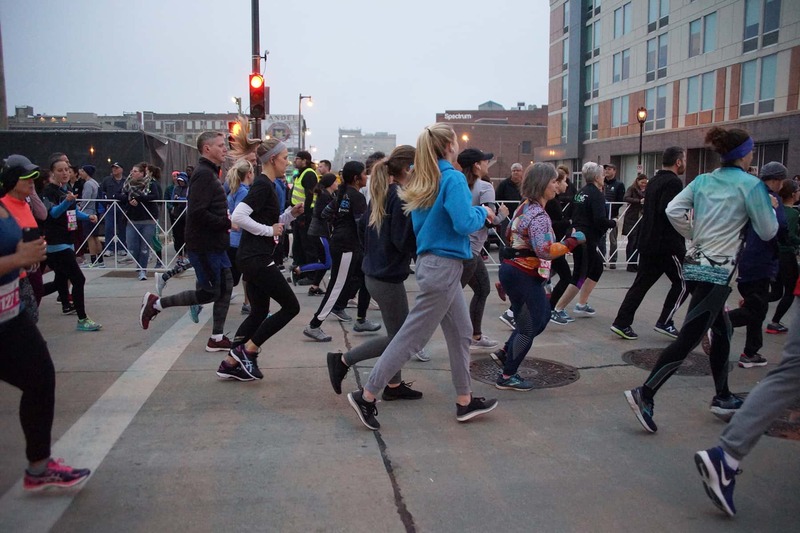 Many regional athletes came to depended on the marathon as a Boston qualifier when it launched in 2015 with 3,700 runners, so it was important that the USA Track & Field (USATF) organization certified the course this year. 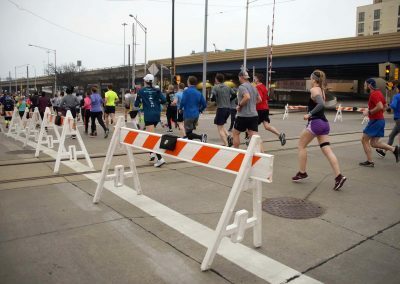 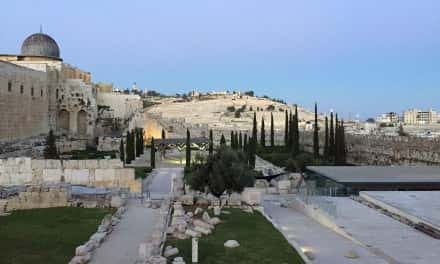 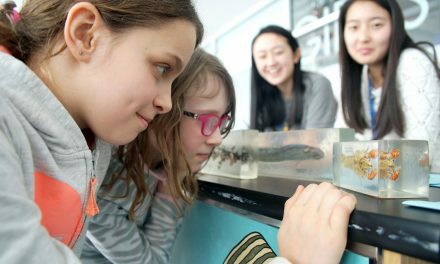 After the problems of 2016 and 2017, with incorrect distances and poor communications about traffic routes and road closures, the event became a cautionary tale. 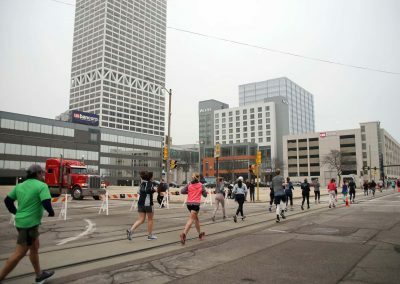 More than 7,500 runners passed through the city while participating in the Milwaukee Marathon, with at 26.2 mile route that stretched between the lakefront and Sherman Park. 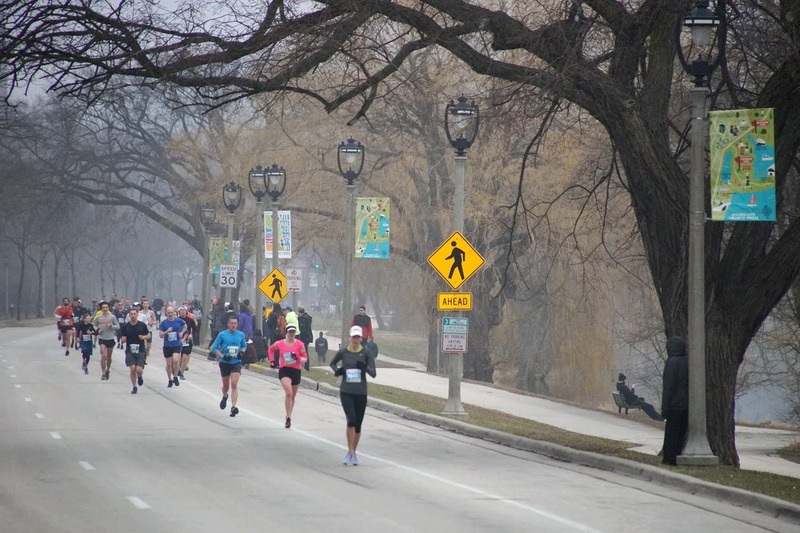 The 5K and half marathon races were confined to the eastern segment of the route due to their lesser distances. 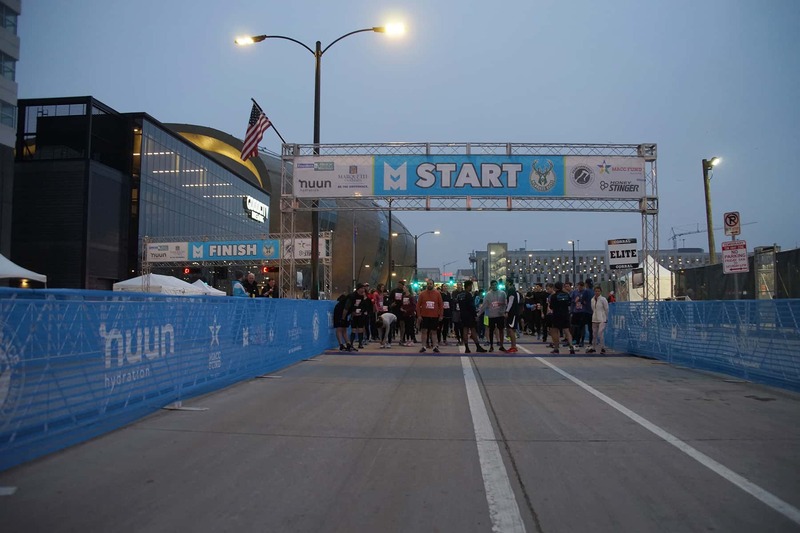 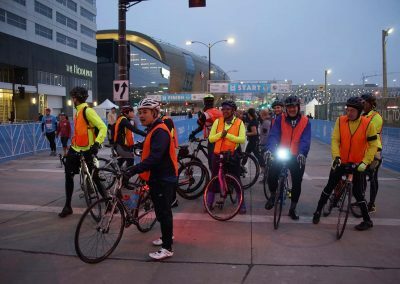 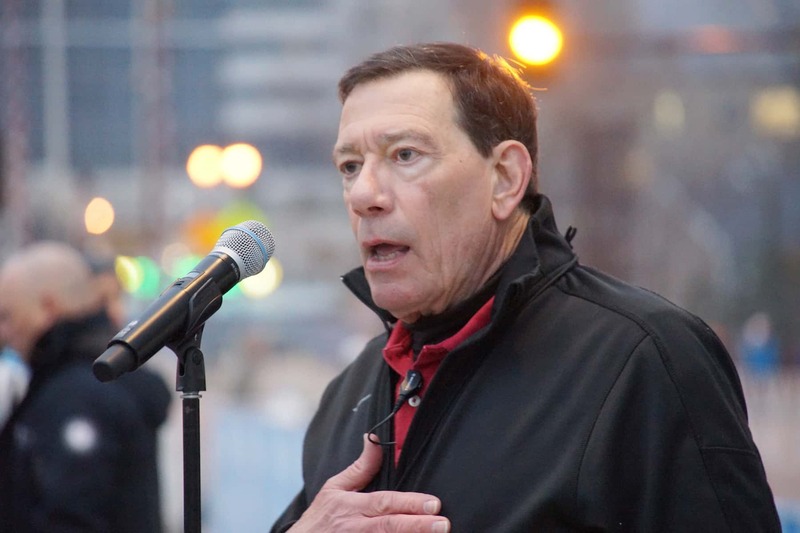 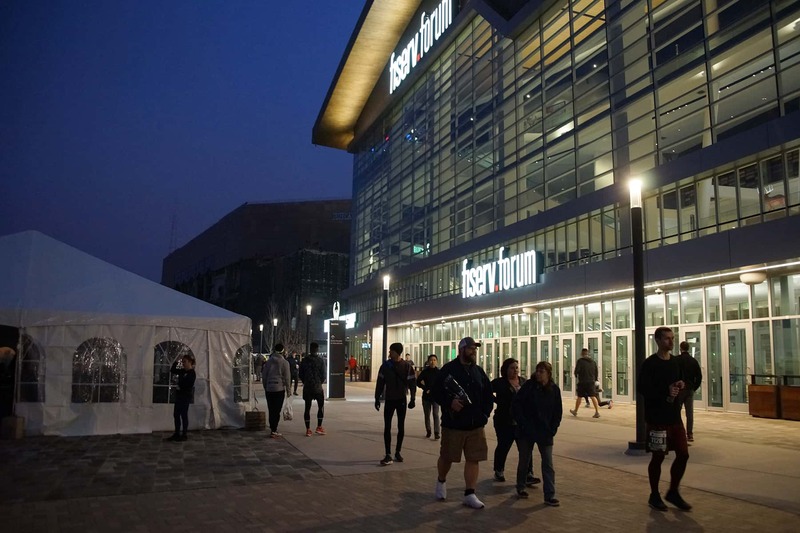 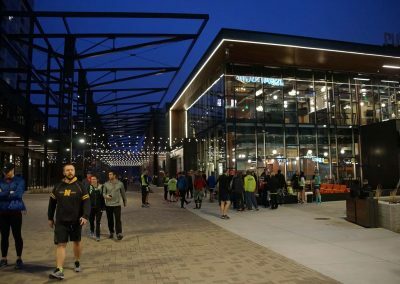 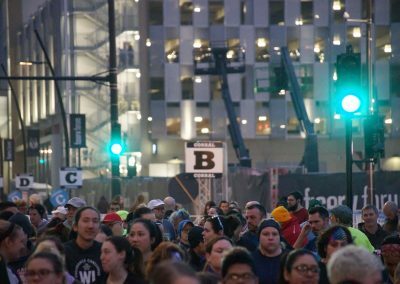 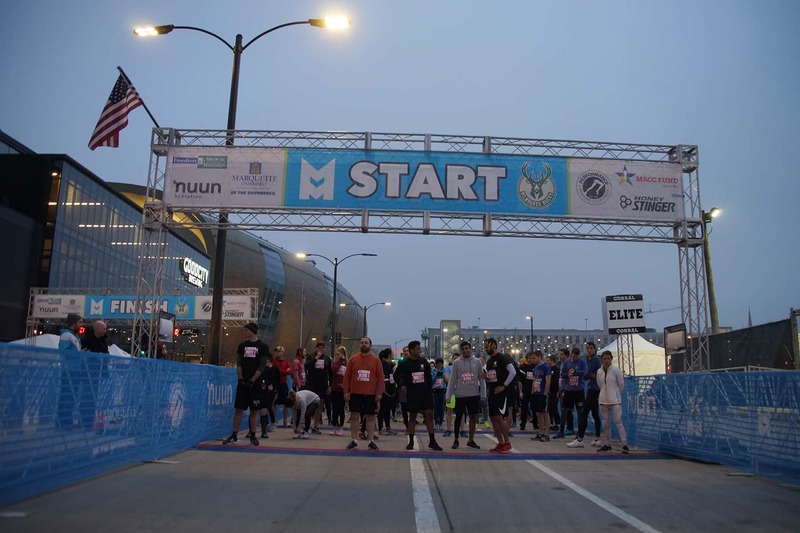 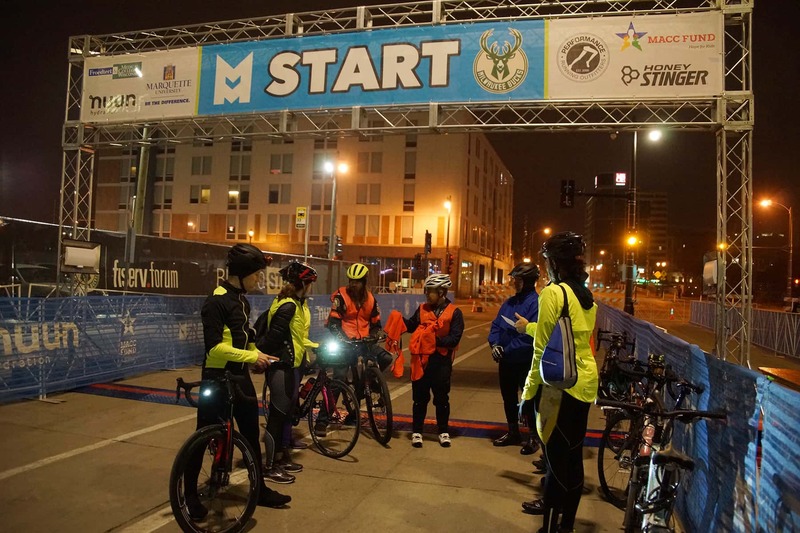 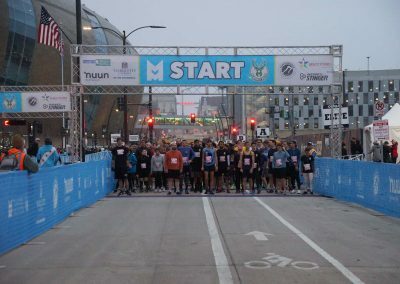 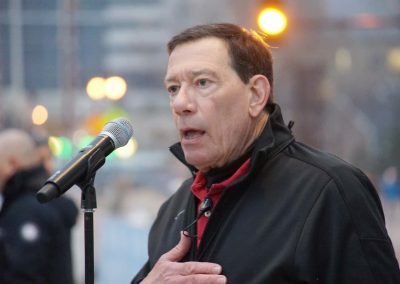 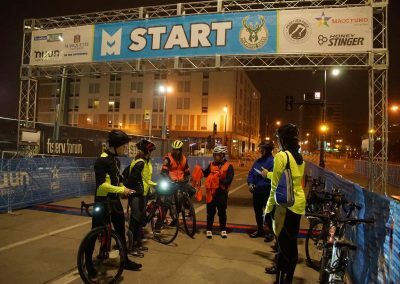 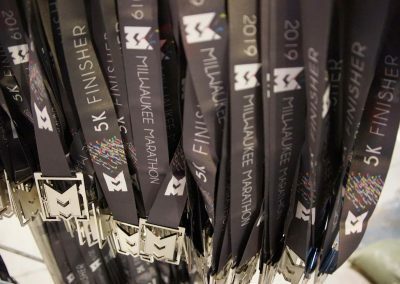 “The Milwaukee Marathon is an inspirational event, and the Bucks are excited to be a part of this new annual tradition by hosting the start and finish on the plaza in front of Fiserv Forum,” said Michael Belot, Senior Vice President of Bucks Ventures and Development. 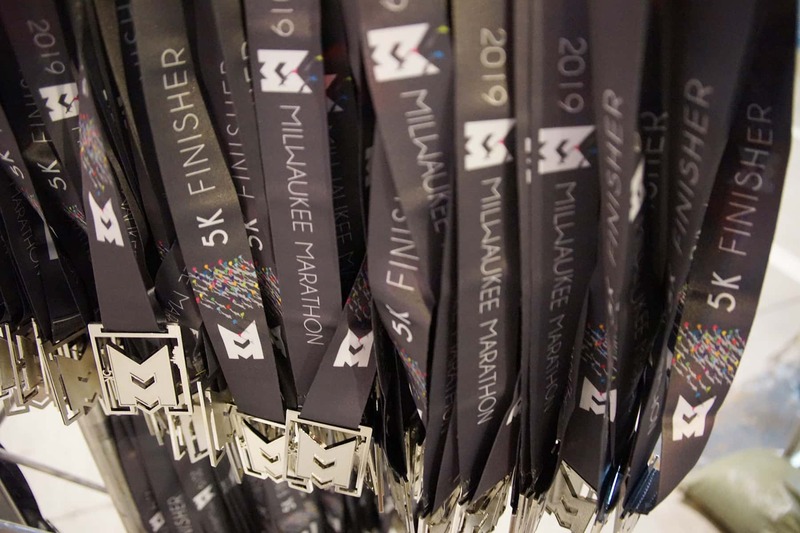 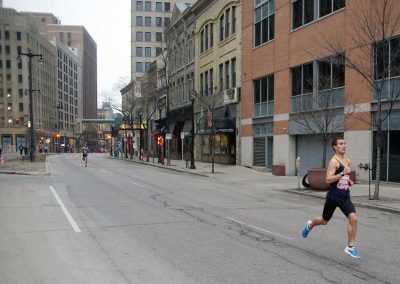 The Milwaukee Marathon is now owned and produced by Rugged Races, one of the largest endurance event companies in North America. 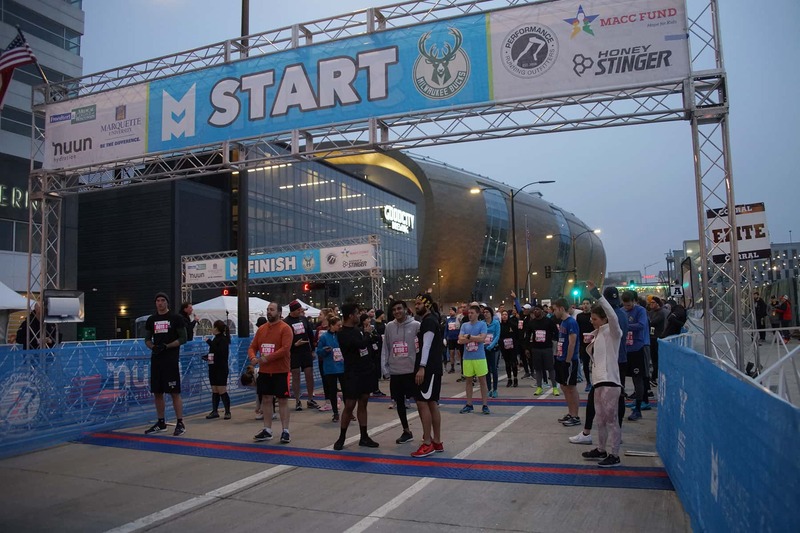 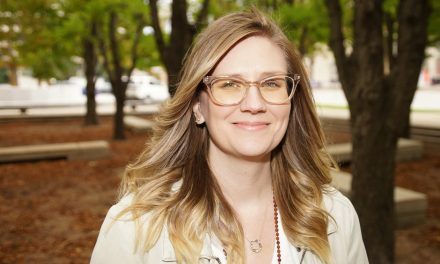 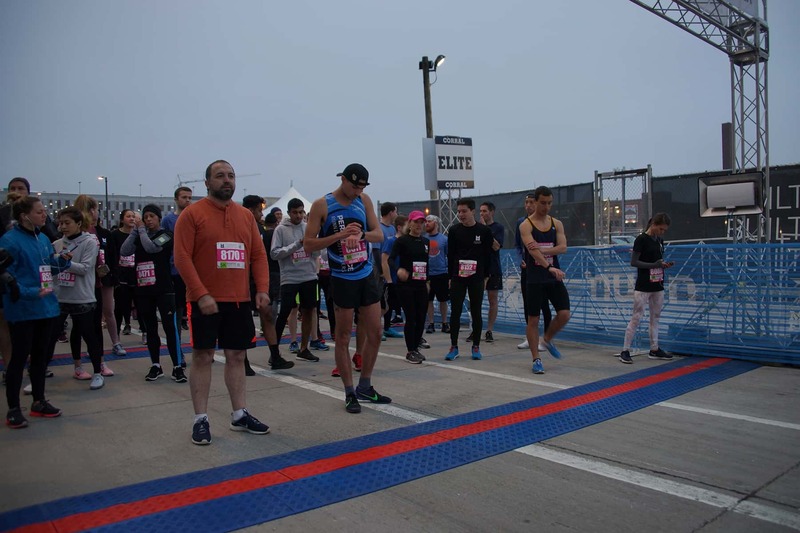 “Having support from the Bucks has been absolutely key to making this year’s event possible, as we continue to transform the race into a world-class event that all Wisconsinites can be proud of,” said Rob Dickens, Senior Vice President of Rugged Races. 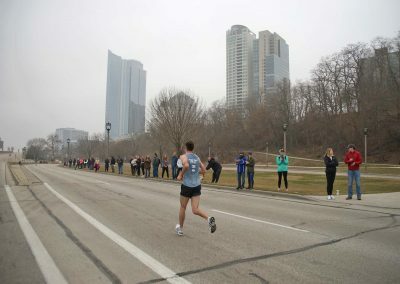 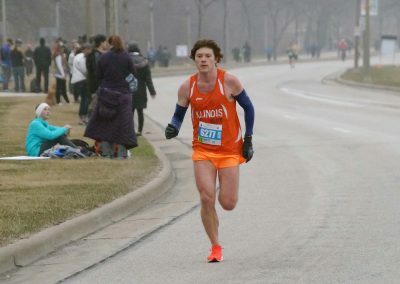 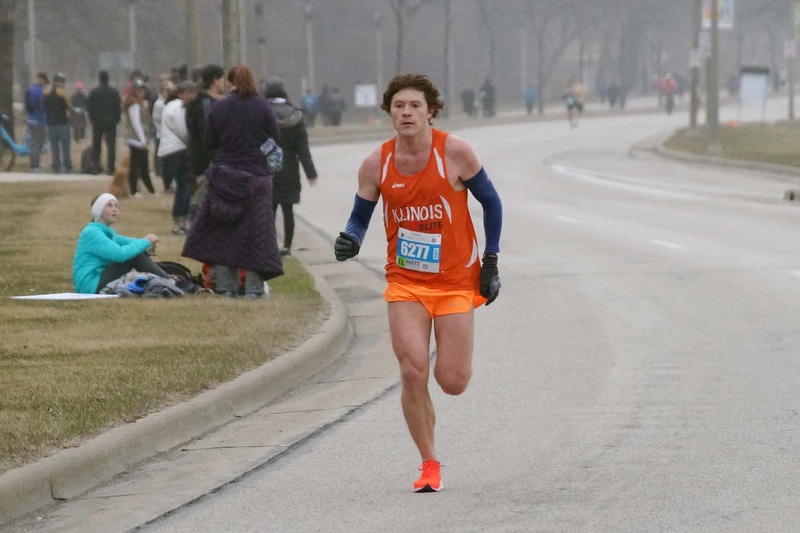 Milwaukee native Martin Erl earned a number 1 ranking with the best time of 2:24:26 for the full marathon. 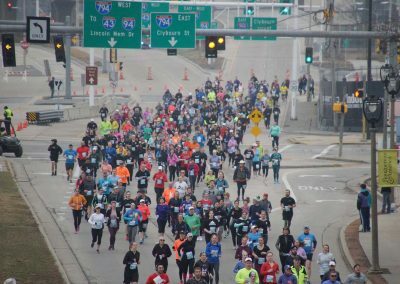 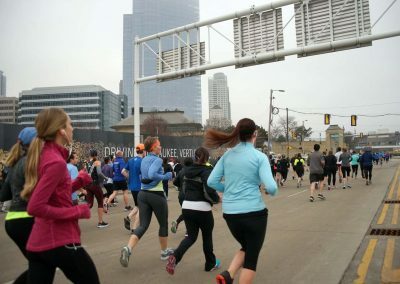 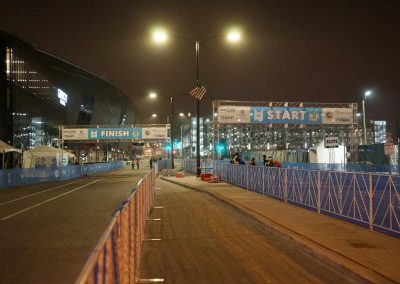 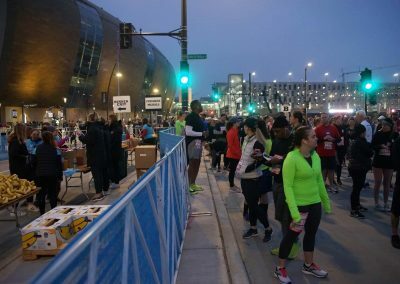 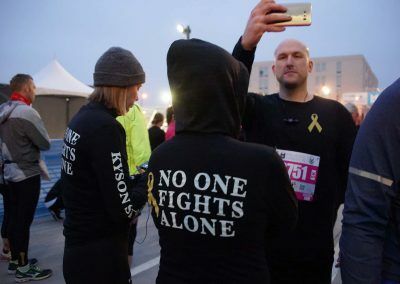 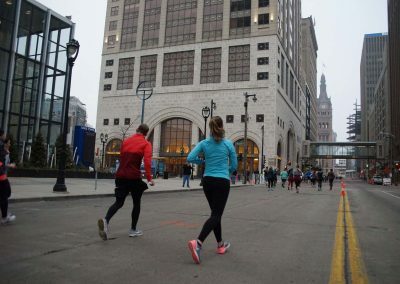 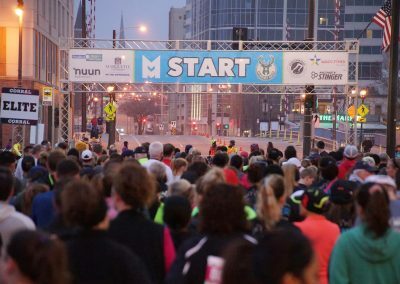 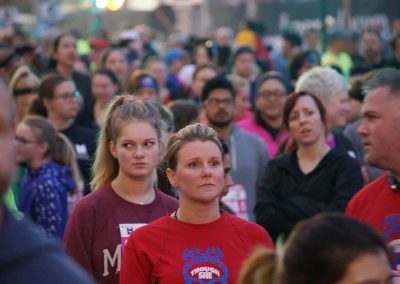 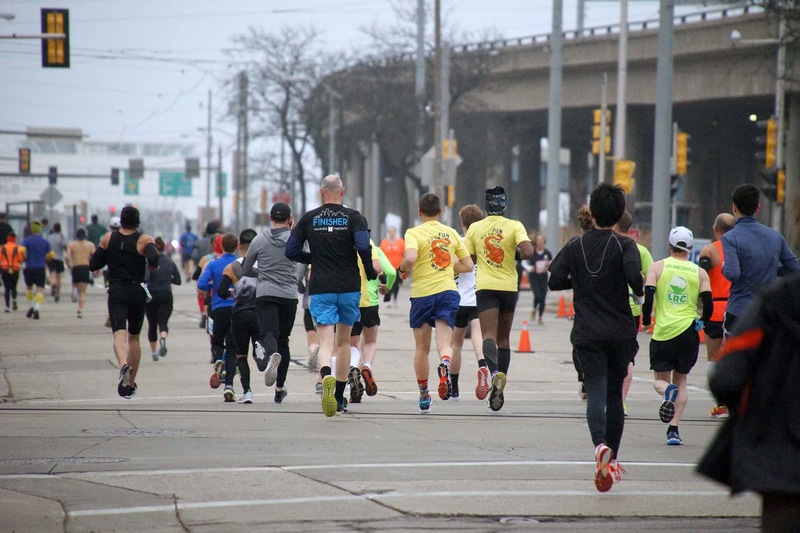 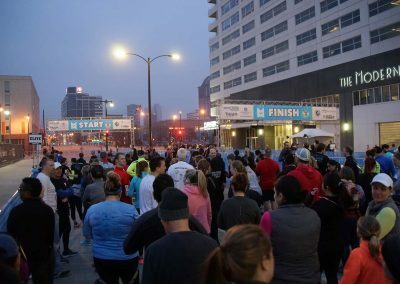 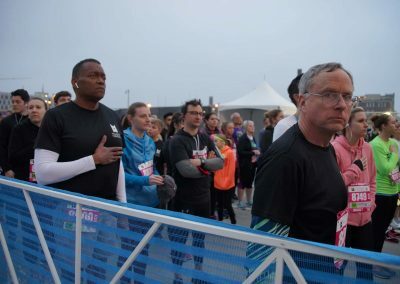 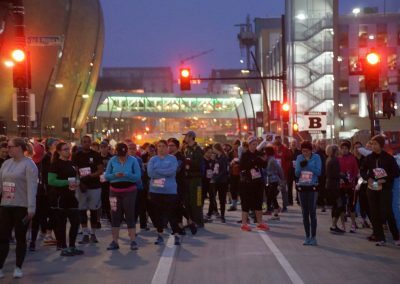 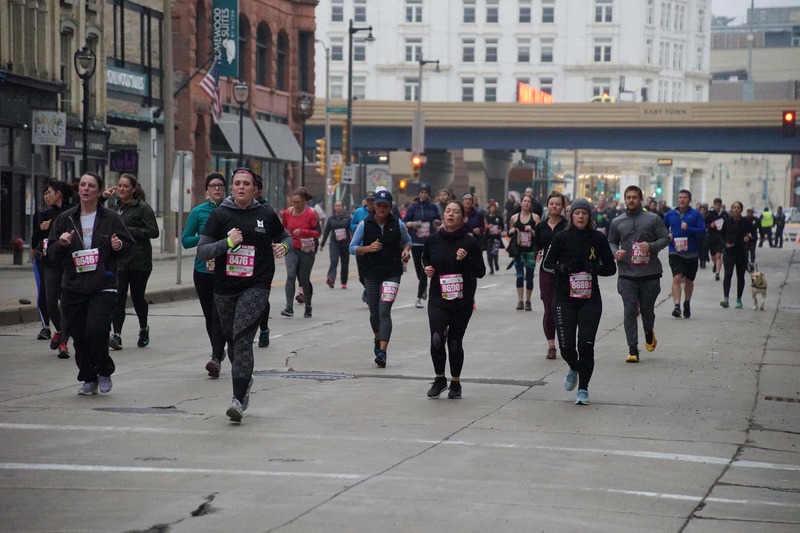 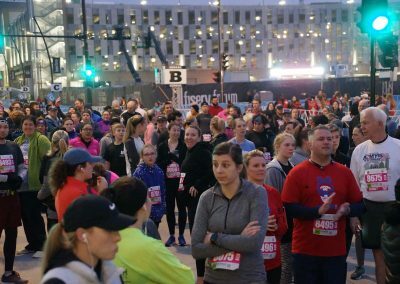 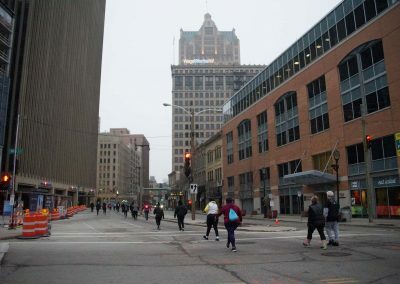 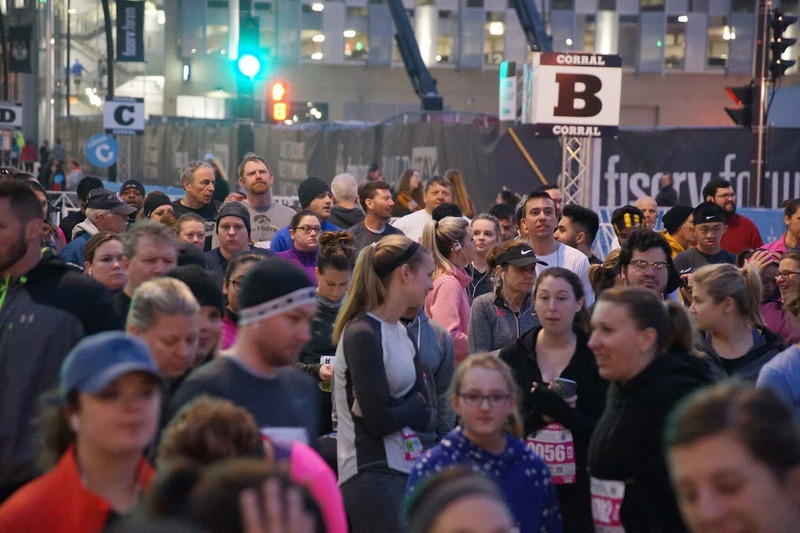 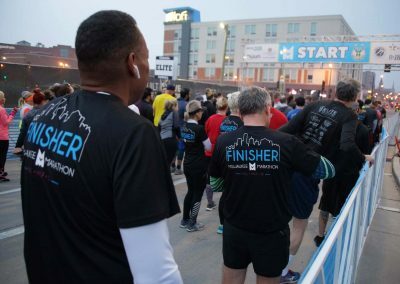 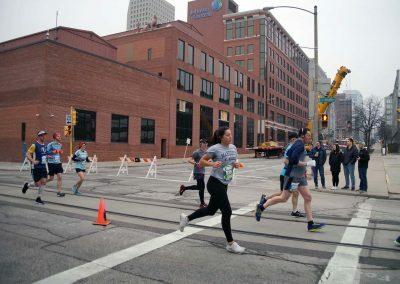 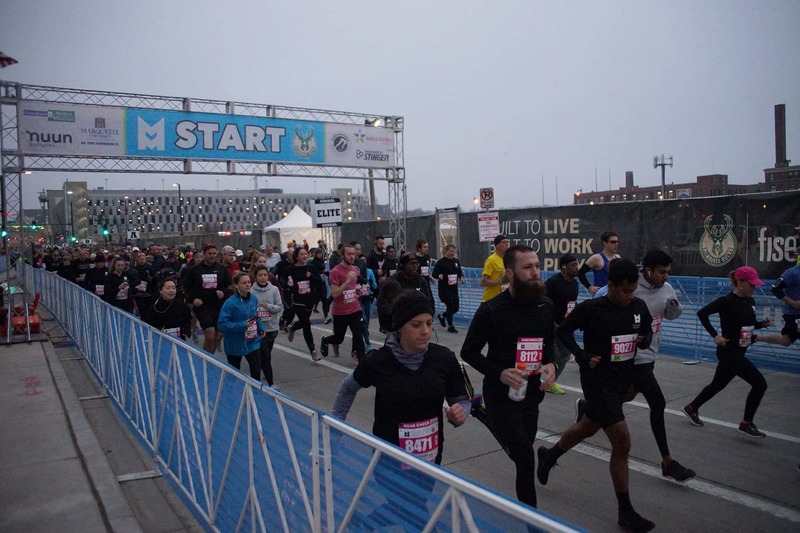 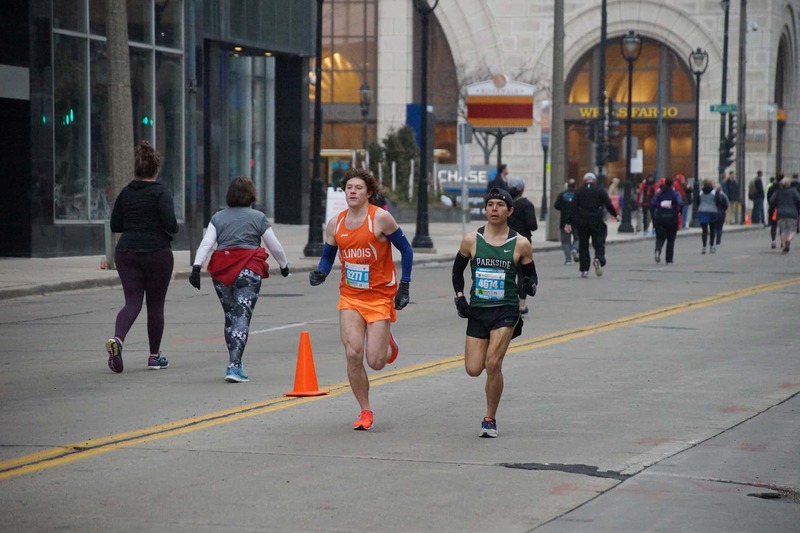 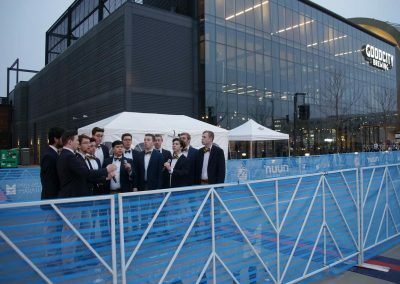 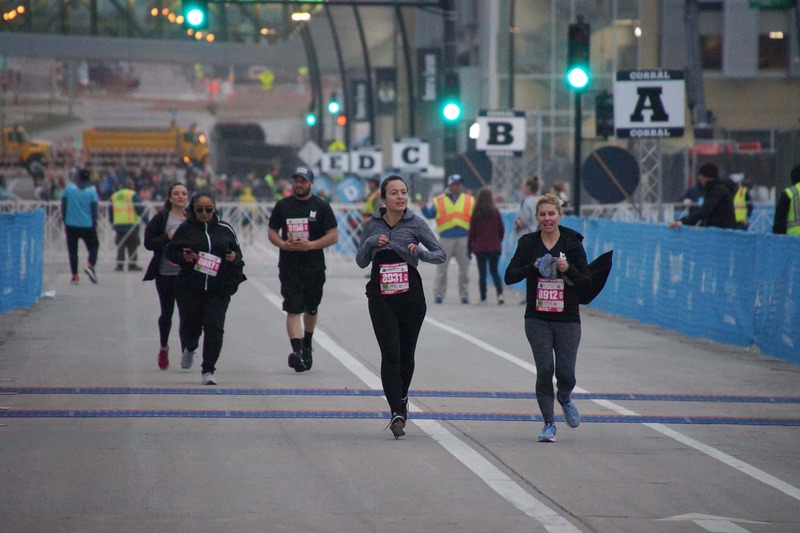 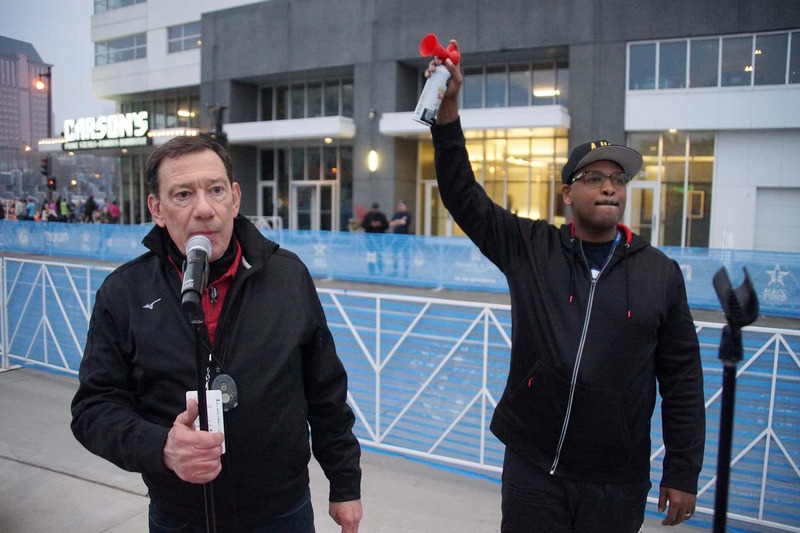 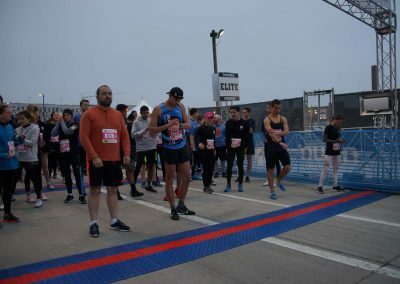 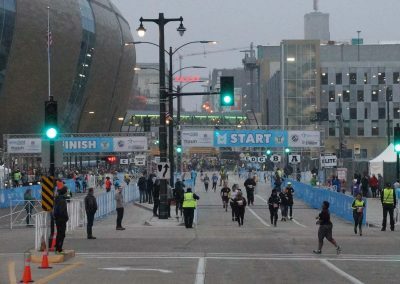 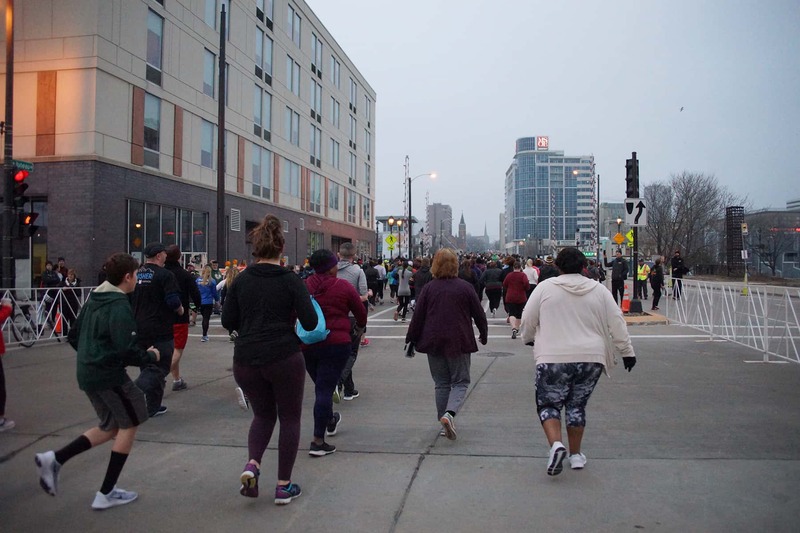 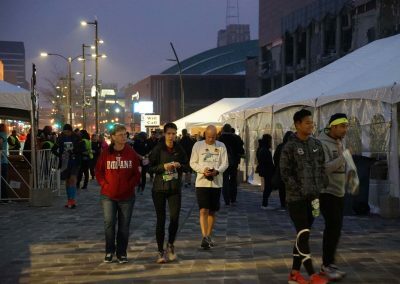 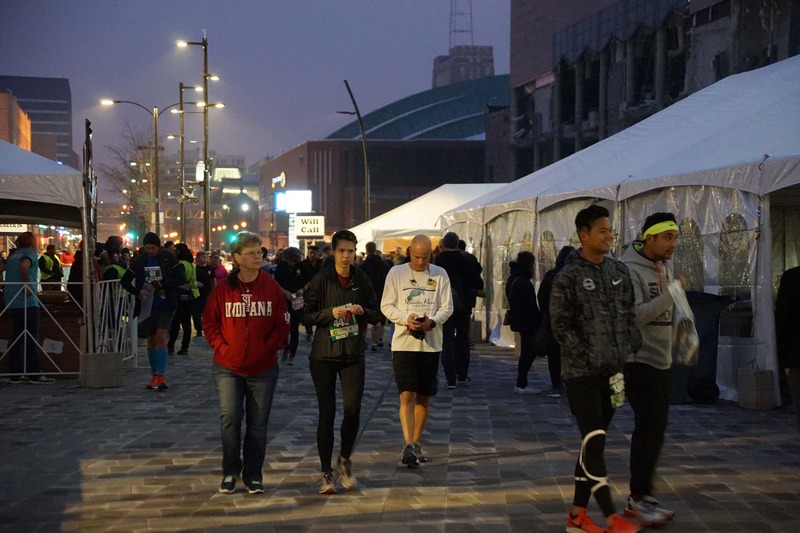 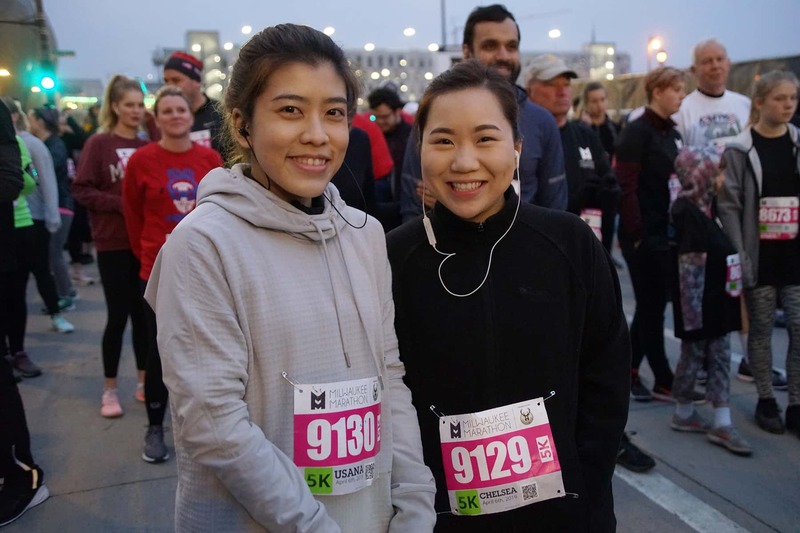 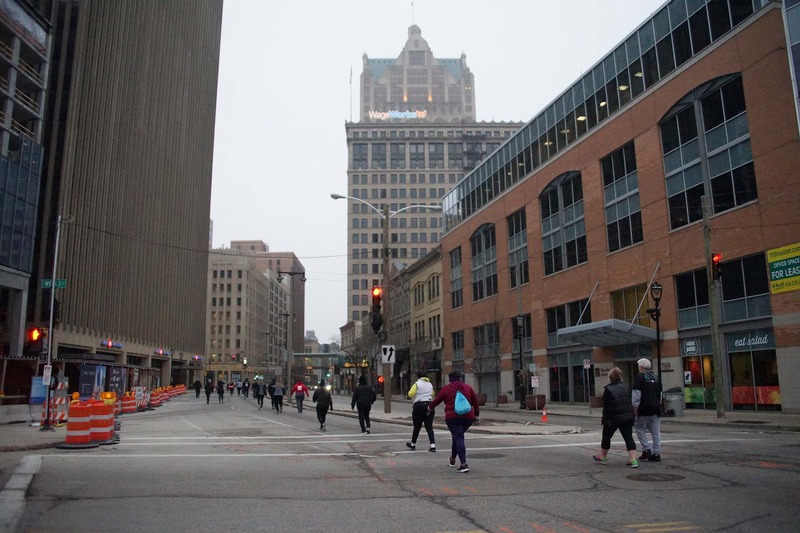 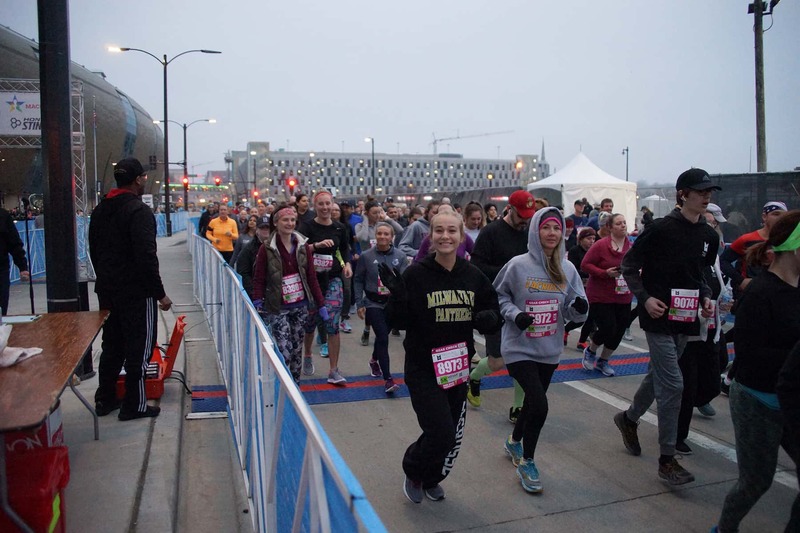 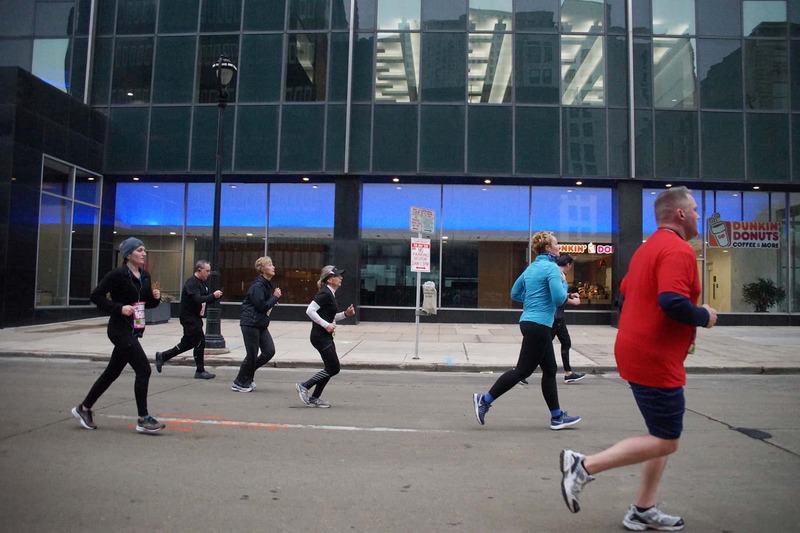 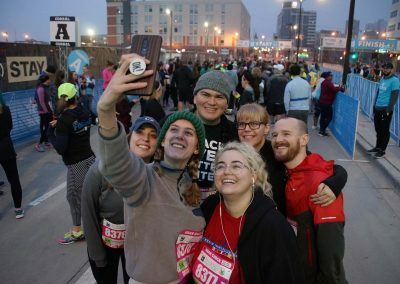 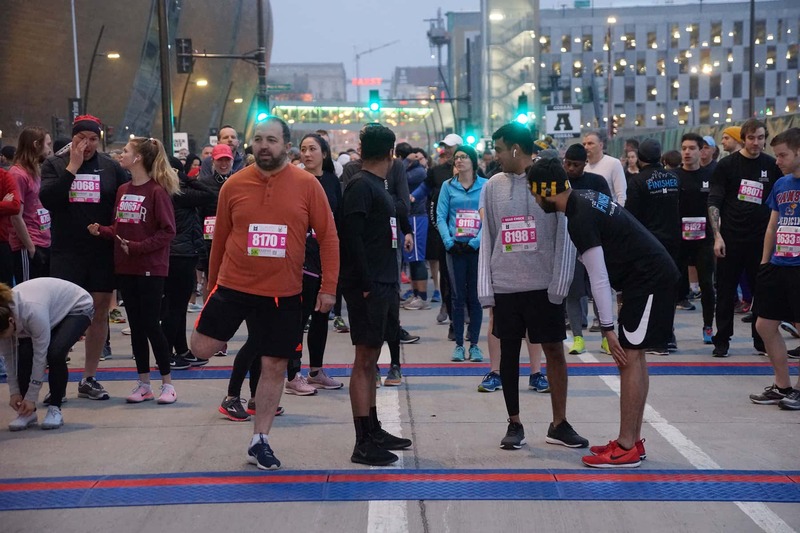 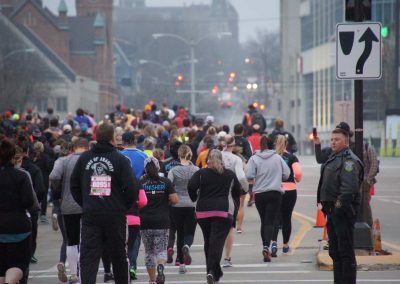 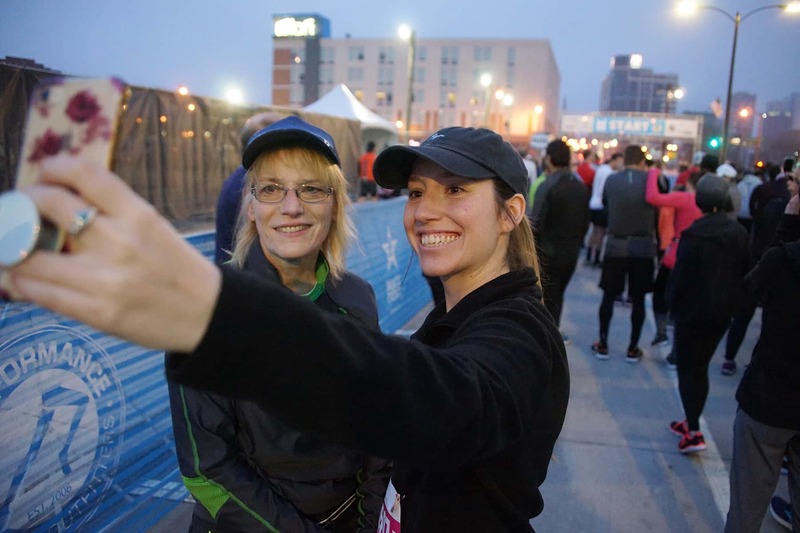 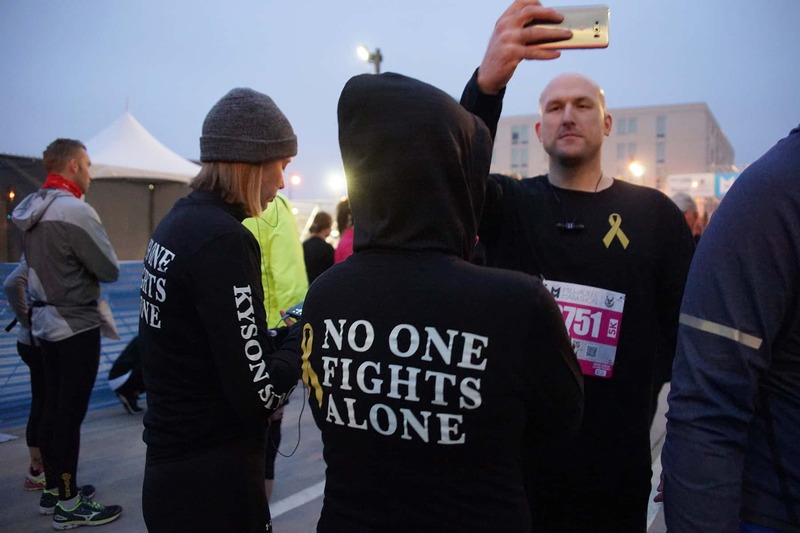 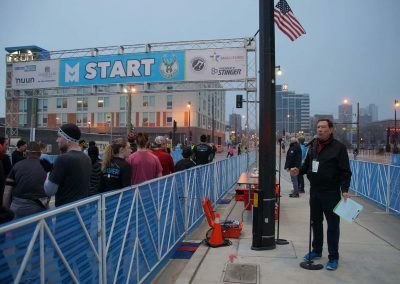 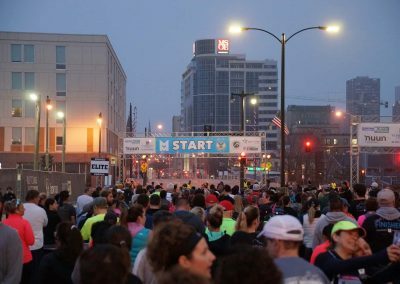 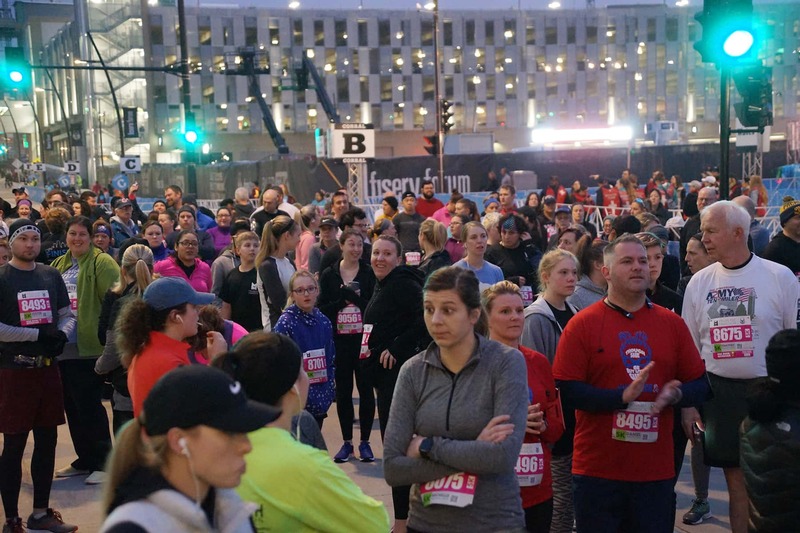 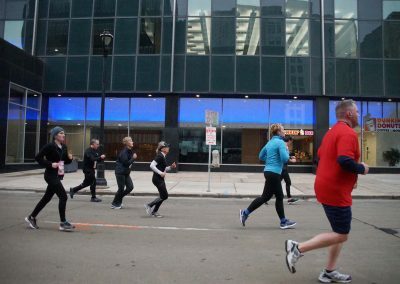 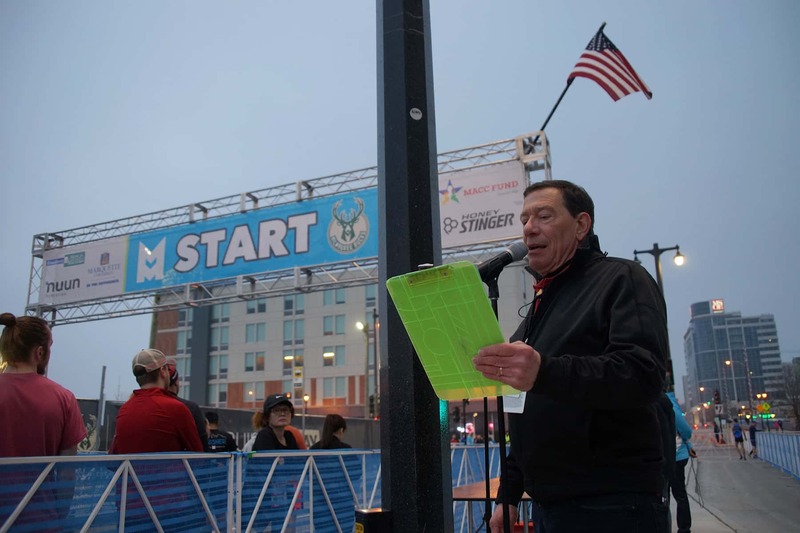 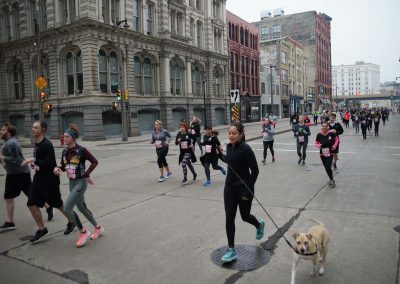 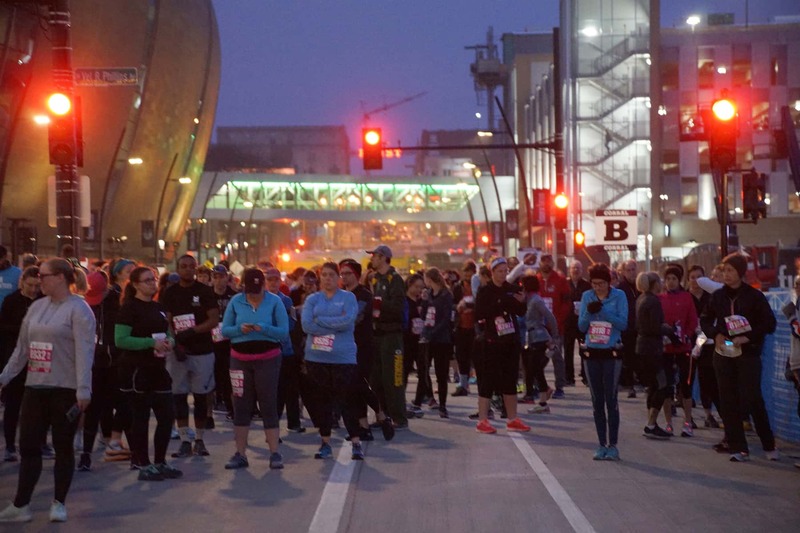 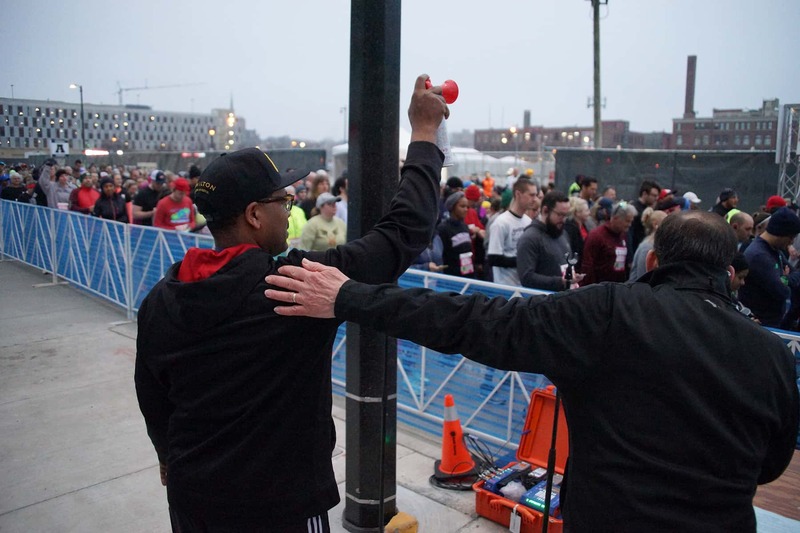 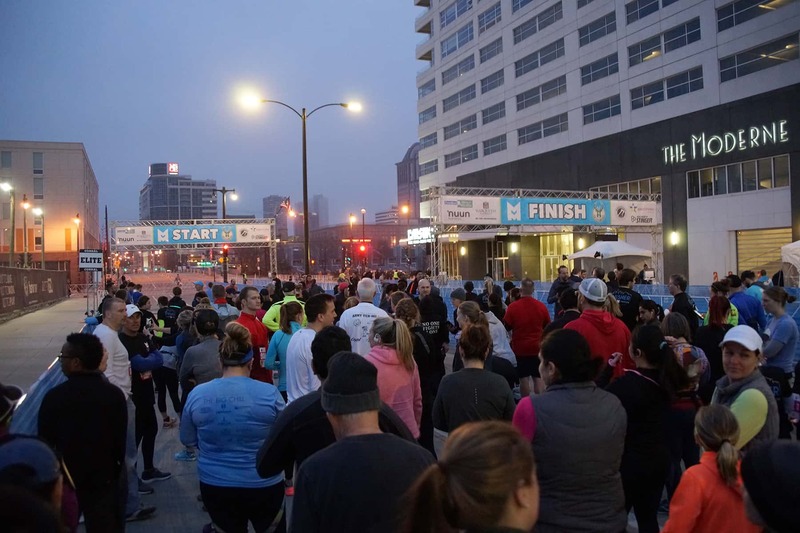 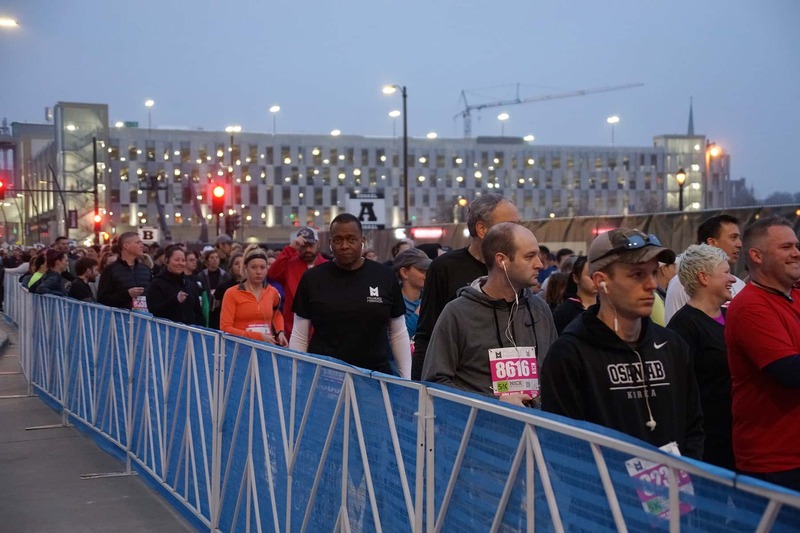 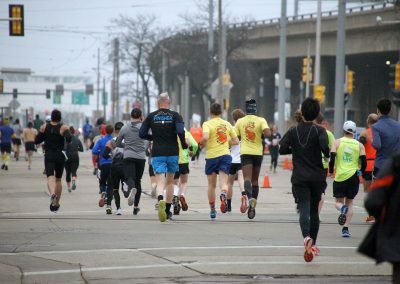 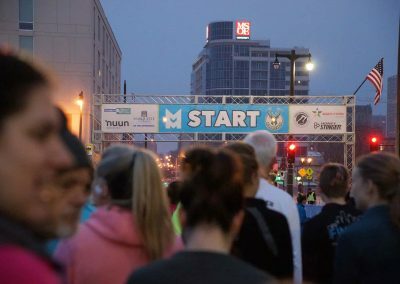 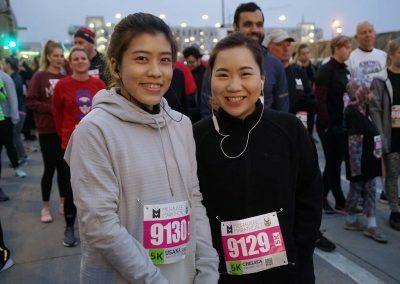 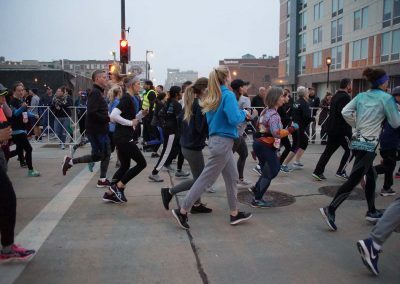 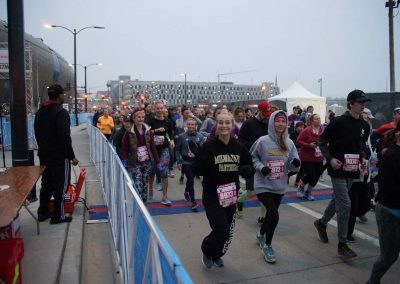 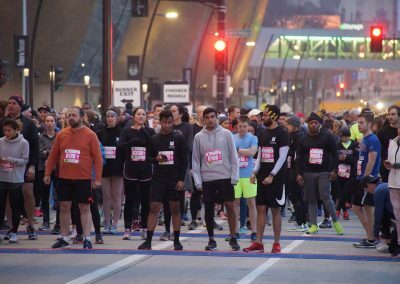 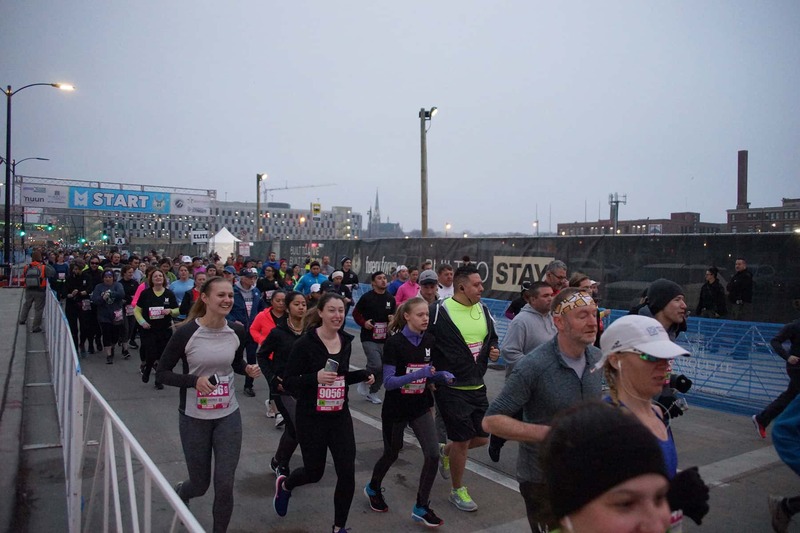 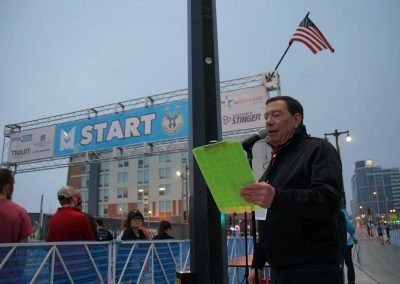 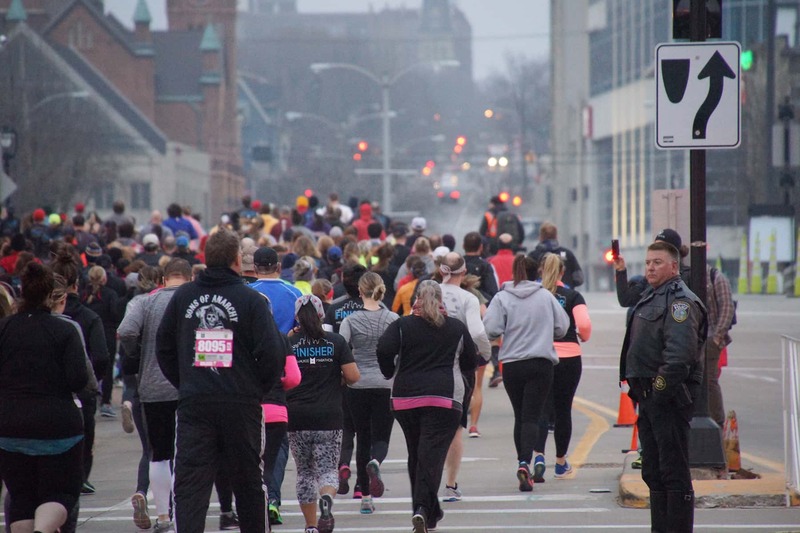 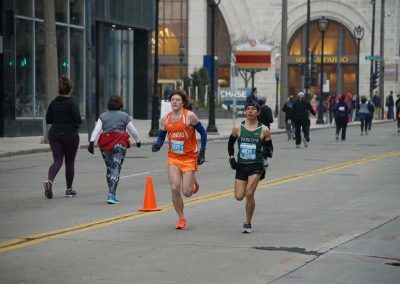 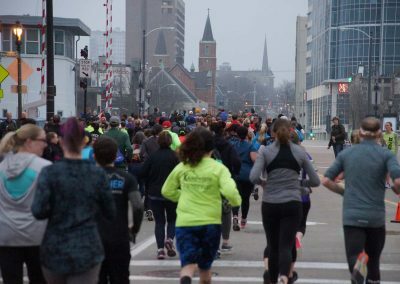 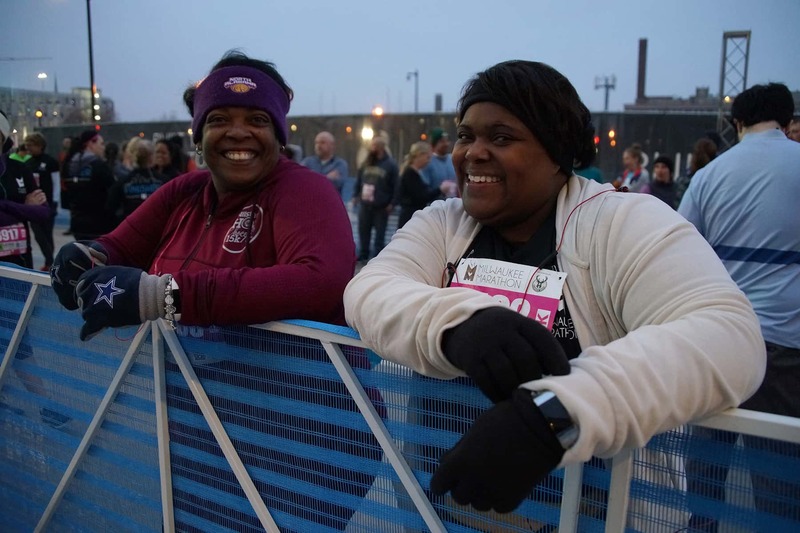 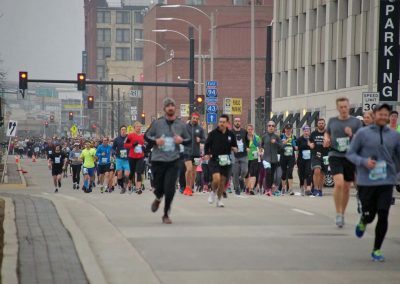 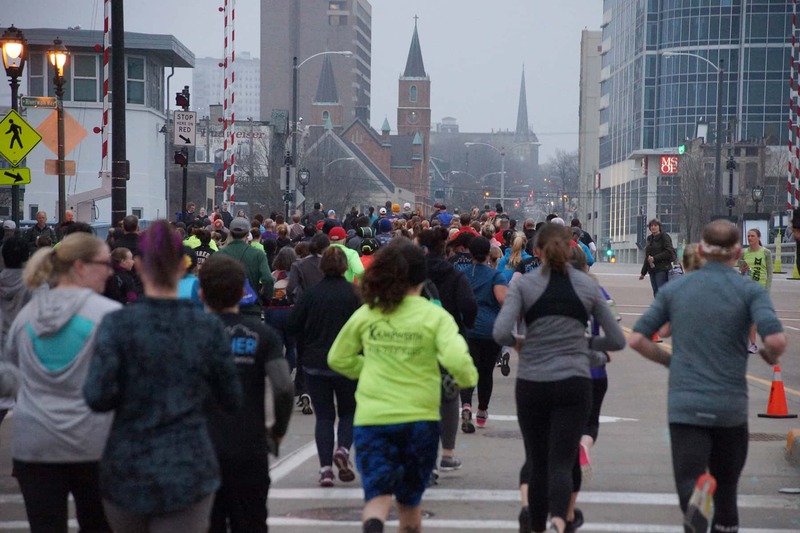 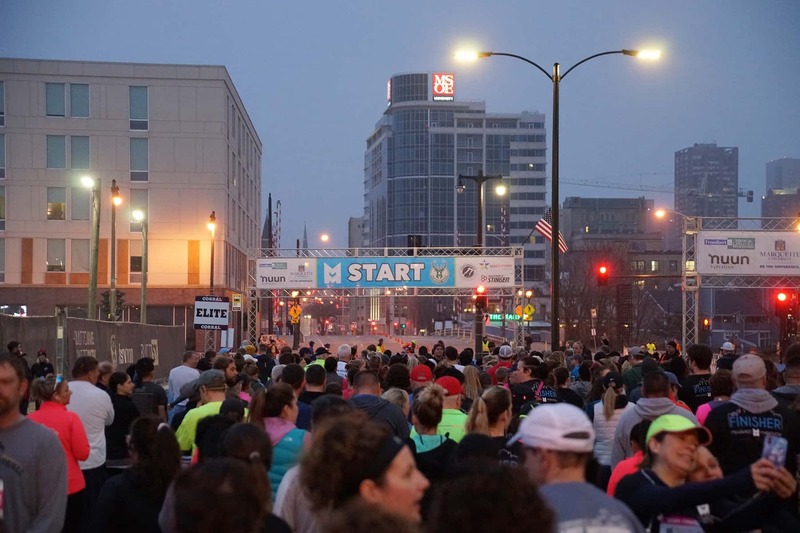 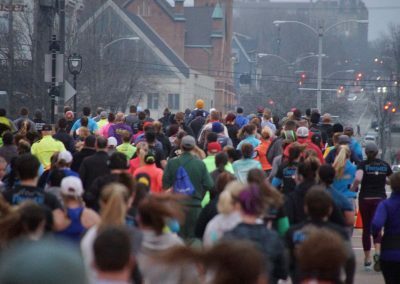 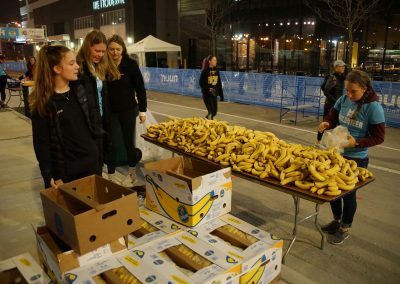 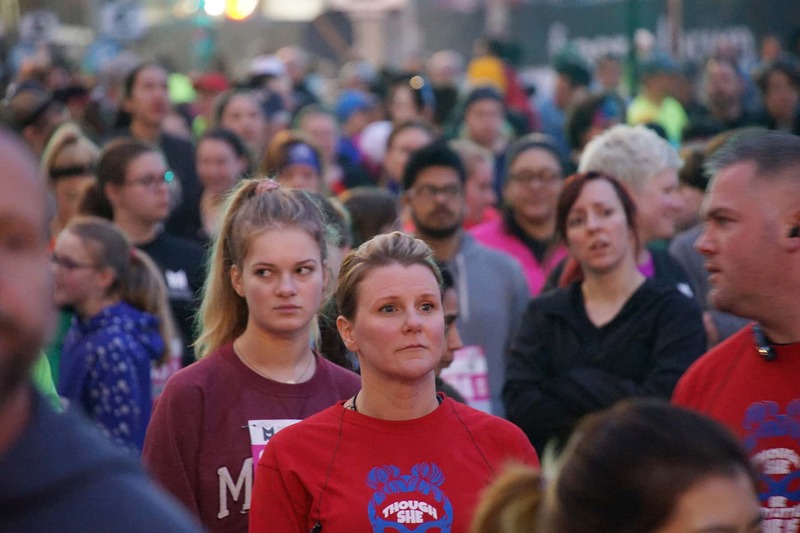 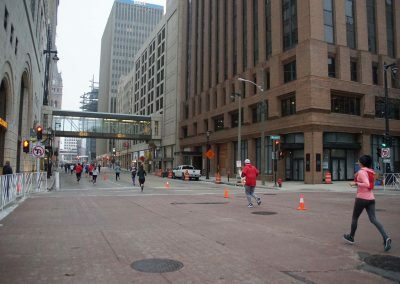 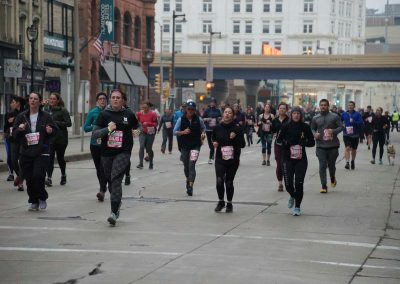 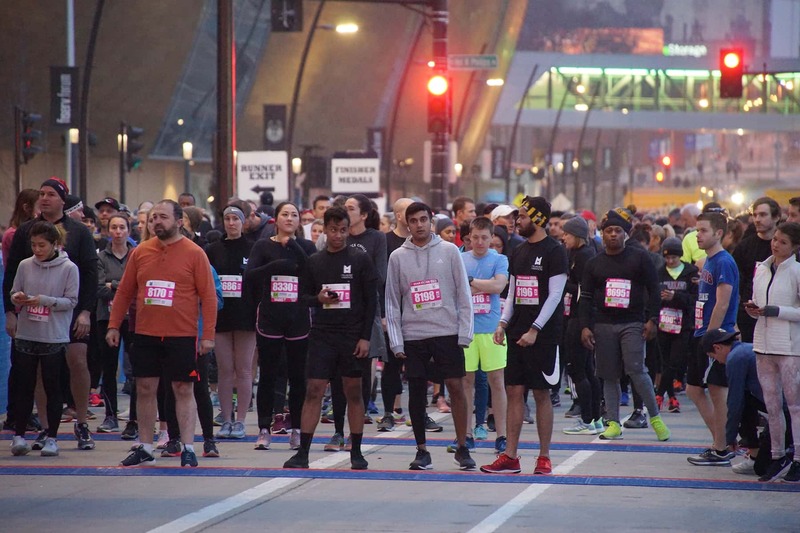 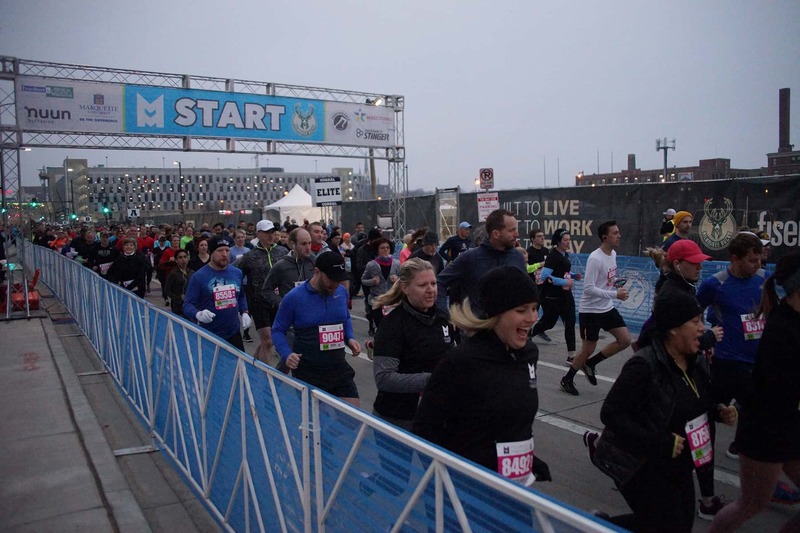 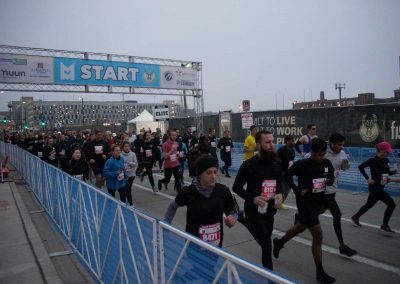 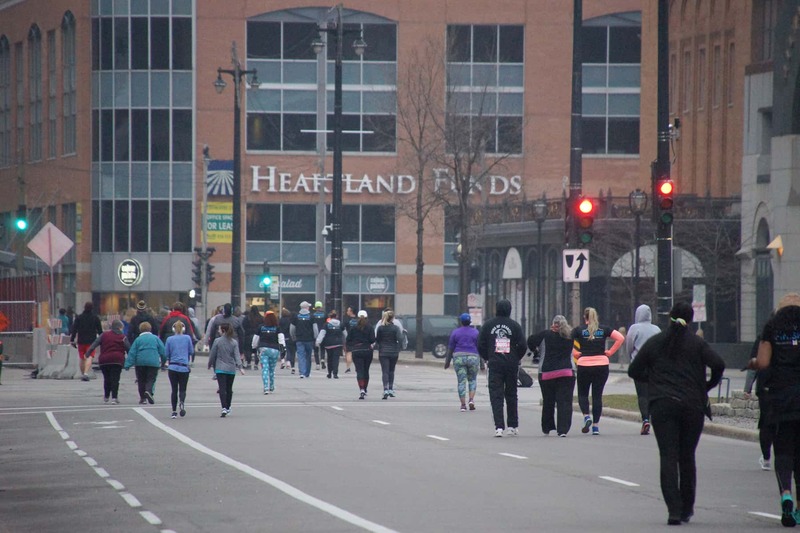 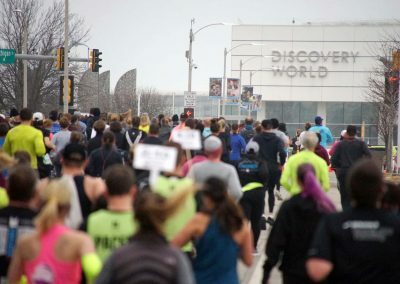 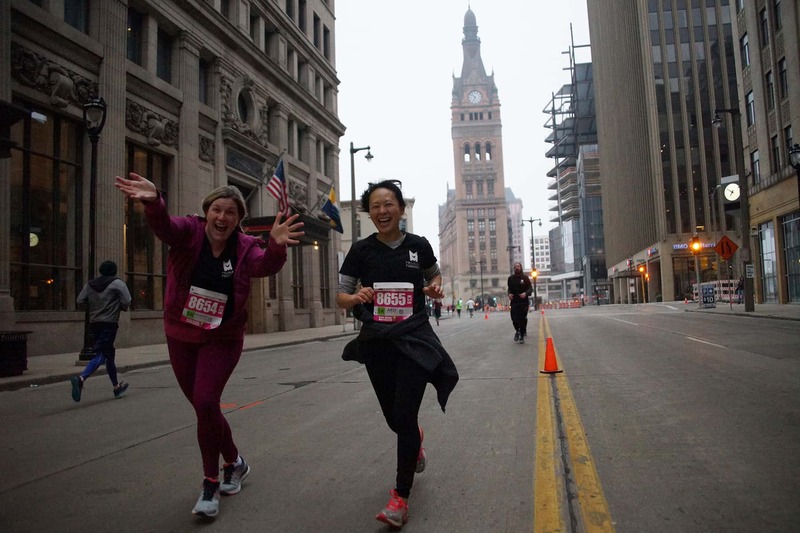 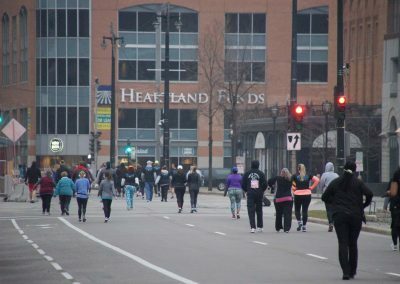 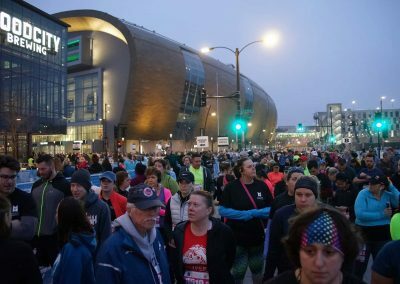 The 5K race started just before sunrise under ideal weather conditions, and after the marathon concluded a race-themed festival was staged at the Fiserv Plaza. 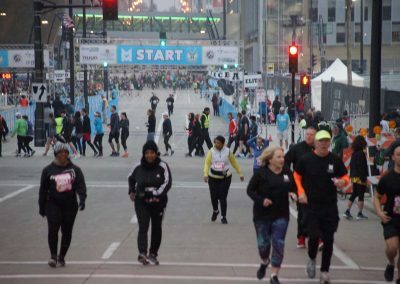 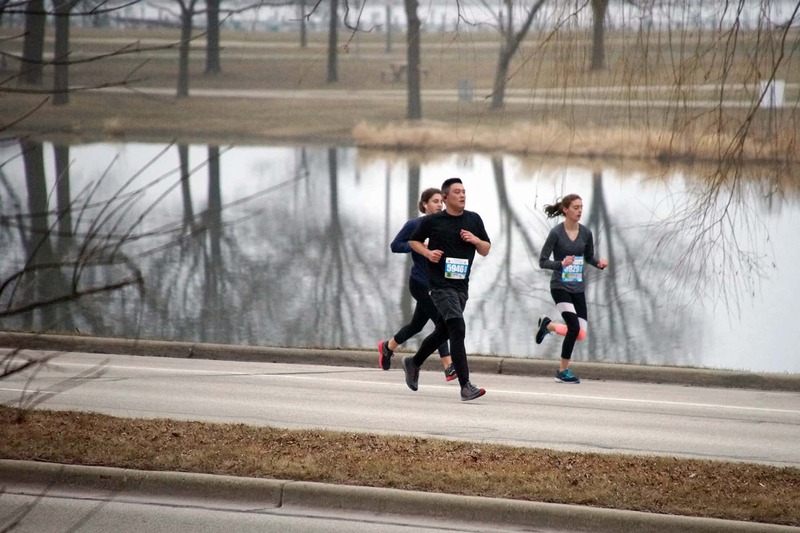 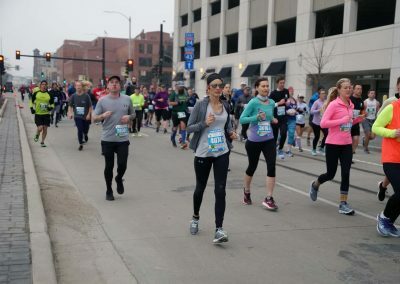 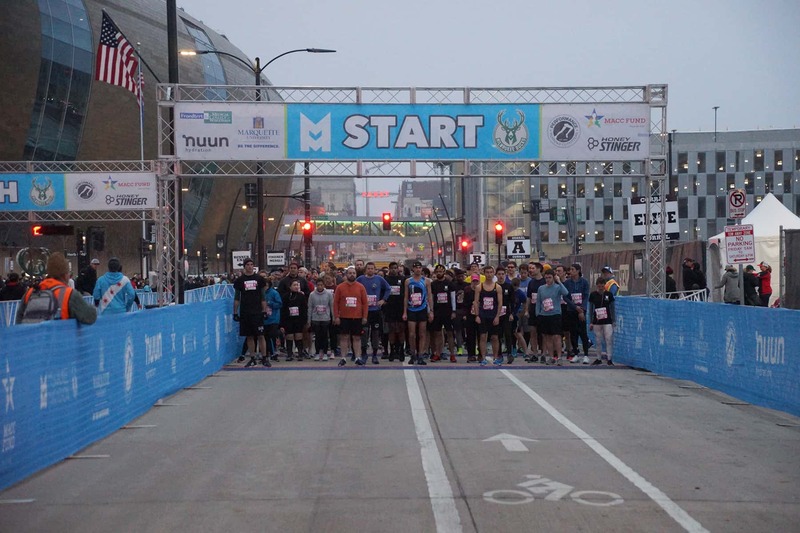 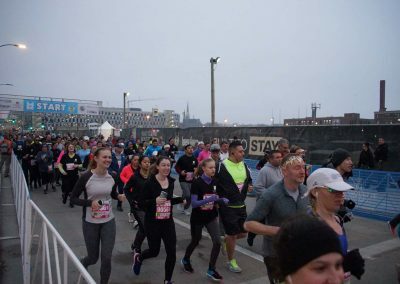 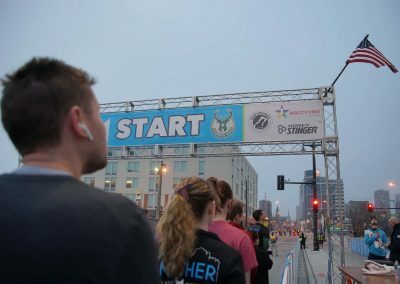 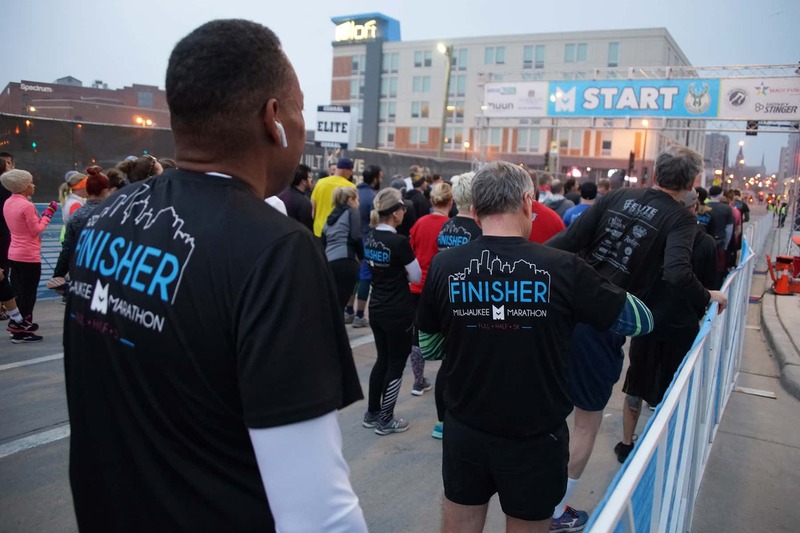 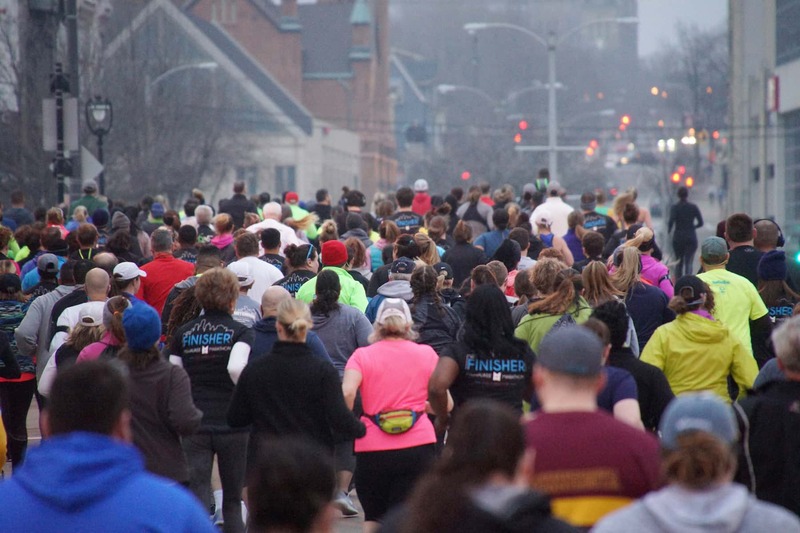 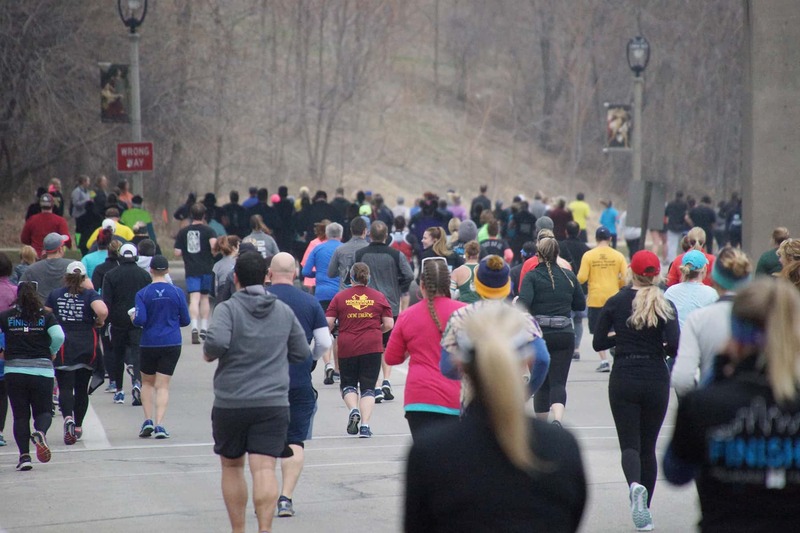 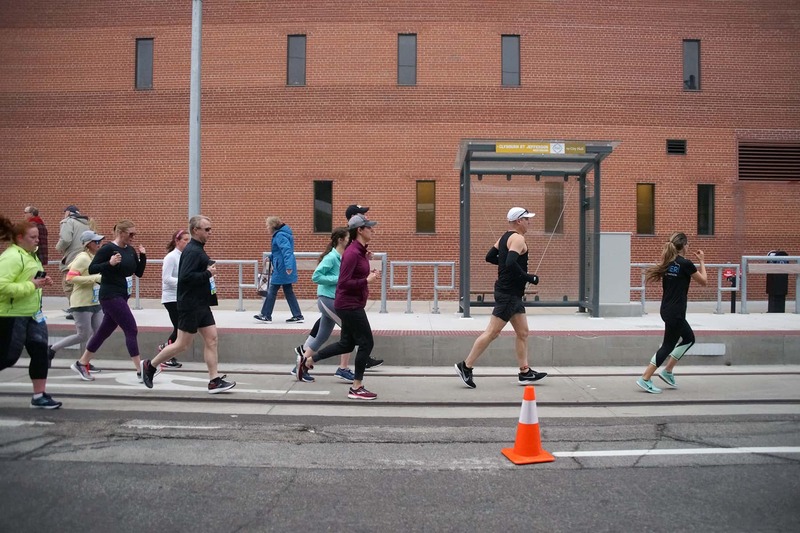 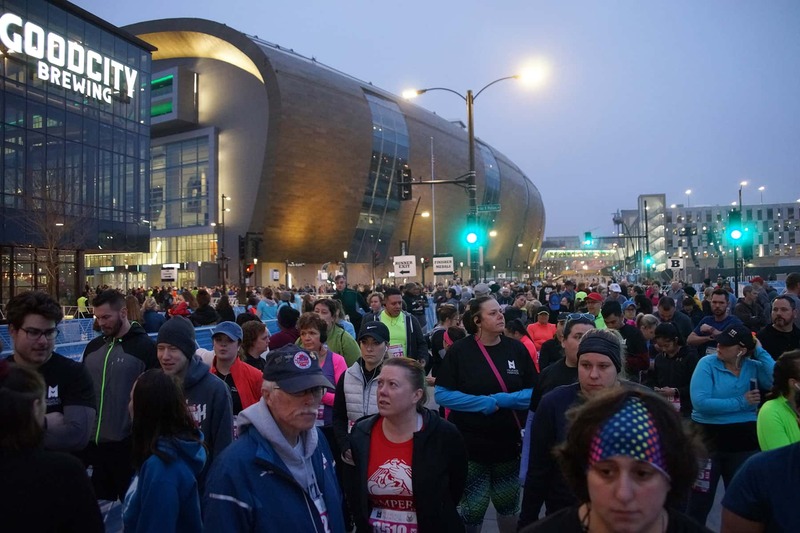 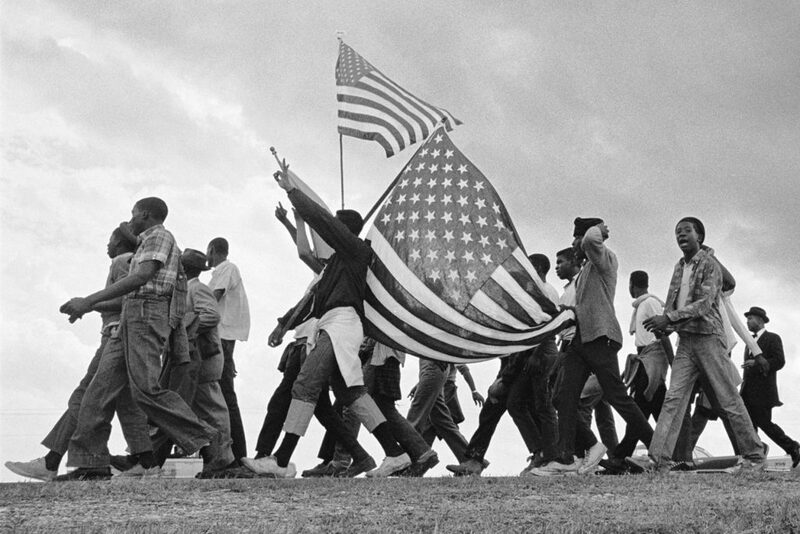 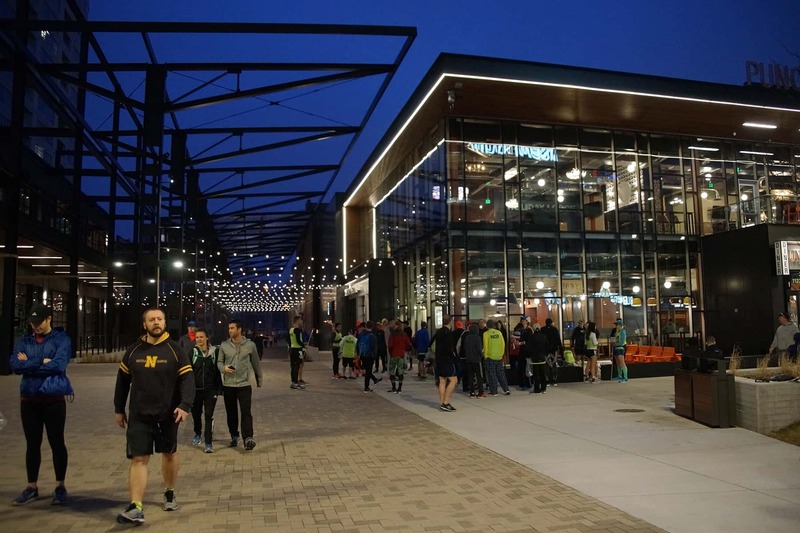 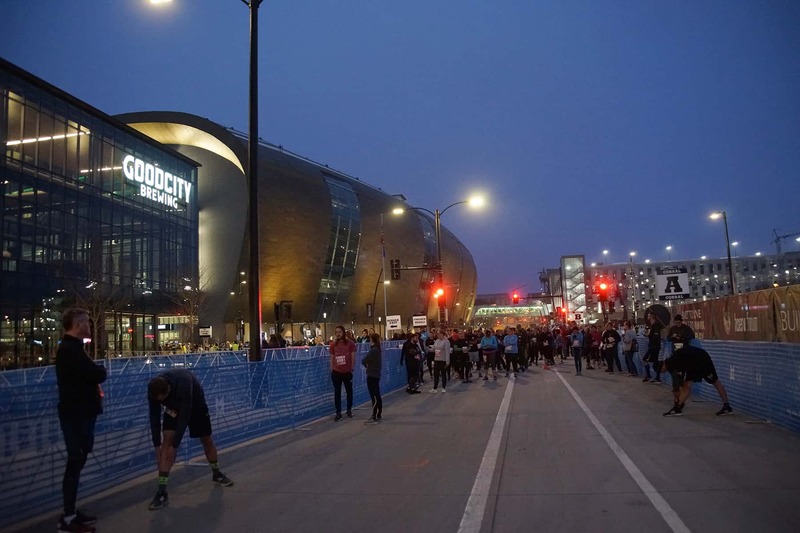 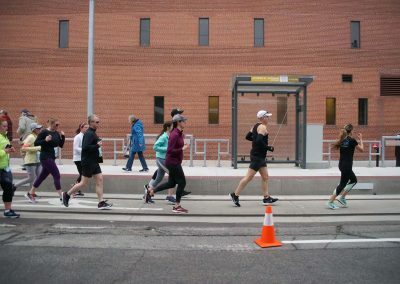 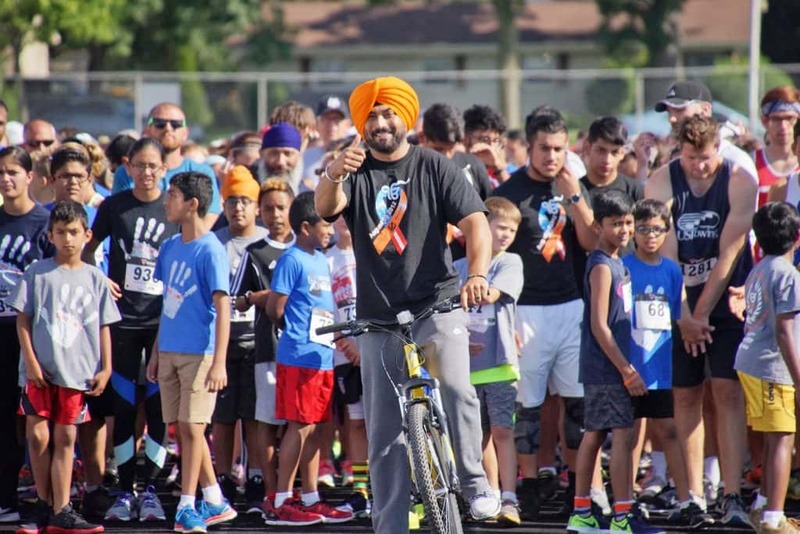 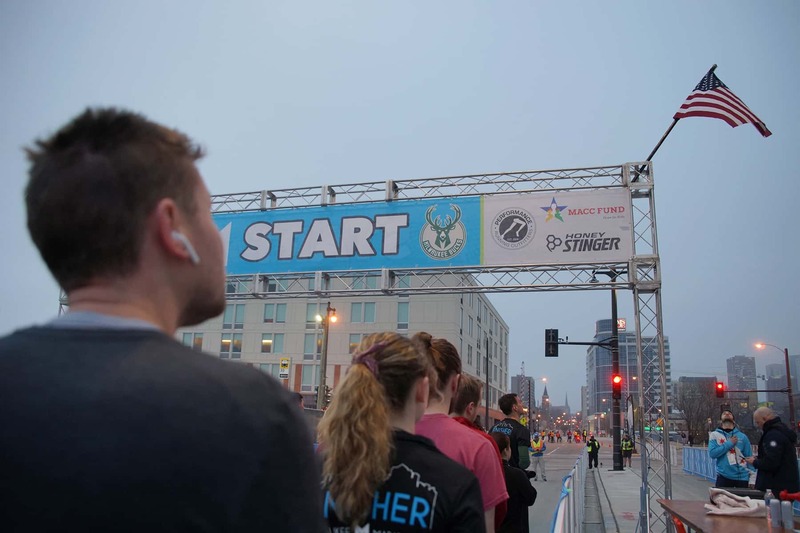 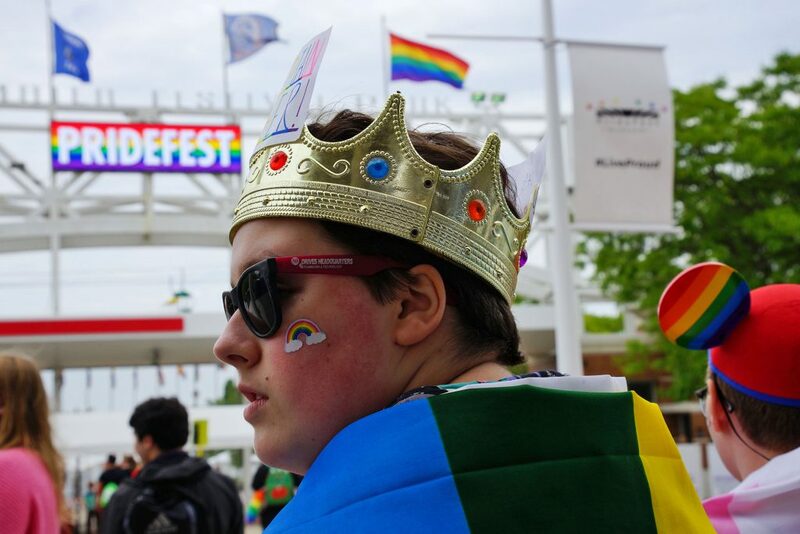 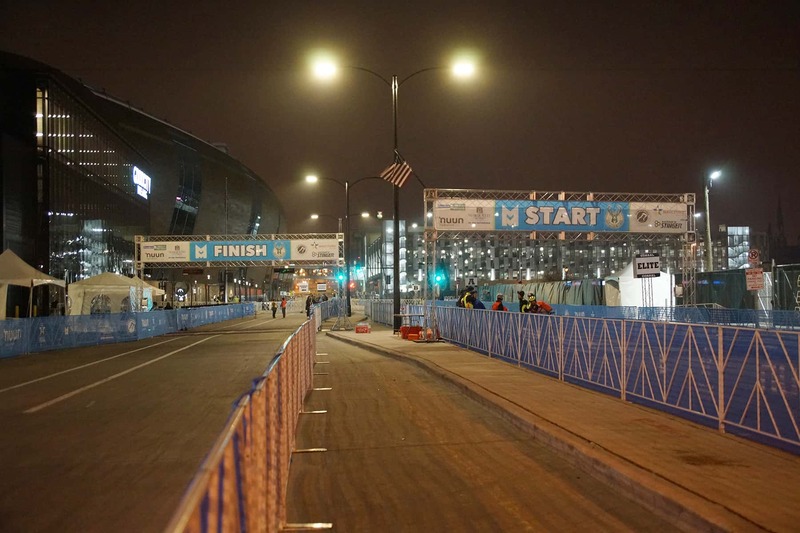 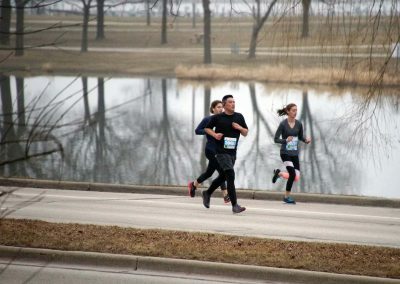 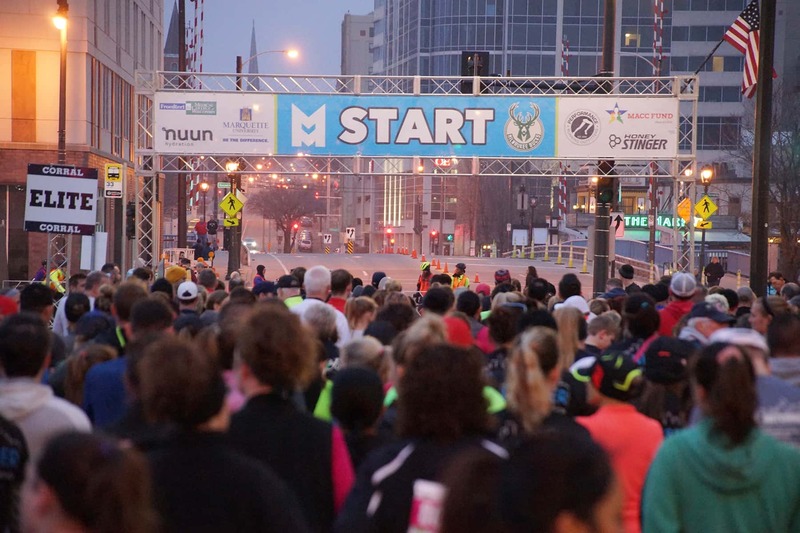 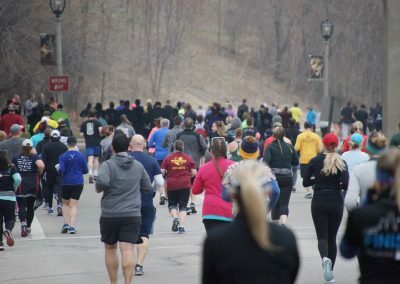 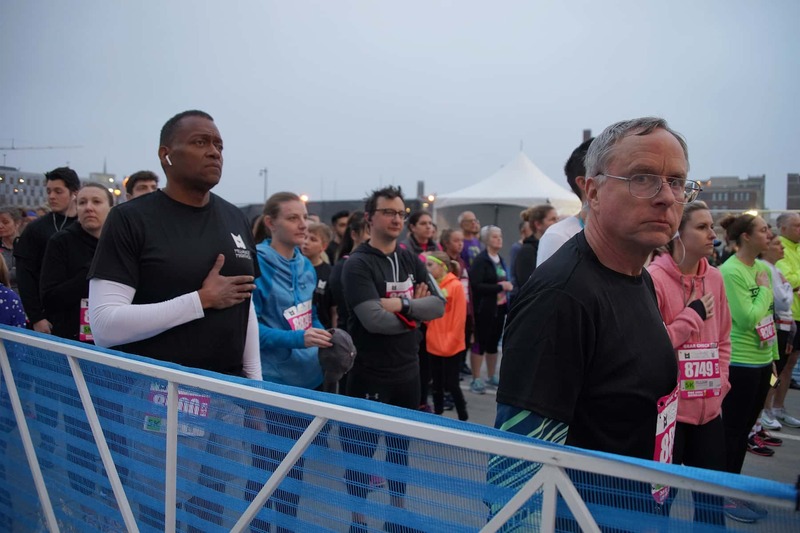 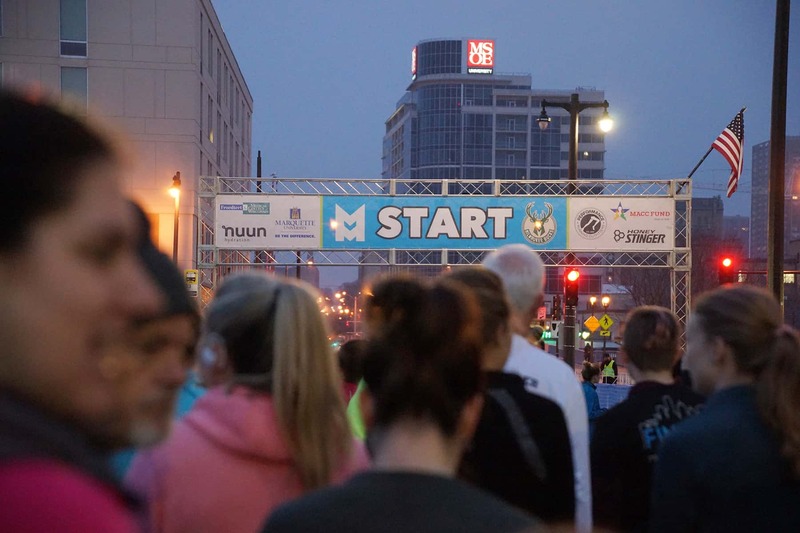 2019 is the fourth citywide race, and each year has had a different starting line, with the Summerfest grounds, Veteran’s Park, and Third Ward being used previously. 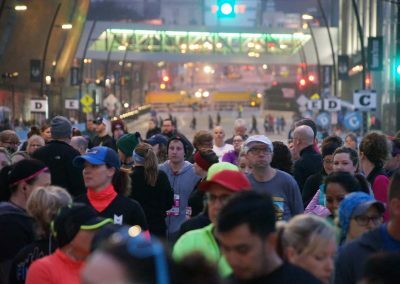 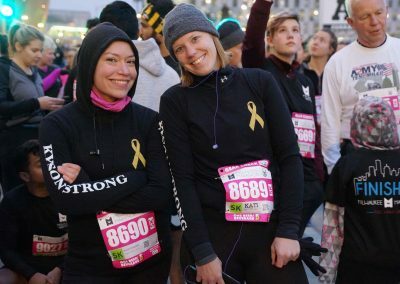 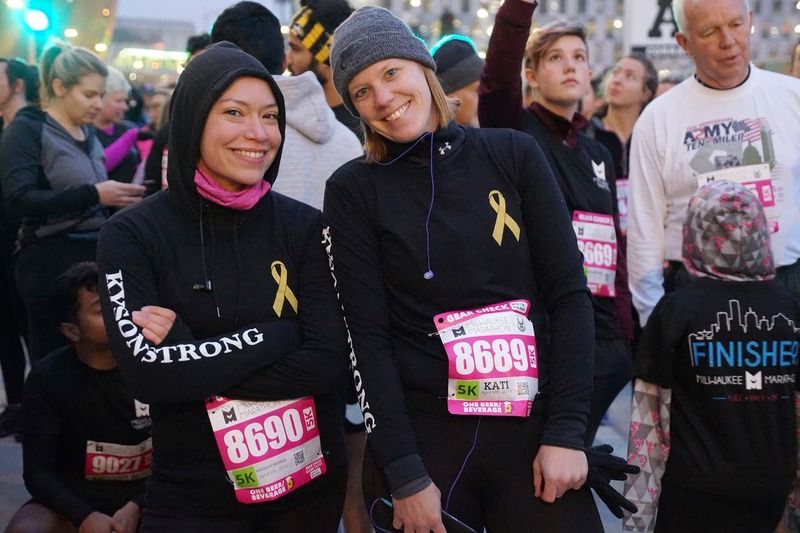 These images highlight participants in the 5K, Half, and Full Marathon races, but only covers the 5K and Half Marathon route.